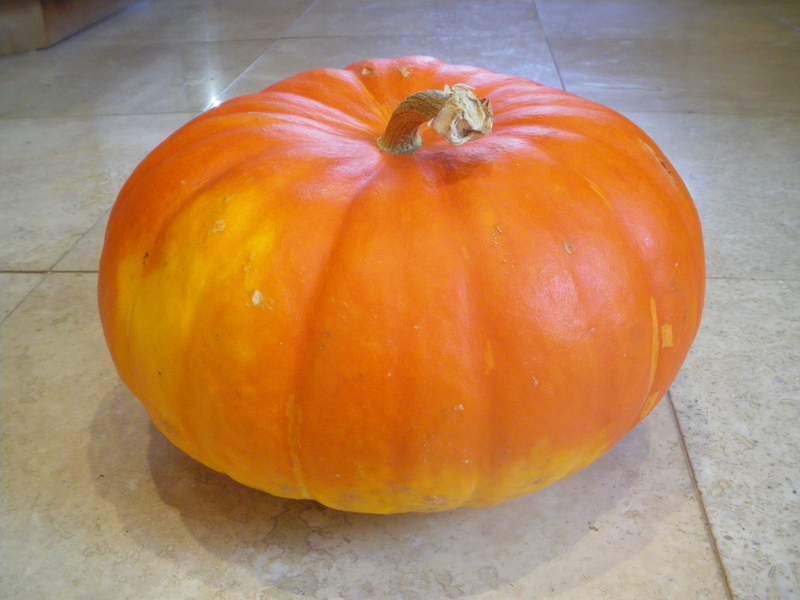 The Cooking Frog's Blog | What's cooking today? This recipe makes for a very festive roast with original flavours without taking too much time to prepare. I seem to find this cut of pork easily around Christmas and Easter locally but any good butcher should be able to cut one for you. You will need one bone, that is one chop, per person as a rule. 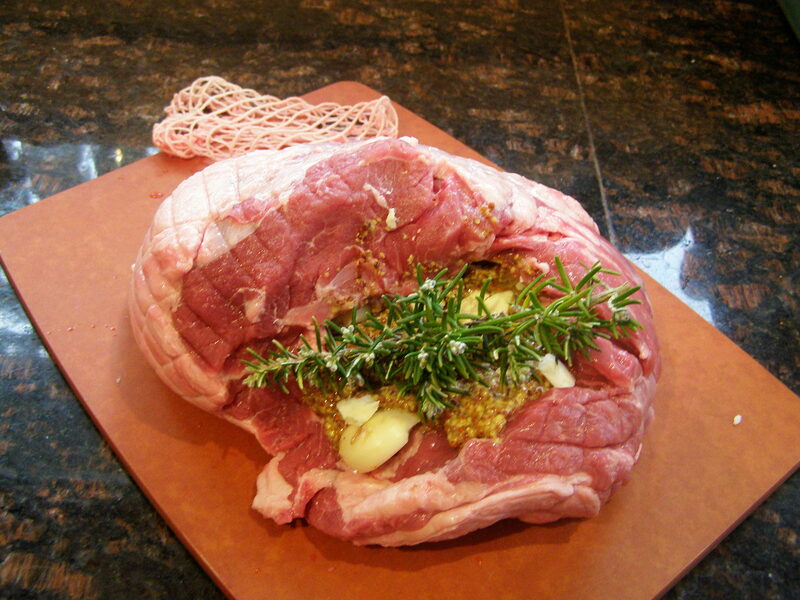 Of course, it is not possible to stuff a crown roast so instead you can infuse it through the fat with a paste of lemon and herbs. It will create a crispy edible crust. First step is to place the roast in a large greased roasting pan and to start a lattice pattern of cuts into the fat on the flat bone side of the chops. The cuts don’t have to be very deep but close together. Basically the finest grid you can do with a sharp knife. Then, make a paste in the food processor or by hand, with the juice of a lemon, 8 leaves of sage, a tsp of oregano, a tsp of thyme, a few leaves of Rosemary, one or two cloves of garlic, two tablespoons of BBQ sauce, one tablespoon olive oil and the rind of 1/4 lemon. Apply on the meat and cover thoroughly. Roast at 425 no convection for 20 minutes or as soon as nicely brown, then turn down to 325 for 20 minutes. At this point, throw out all the fat at the bottom of the pan and add a 1/2 cup of water. Put back in the oven for another 20 minutes with the oven off. The meat will be very tender this way. Carve and serve on hot plates. 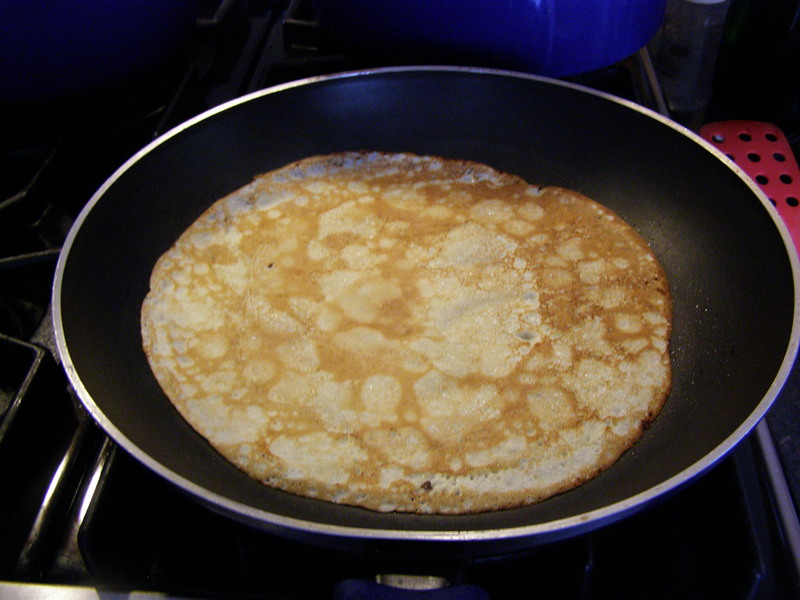 You can eat the crust and the jus at the bottom of the pan as most of the fat has melted and has been thrown away. If the meat does not feel hot enough after carving, turn the oven back on for 3 minutes on 350. 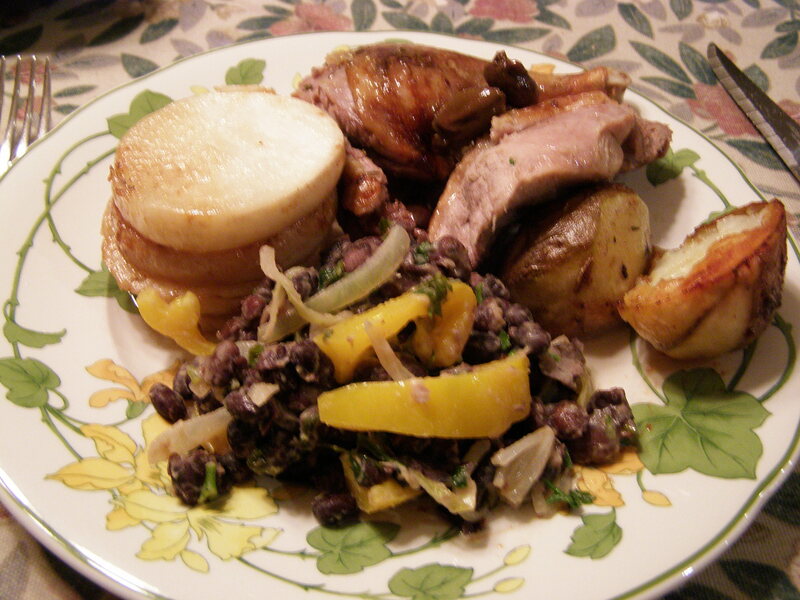 This recipe was inspired from my friend Sharon’s Easter leg of lamb done more or less in the same fashion. 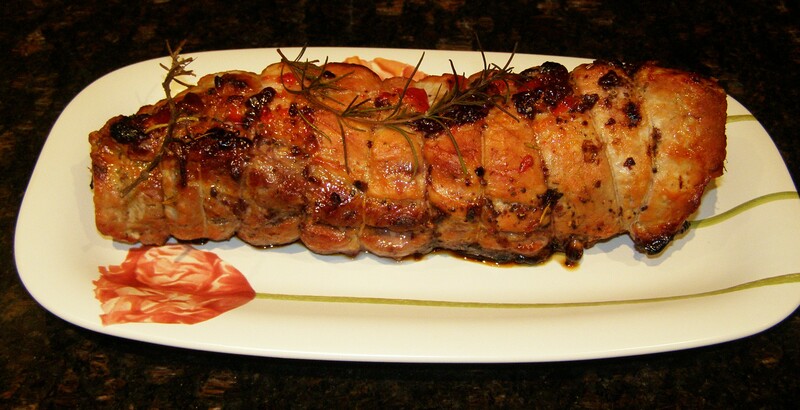 Lamb can be enhanced with mint and rosemary instead, or thyme and oregano. Garlic called for in all variances. 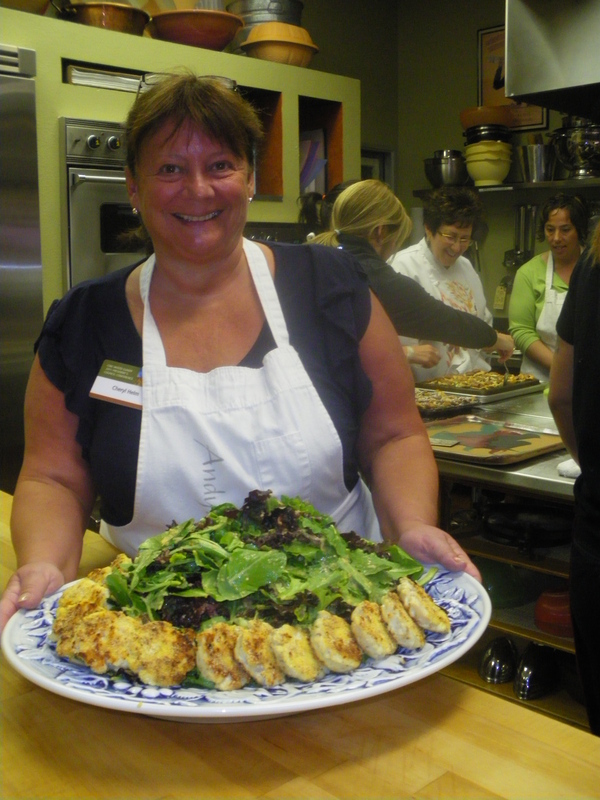 This could be an easy recipe for occasional cooks to impress on Mother’s day! Hint, hint! This recipe was written down by Katherine Jones of Victoria at my request after I served her Chutney at a dinner and all the guests wanted to know about the ingredients, not believing me that it was apple chutney. 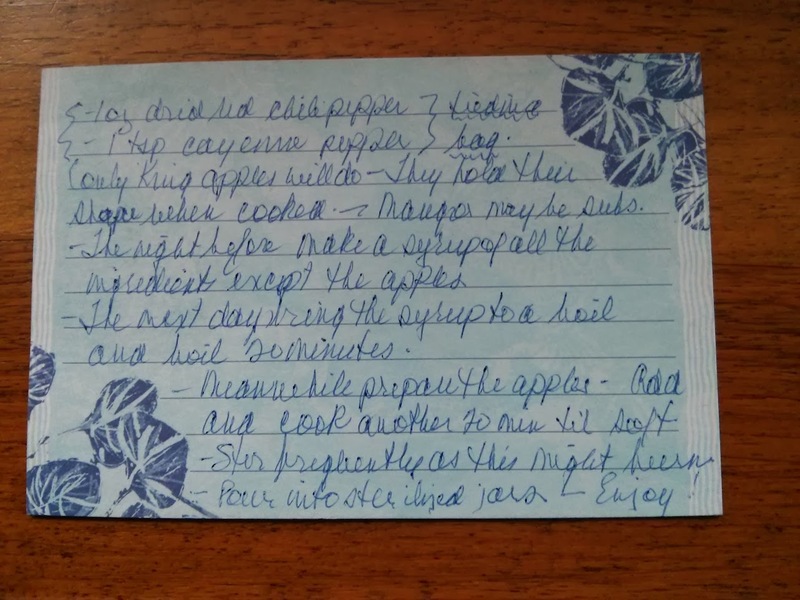 She was kind enough to take the time and she also added that this recipe calls specifically for King apples and that if you need a substitute, it should be mangoes and not other apple varieties. Mrs Jones , of course, has no trouble acquiring King apples as she grows the trees on her property. It all started about a month ago, Valentine’s day to be exact. I was serving dinner for three couples and the theme was red. So, there I was looking at a bag of split red lentils and wondering how to make them look more red. Raw, red lentils are at best an orangy color and cooked they are barely yellow. I was serving chicken Tandoori and to avoid any flavour clash, especially on that day, it seemed best to have the lentils “Tandoori” as well. It took a few attempts to perfect the recipe, hence the delay. But this a good one and I might even have it again with the Easter lamb in a couple weeks, so here is the post, I won’t keep you waiting until Valentine’s day 2014. 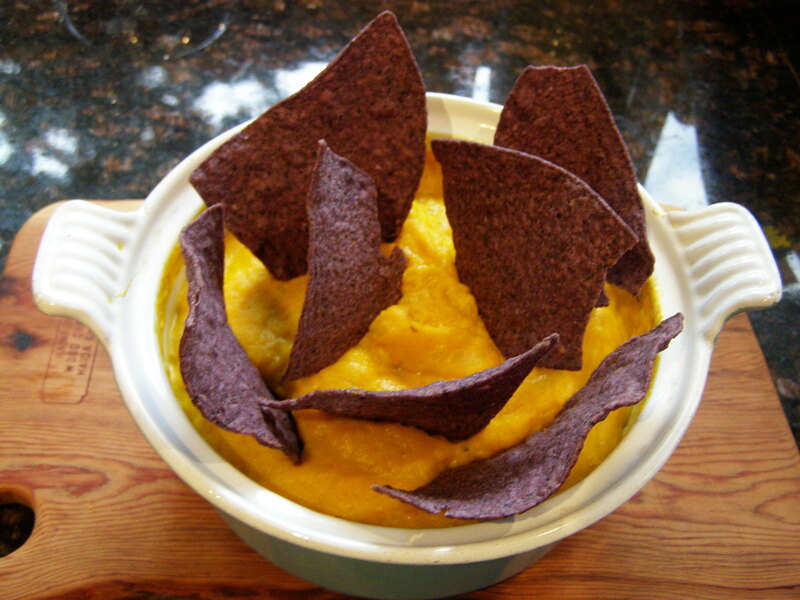 For six servings you will need to simmer 2+1/2 cups of pre-rinsed split red lentils (454 gr.) 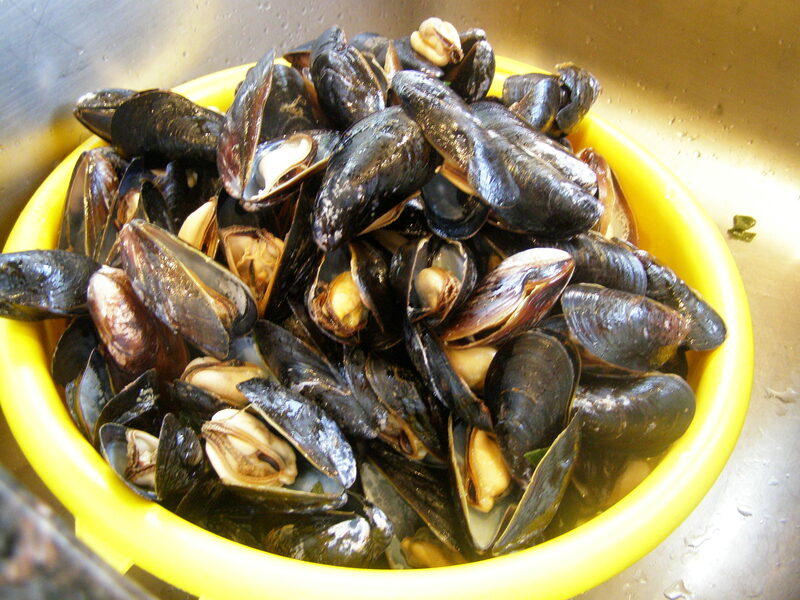 in 2 l salted water until they are cooked and fairly mushy, over 30 minutes. Add extra water if necessary. The lentils must be split and all red lentils. I have tried other mixes and it did not work as well, as the cooking times are very different and the texture of other lentils does not absorb the curry well. 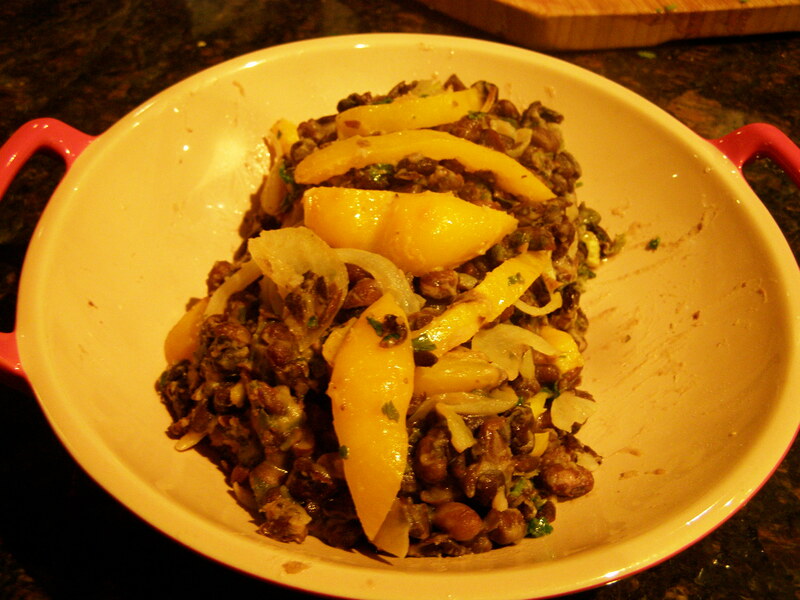 While the lentils cook, saute one onion and 2 diced Chinese eggplants in olive oil and simmer until soft. Add a crushed garlic clove just before it’s done. 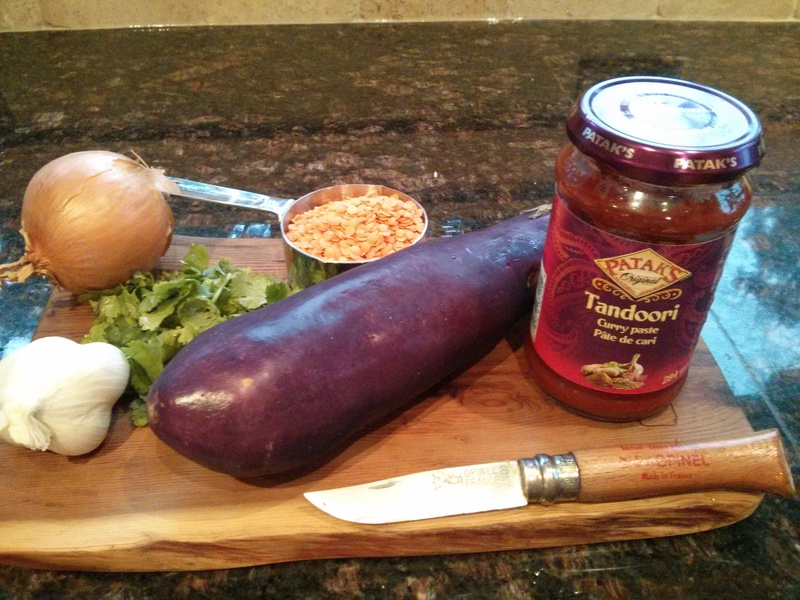 By now, the lentils should make a nice puree-like dish, add 1/3 of a jar of Patak’s Tandoori curry paste, stir, add the eggplant and onion and stir all together gently. Sprinkle with fresh chopped cilantro and enjoy. You can cook this the day before and re-heat it. In that case, add the cilantro just before eating. 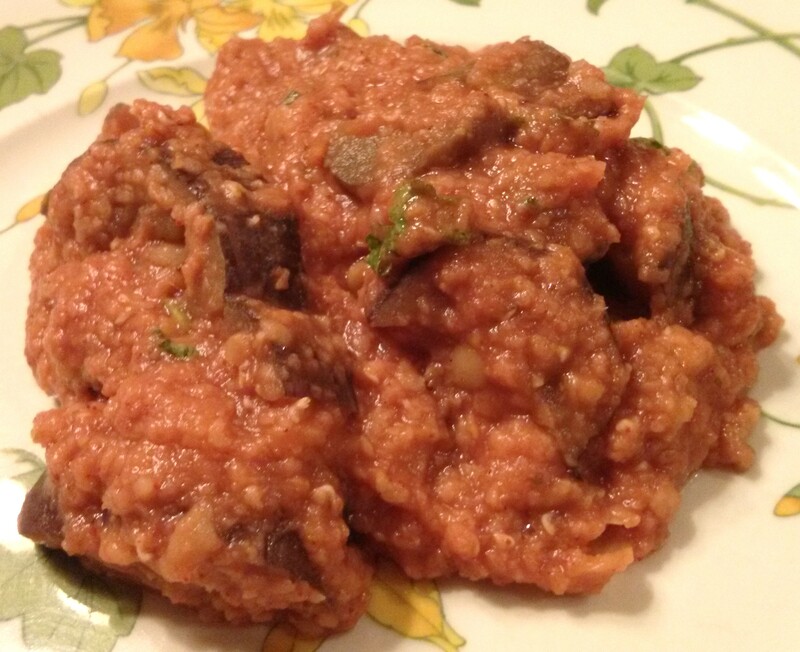 I recommend using Chinese eggplant with the skin as they hold up well diced and don’t have too many seeds. I split them lengthwise and then slice them about 1/2 inch thick. I thought nothing of driving 6856 km from Victoria, BC to Key West, Fl. 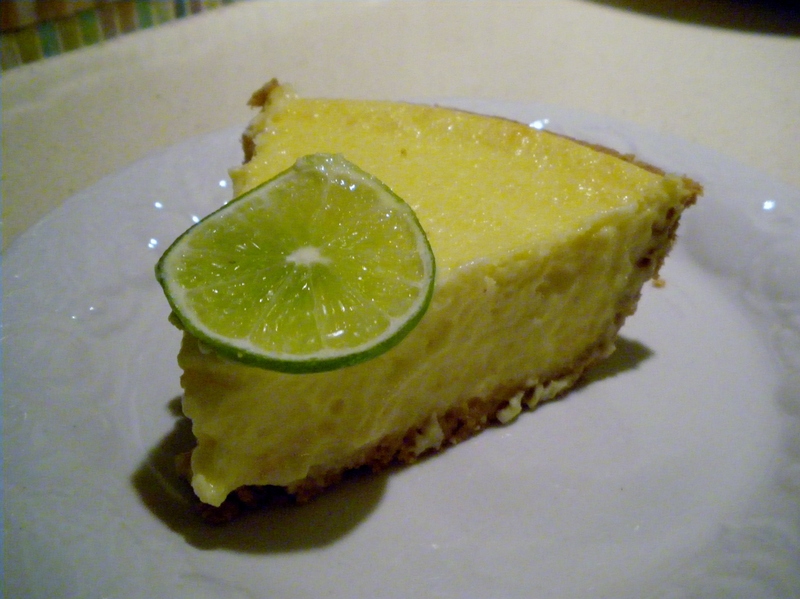 in order to find an authentic Key lime pie, and the key, I discovered talking to the local experts, is the lime. 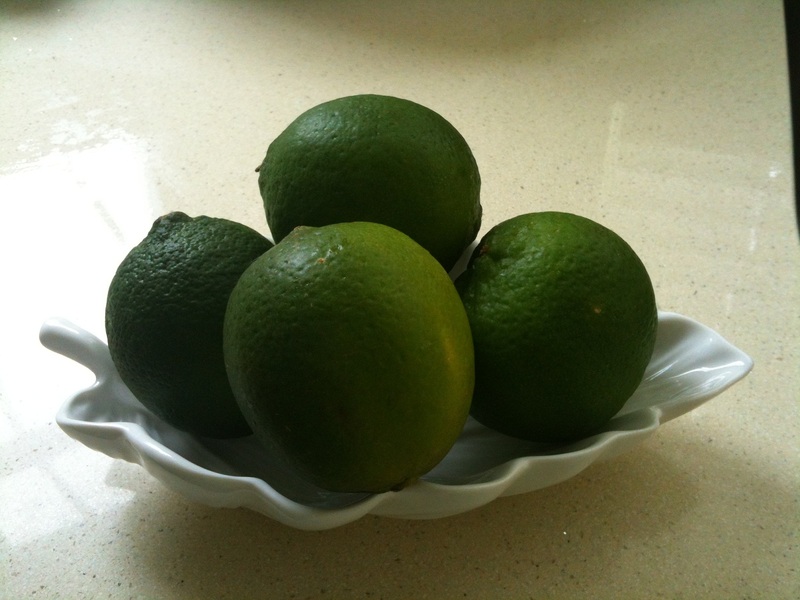 You must use authentic Key lime (citrus aurantifolia), not the more common, bigger, greener, sweeter, cheaper Persian limes which were introduced in Key West after the native Key lime was destroyed and eradicated by a hurricane in 1926. Certainly, Key lime on the label does not mean grown in Florida as I have found that in January, there are no Florida-grown limes anywhere. 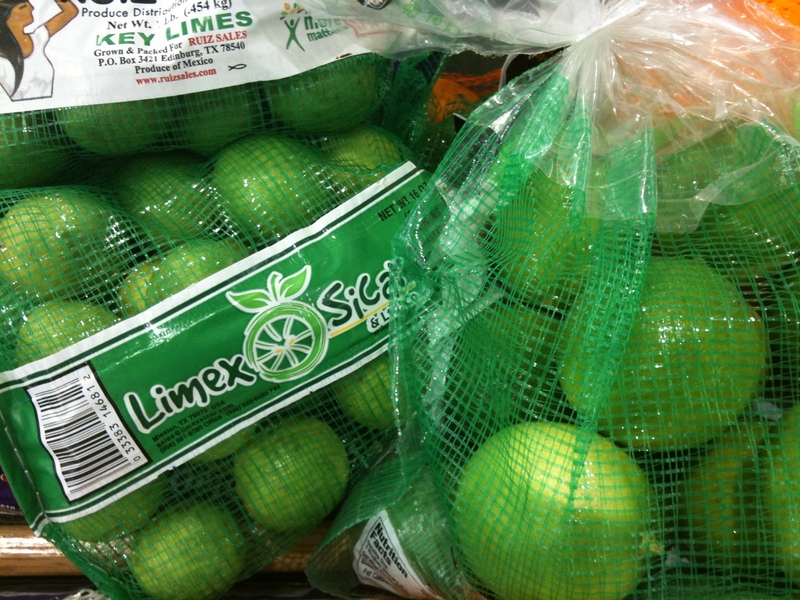 Both the Key lime and the Persian lime varieties come from Mexico. 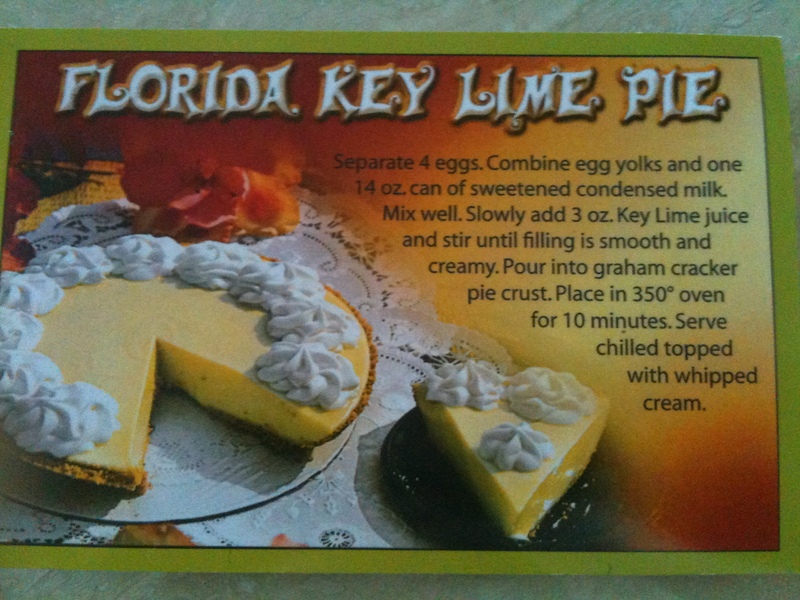 It is usually best to keep recipes simple, so I will follow the directions of the Key West Key lime pie recipe postcard. 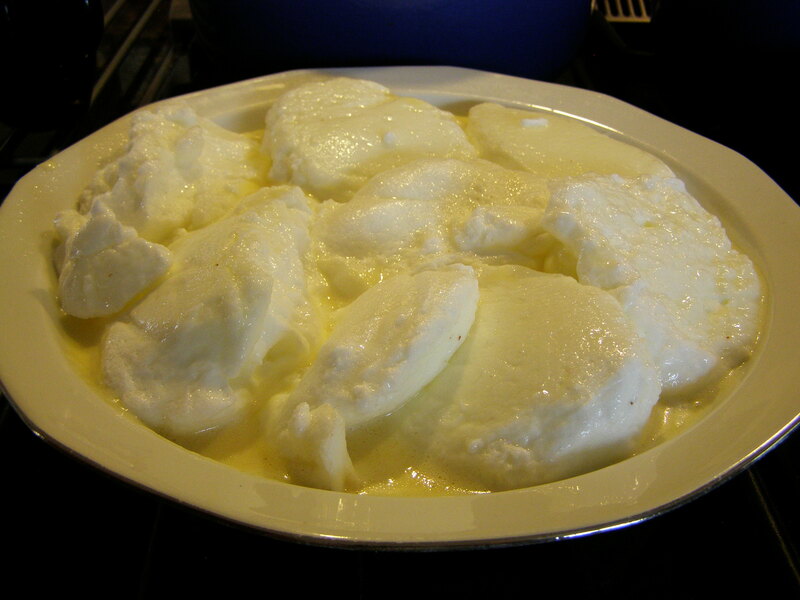 It calls for 1/2 cup of lime juice, a can of sweetened condensed milk, 4 large egg yolks. They say to mix the yolks and the condensed milk and to add the juice slowly stirring until the filling is smooth and creamy. At this point, you have 3 options, the postcard has no use for the egg whites, some recipes use them to make a light meringue to cover the filling, but I chose to beat 3 of them hard and to gently mix them into the filling at the end. After that, pour the filling in a graham cracker crust and cook for about 25 minutes at 350 F. Check with the tip of a knife, if the knife comes out clean, it’s done. Cool for 20 minutes, then refrigerate two hours before eating. Sprinkle and decorate with whipped cream and limes as you wish! 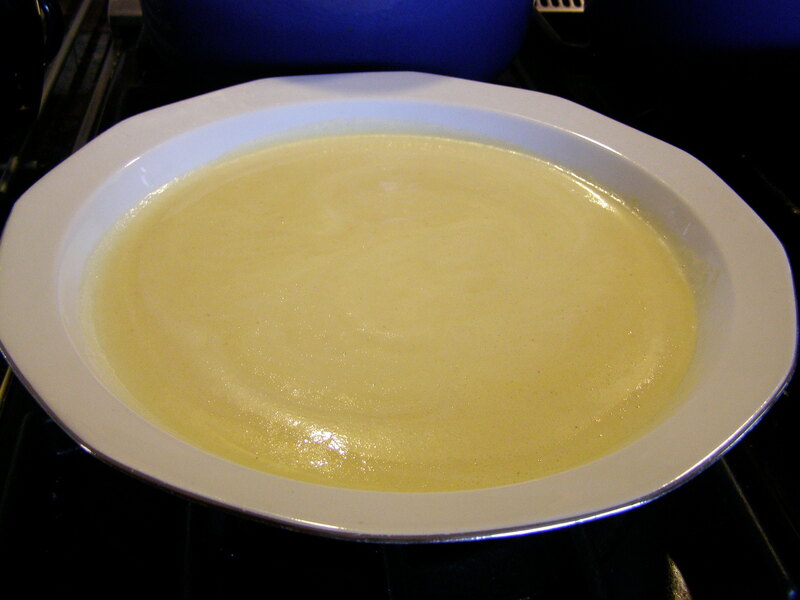 Condensed milk is the basic for the original recipe because early in the 20th century there was no refrigeration on the Florida Keys to preserve milk or cream. William Curry, a shipping magnate, invented the recipe to sell his imported cans of condensed milk. It has later been proven to make a smoother filling than cream although some people contend that a filling with Vanilla ice-cream was President Truman’s favorite. On a final note, the pie should be yellow, if it is lime colour, this is a sure sign that it contains food colouring and should be disdained. We found the pie to be quite sweet, but not as sweet as the restaurants’ versions. If you like it tart, make sure to use the small Key limes which are more acidic, and use only 3/4 can of condensed milk and an extra egg yolk. Note: Sally Cole, who spends her winter in Florida, suggested using ginger snaps instead of Graham crackers for a more intense flavour. Last night, I was invited to dinner and showing of Episode 1 Season 3 of Downton Abbey, a casual Sunday night with friends. They roasted the Rosemary lemon chicken, a free range tender and tasty bird from Metchosin, raised with love and an elaborate grain diet. 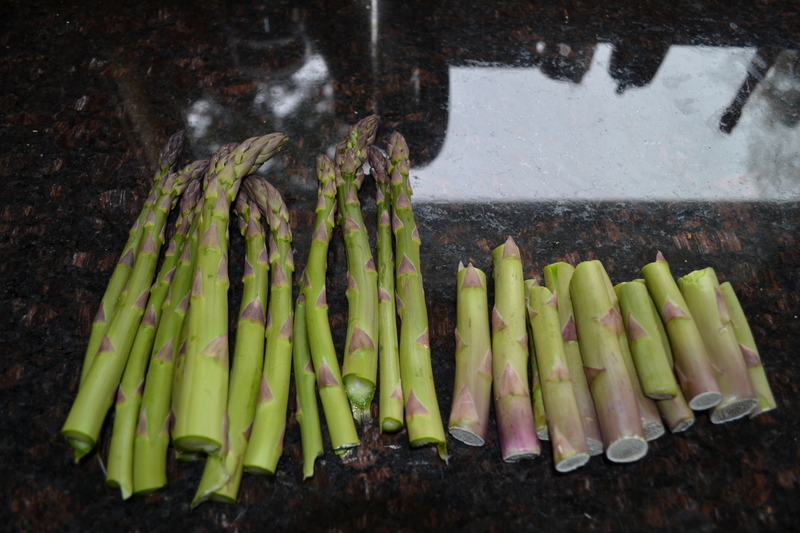 It was served with potatoes from 10 Mile Point, they grew themselves and carrots and asparagus with butter. The main course was so perfect, it would have met Dowager Violet’s daunting standard. 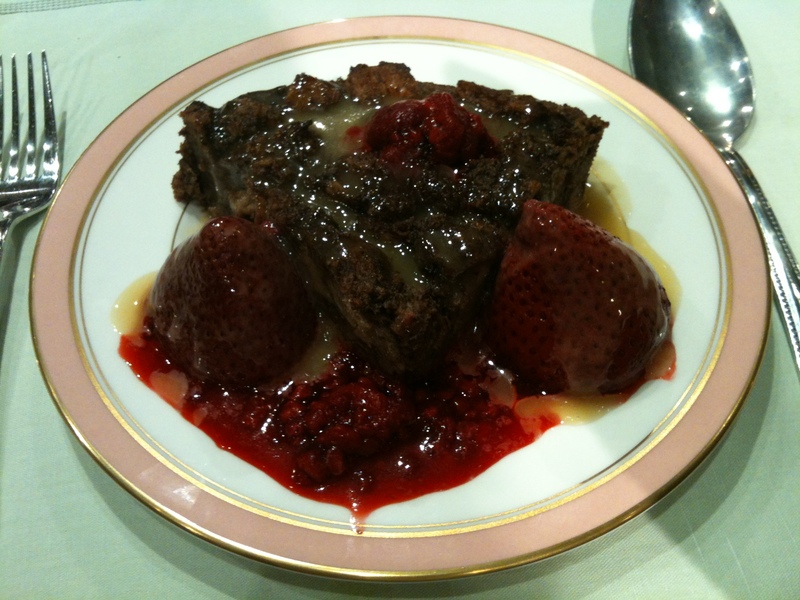 I was next with dessert and chose the Dark Chocolate Bread Pudding with Salted Caramel Sauce recipe, from the “Unofficial Downton Abbey Cookbook” by Emily Ansara Baines. Just what I think they served for the family alone on the eve of Lady Mary’s wedding if I heard Mrs Patmore correctly! The instructions in the book are not all that useful so I will skip them. Who wants to dirty three bowls when it can be done with one. And why start with the sauce, when it can be made while the pudding cooks? I am sure that both Daisy and Mrs Patmore would agree, so here is my take. Cut up the baguette or white bread or brioche bread in cubes, grease a large baking dish 9X13 or 2 smaller ones, round works too. Place the bread in the dish. 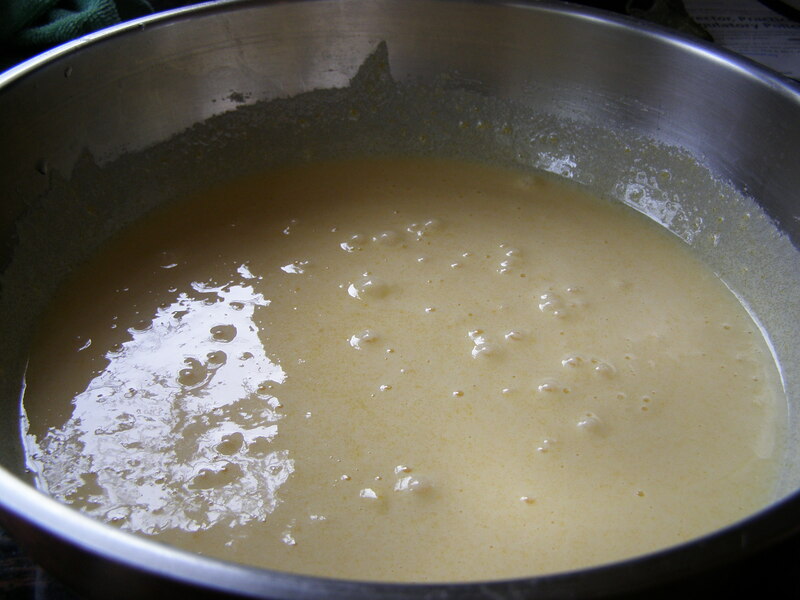 In a large bowl, lightly beat 6 eggs, add the vanilla, almond and cinnamon and whisk together. Add white sugar, brown sugar, cocoa powder and salt. Thoroughly whisk until smooth. Add the milk, cream and coffee liqueur. As I did not have Amaretto I used rum and 1/2 tsp of instant coffee. Grate and add the chocolate, the hardest part of this recipe is grating all the chocolate! (I used 6 ounces bitter-sweet instead of 8 ounces semi-sweet). While the grater was out, I added the zest of a whole orange. Mix everything. Pour over the bread, stir and let soak while you pre-heat the oven to 325. 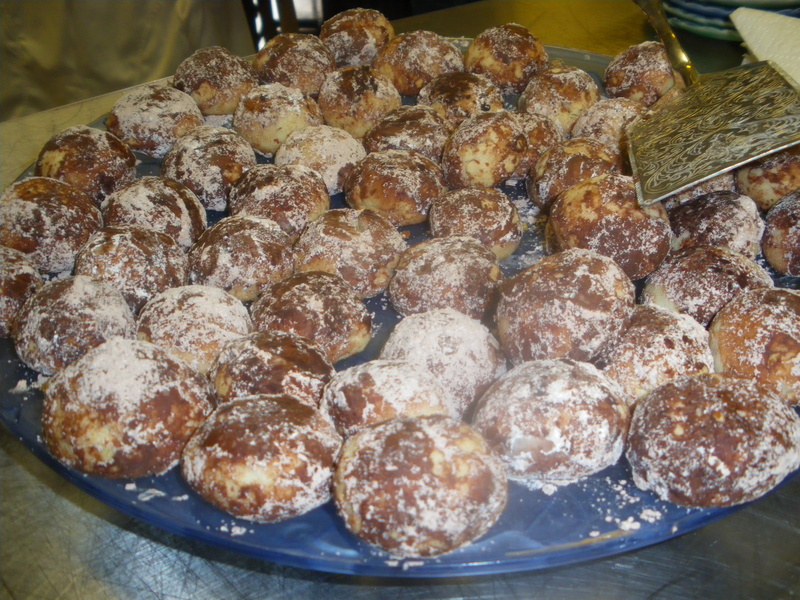 Convect bake for 30 minutes for half recipe or small baking dishes, 50 to 60 min. for large dish. Check with a knife and remove from the oven as soon as the knife comes out clean. 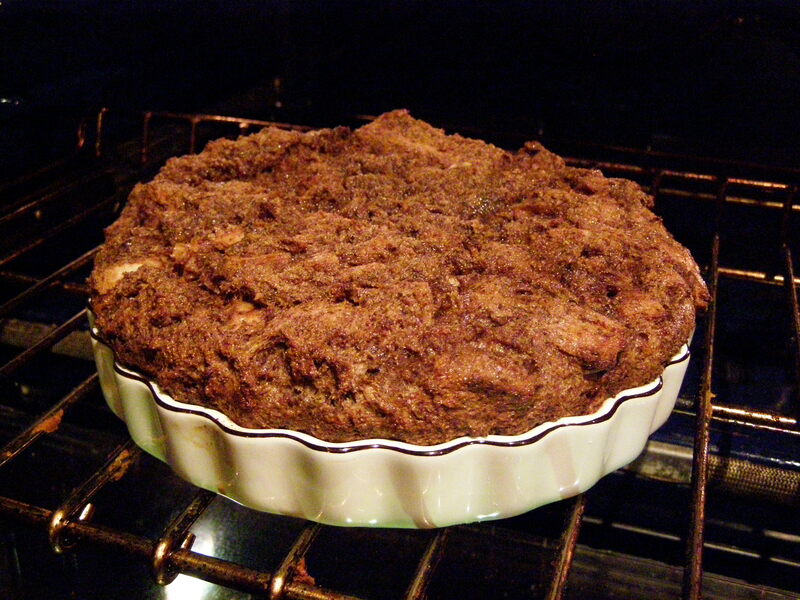 It is best to make this just before dinner so the pudding will remain warm and moist. On fine English bone China, it tastes even better! The Cookbook features classic recipes, from British upper-class fare to bangers and mash, and from refined French gourmet to mushy peas. 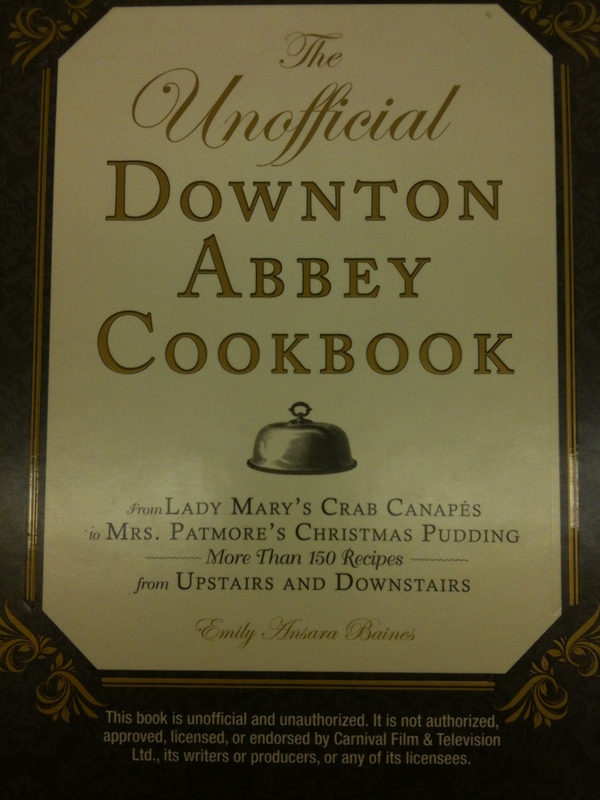 I am not sure I would trust it to replicate difficult recipes like Sybil’s seafood Newburg or the Upstairs Downstairs Plum Pudding. 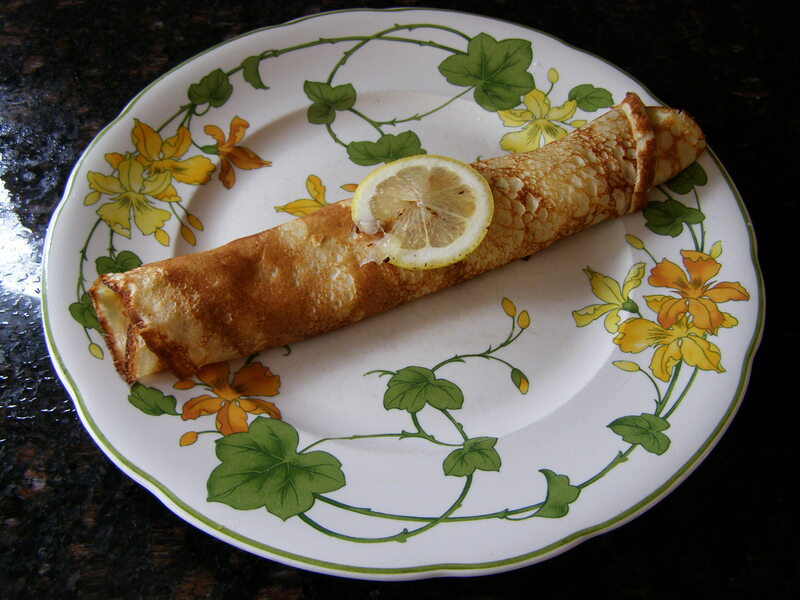 If you wish to cook more of the Downton menus, I have already featured my own recipes for some of the items such as Beef Tongue, Onion soup, Crêpes Françaises, Roasted Duck or Mrs Patmore’s dropped chicken on this blog and the advantage of the blog over the book is the pictures and the practical approach. The book has not one single picture. Anyway, this is not a book review, I just want to say that leafing through the pages does make you dream about dinner at Downton’s, but for culinary facts , techniques, recipes, there are many more accurate sources. Likely why the publisher reminds us on the front cover that : ” This book is unofficial and unauthorized. It is not authorized, approved, licensed, or endorsed by Carnival Film and television Ltd.” So you know. But I still enjoyed browsing through and now raise my glass for a toast “to King George”! For some curious reason, which I did not figure out, my Canadian family’s Thanksgiving dinner was hosted today, Saturday, in prime Haliburton cottage country in a solid wood chalet by chilly Lake Kushog (believe me, I actually had a short swim- and short is the stressed word here). First, we had rain, then the sun tried a brief appearance but, soon the hail was taking over followed by a hard rain and a refreshing breeze. So quick swim, recovery in hot-tub and off to a full day of cooking, with ETA 18 hundred hours, for a buffet for 17. The good thing about this Saturday’s rehearsal is that it was a great success that can be replicated on Thanksgiving day, Monday. (By you, not us). 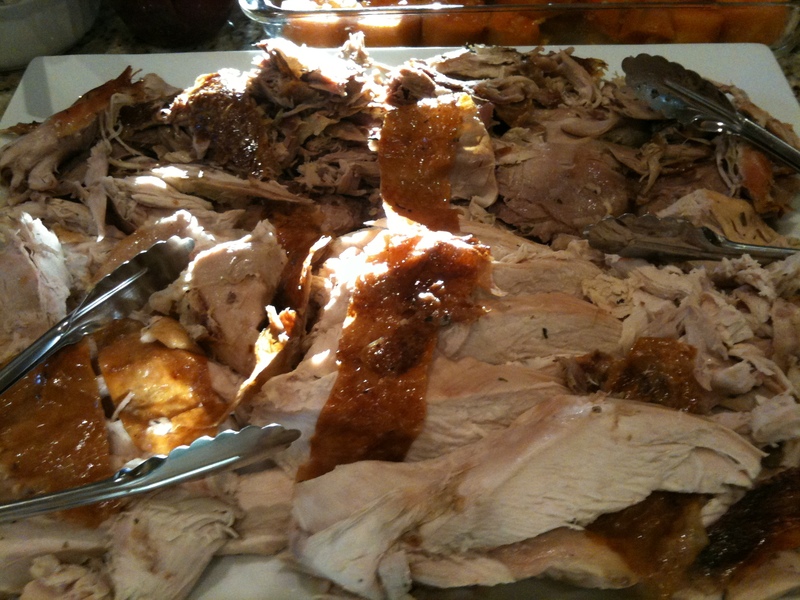 A 25 pound grain fed Ontario Turkey bird from White House Meats, green beans, Brussels sprouts, mashed potatoes, squash purée, Romaine lettuce, roasted yams, cranberry sauce and fig-orange conserve. As you can see, this is quite a few dishes and I forgot the stuffing and gravy! 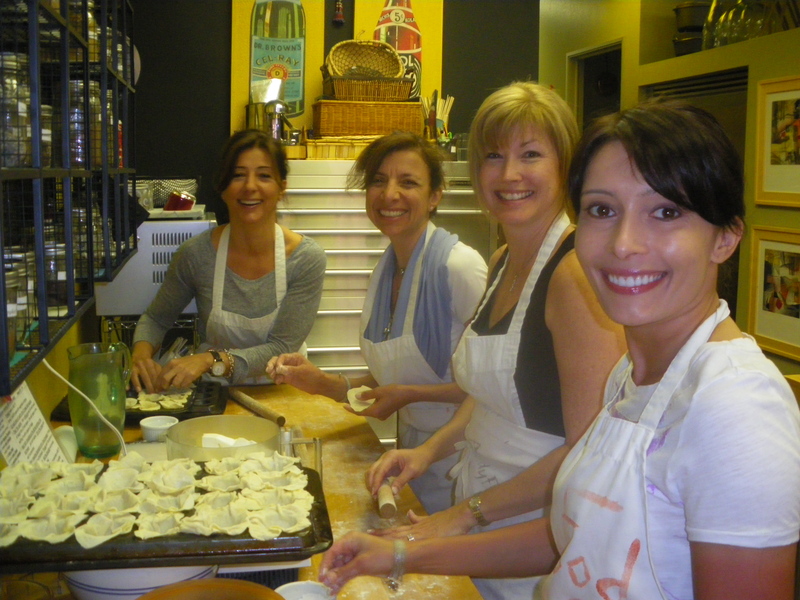 Good thing that it was a family affair, that my sisters-in law are amazing cooks. 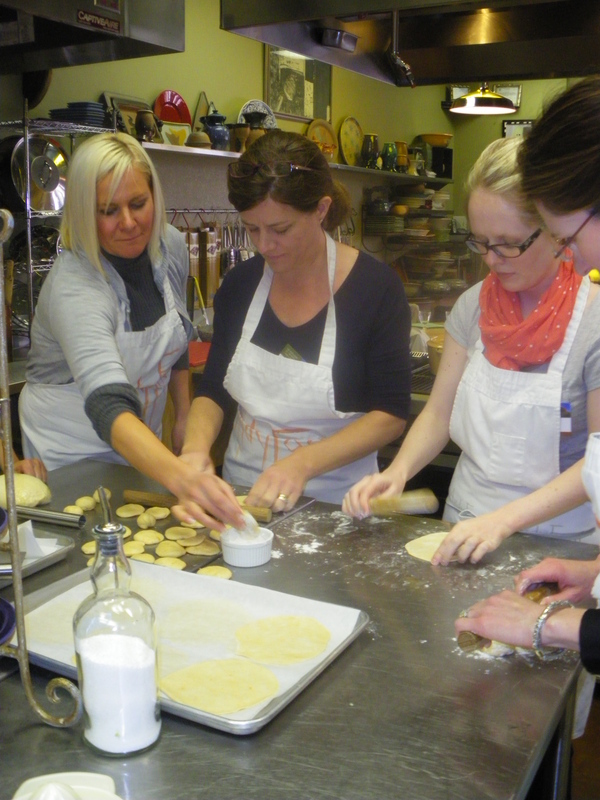 They did produce this feast and tarts, not to mention pumpkin pies with hand-beaten vanilla whipped cream. The whipped cream was the only item produced by a male, and today I wondered if this was really my Canada :). 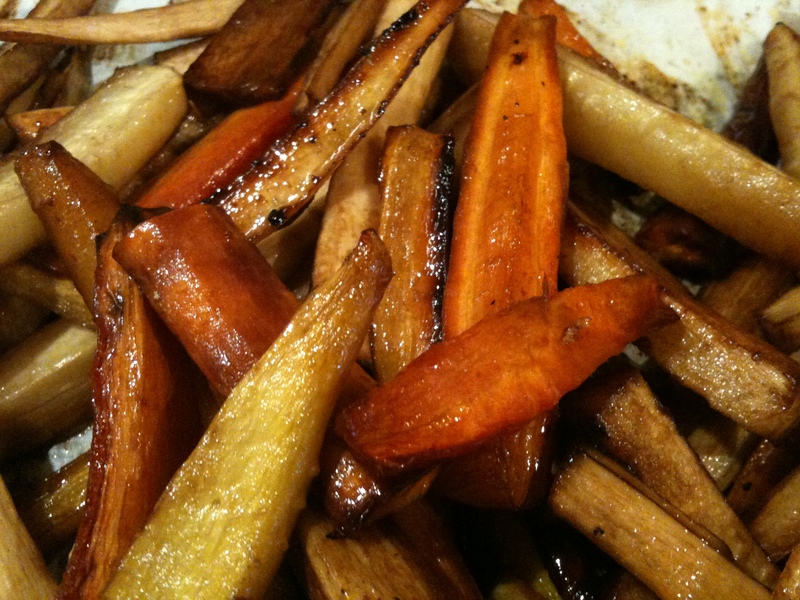 Bonnie made the parsnip and carrot fries and they were the highlight of conversation. Nephews commented at the clever disguise, a vegetable that looked like a French fry, but turned out to be a parsnip or carrot with a Balsamic caramel “costume”. 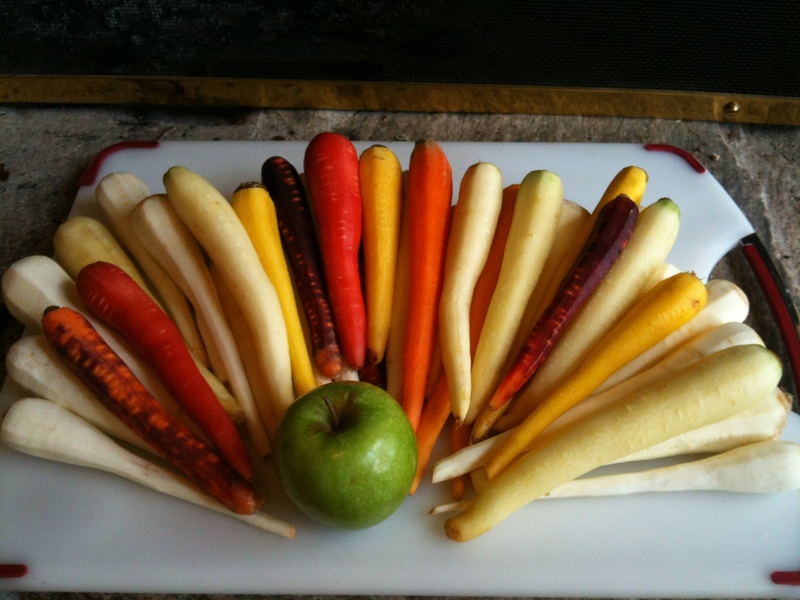 The carrots were heirloom carrots from Québec with amazing colours, ranging from pale yellow to bright orange with red stripes. My job was to cut up all the parsnips and carrots in pieces about the size of thin shoestring fries. All the thin cuts were gathered in a large bowl and sprinkled with a mixture of equal parts of Extra-virgin olive oil and Balsamic vinegar with brown sugar, I think it was a good cup of the “sauce” for 6 pounds of vegetables. After tossing them well, you lay them out flat on cookie sheets and roast them at 350 or higher for maybe 30 minutes, or the time it takes to get them crispy on the outside and very mushy inside just like the original French fries should be. Haha, that’s the trick and Bonnie is keeping that one under her hat. The vegetables are only roasted though, which brings the flavours out and saves you from the evil of deep-fry. 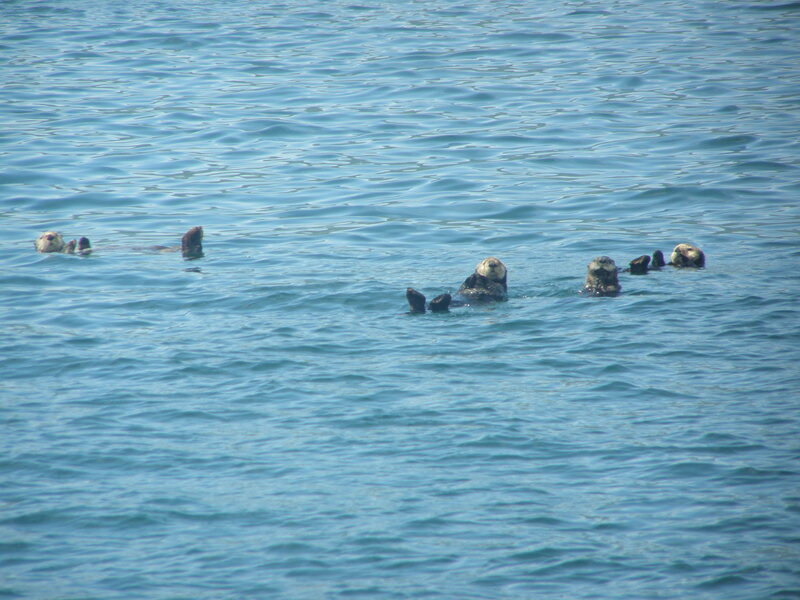 The adults loved it, the younger crowd complained about the cheat, but there was not one “fry” left. As for French fries, do sprinkle with lots of salt before serving! 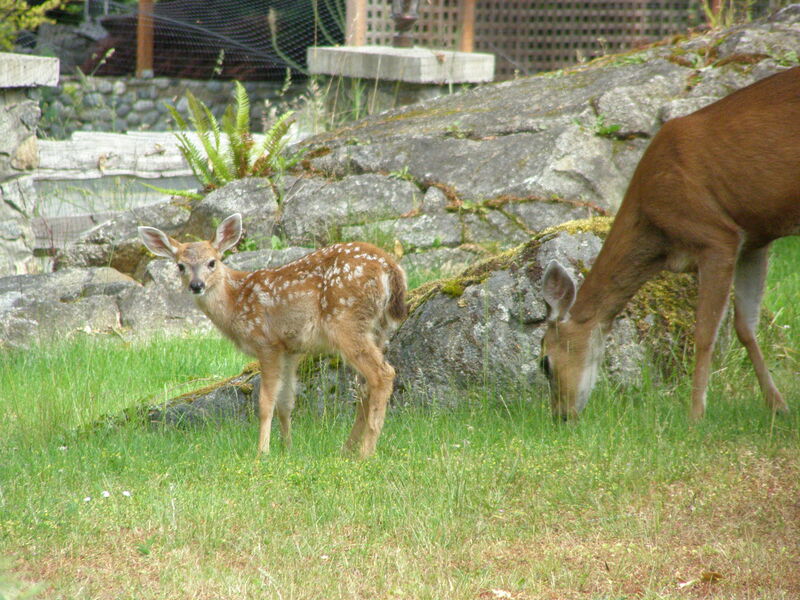 The doe must have heard that Jules the Jack Russell terrier was no longer on duty here in Victoria BC, since he got a transfer and huge promotion in March as guardian of the orchard in the Garden of Eden. I know he is doing a great job there, but we do miss him so much. RIP Jules! The deer have free rein here now and the doe knows it! She jumps the fence and the fawn goes under! Today’s Deer prix-fixe menu: (seulement pour les habitués). Wild mushroom burger sprinkled with Rosemary and Thyme served with bamboo heart fries and parsley relish. Blackberry flower sherbet with lavender coulis and pine nuts (early bird only as the temperature does rise a little above freezing by 9am these days) and wild oat cookie. Pairing: clear glacial water from the pond, naturally mineral rich with earthy taste and gary-oaky flavours. The spot prawns were so tasty! 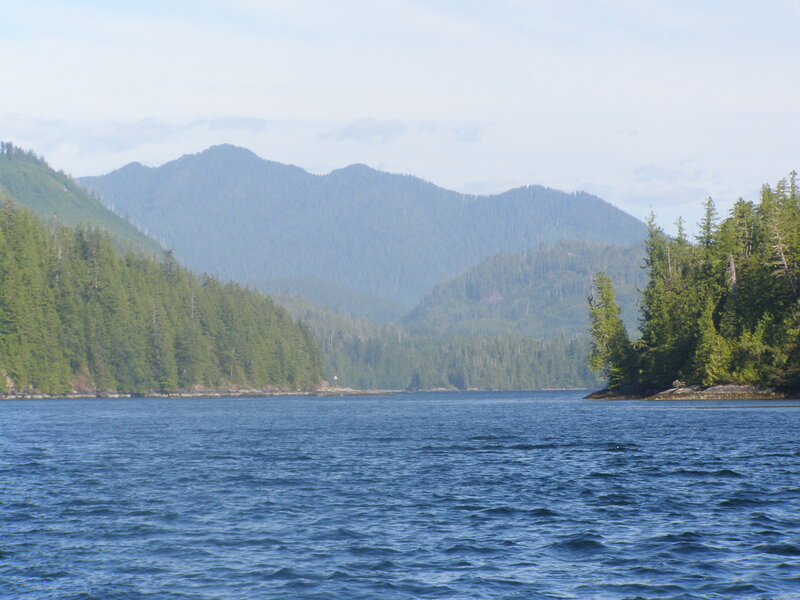 They were a gift from the Forbes family, owners of Critters Cove Marina in Nootka Sound on the West Coast of Vancouver Island. 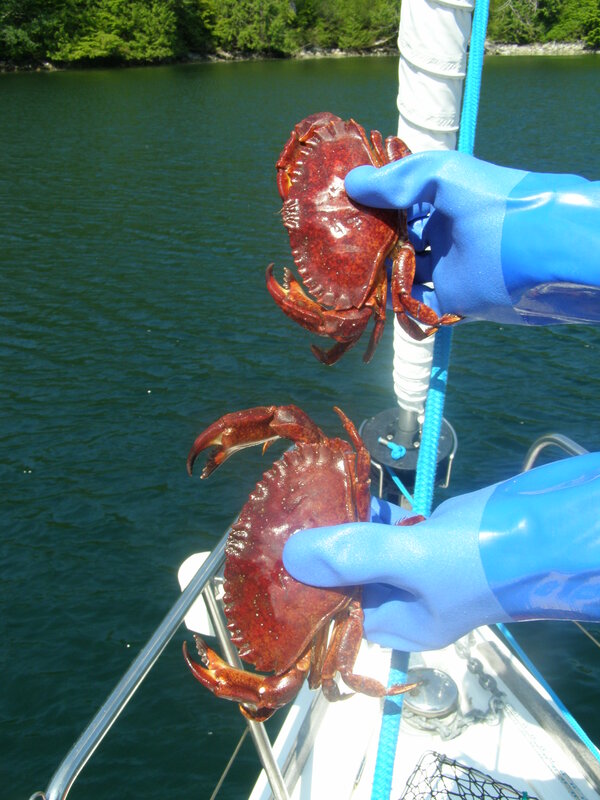 I think that I must particularly thank the boys, Bryce and Tucker who caught the not so small crustaceans (huge). They were so big it was really easy. After they were completely defrosted I threw them in a boiling vegetable broth, with a tsp of vinegar, and brought it back to a boil, tuned the heat off and let them steep for five minutes in that pot. 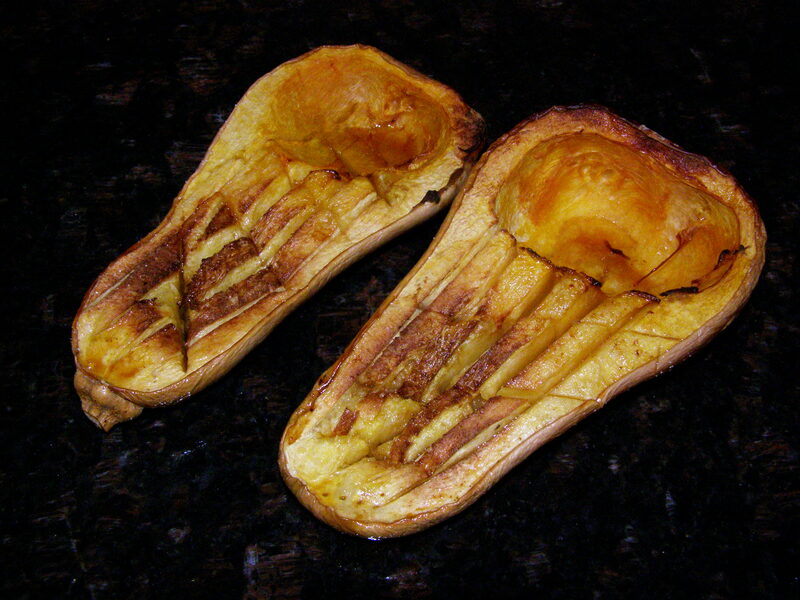 Then, I drained them, peeled them and a couple needed deveining. 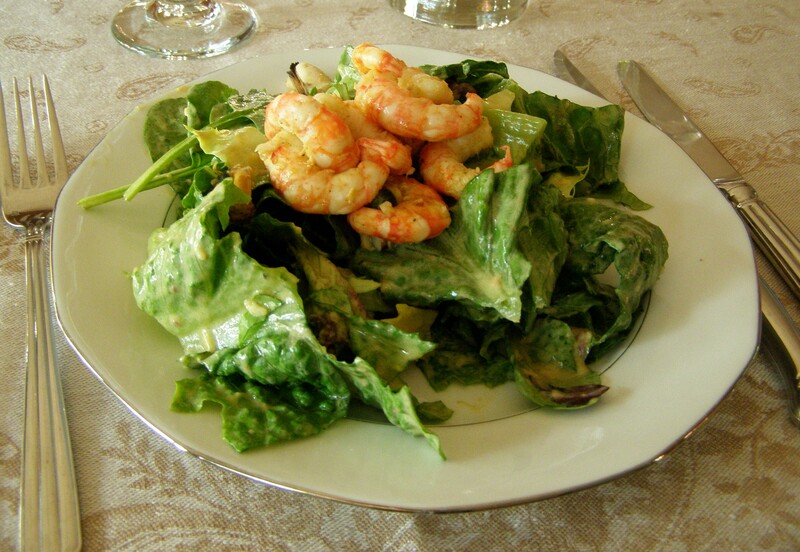 Just before dinner, I started a frying pan with 1/2 tsp olive oil and butter on high, the highest possible, I added the prawns and crushed garlic, tossed them around for 2 minutes, added a spoon of cider vinegar and served them on a garlicky dressing Romaine lettuce. If you like your prawns with more zest, try a bit of Fran’s Hot sauce, or Frank’s Hot lime. I was very surprised today when I saw a familiar vegetable from my youth in France, something I had not seen ever again since emigrating to Canada almost 30 years ago. This root vegetable is slightly larger than a carrot, about the size of parsnip, but the skin is black. 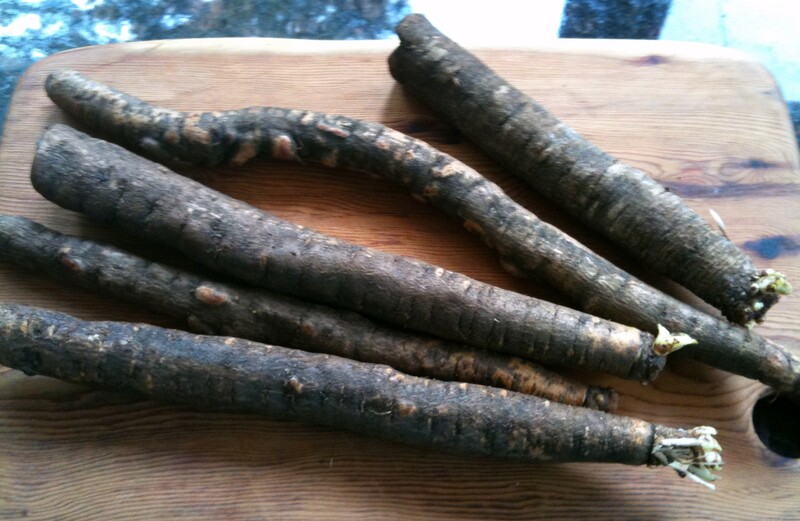 Salsify (scorzonera hispanica) is the most delicious of all root vegetables by a long shot. It is grown mostly in Europe during the winter months, and why it only arrived at my grocer ( aptly named “The Root Cellar”) just now is a puzzle. 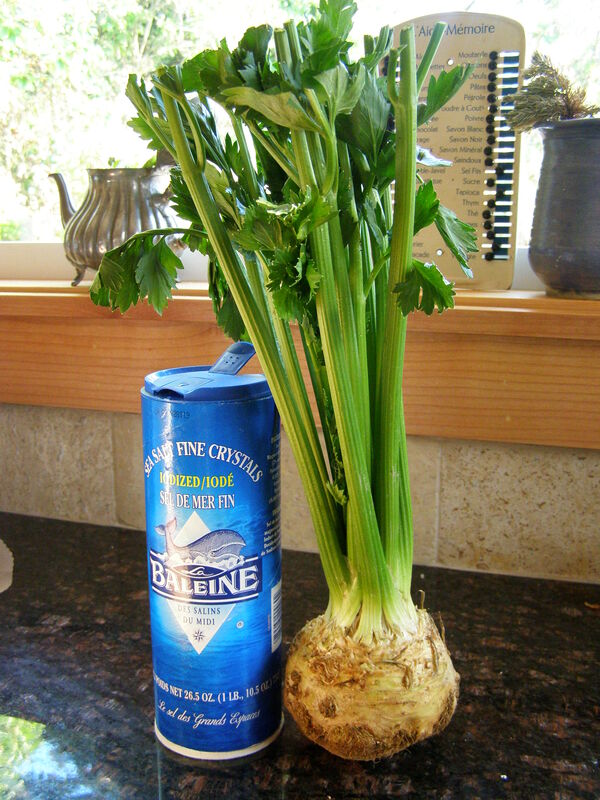 They import it from Belgium, and maybe the endive producer suggested they test it in B.C. Most customers probably did not see it, there were only a few pounds and the price was, well, the highest of any vegetable there, wild mushrooms excepted. For something that retails for 1 to 2 Euros a pound, $10/lbs here would only be paid by someone like me in search of childhood memories. 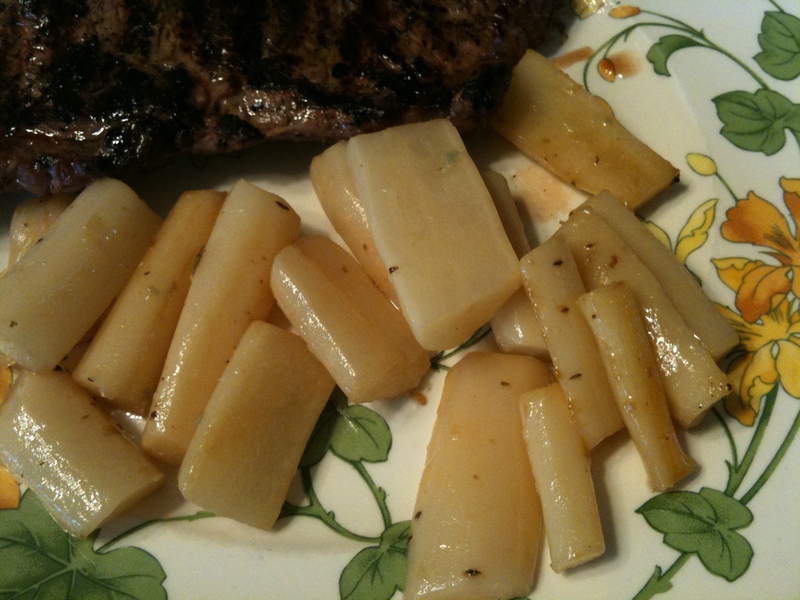 This said, I highly recommend salsify, a most refined vegetable. They have only one drawback : You MUST wear gloves to handle them because they contain a white sap which is extremely unpleasant to the skin. I am saying this first in case you are tempted not to read to the end because the price to pay would be washing your hands 12 times and still feeling sticky. One more thing to keep in mind is that salsify turns dark brown immediately upon air contact unless it is immersed in water containing lemon juice or vinegar. 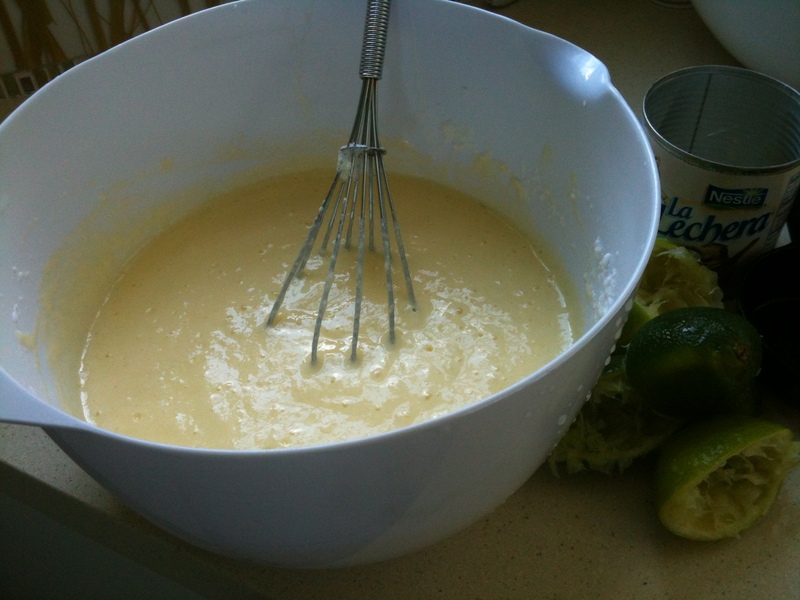 So here we go, prepare a bowl with lots of cold water and 3 tbsps lemon juice or white vinegar. Put the gloves on. Peel the salsify roots one by one with a Y-peeler or a regular potato peeler and immediately plunge them in the bowl. Then cut them in sticks just about over an inch long, and split the thickest parts again lengthwise so they cook evenly. 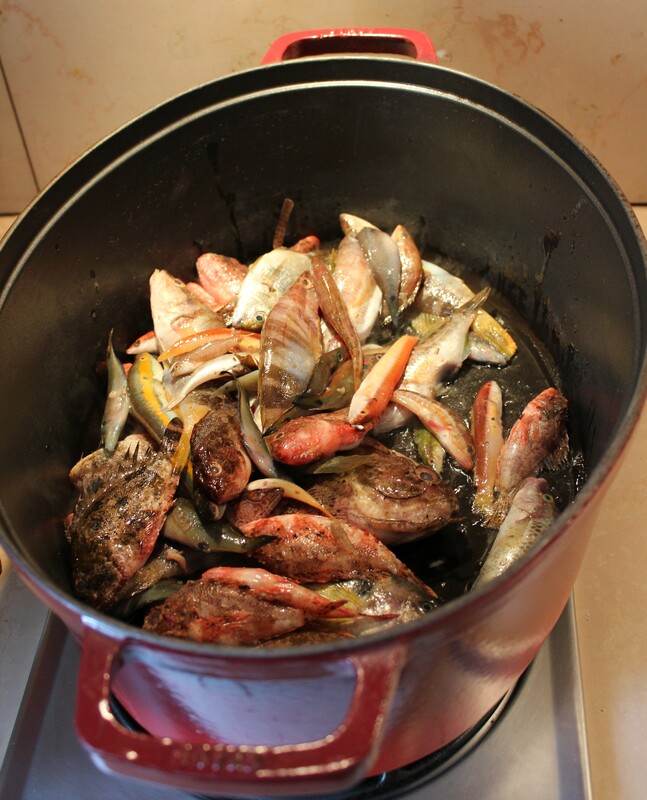 Boil salted water, add the juice of half a lemon and the salsifies and cook until very tender, but not mushy. Larousse Ménager says 2 hours, I have seen 30 minutes on the net, but mine took exactly one hour at a gentle boil. The new plants must be more tender than those grown in the ’20s. Drain and sauté on medium heat in butter with a crushed garlic. A half teaspoon of olive oil will prevent the butter from browning. Add chopped parsley before serving. Salsify goes well with almost anything roasted or grilled. I find it best just done in the light garlic butter as the delicate taste comes out best that way. 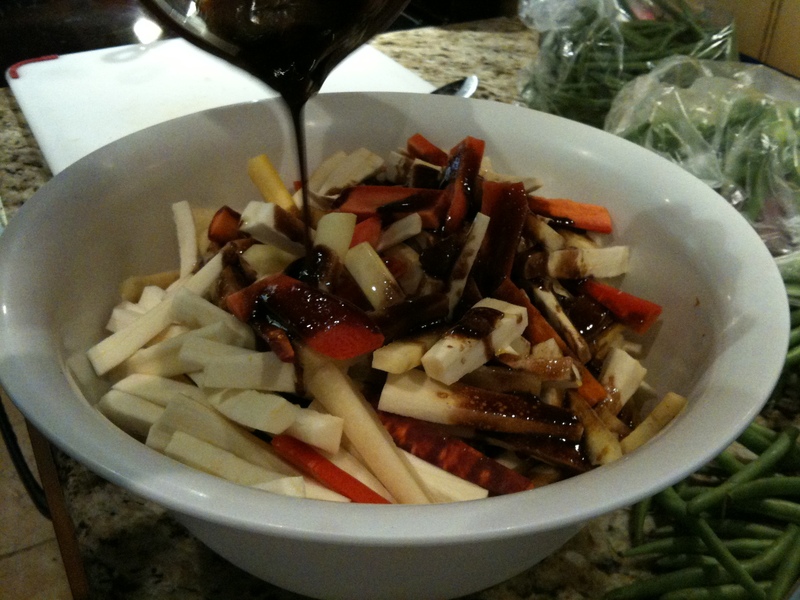 It also makes a delicious warm salad with a balsamic and peanut oil dressing. Sometimes you need a nice dinner that does not require a lot of work, maybe after a long day of skiing or a long day period. Most of the time spent on this recipe is roasting time, during which you can have drinks with your friends or a nap if you are exhausted. 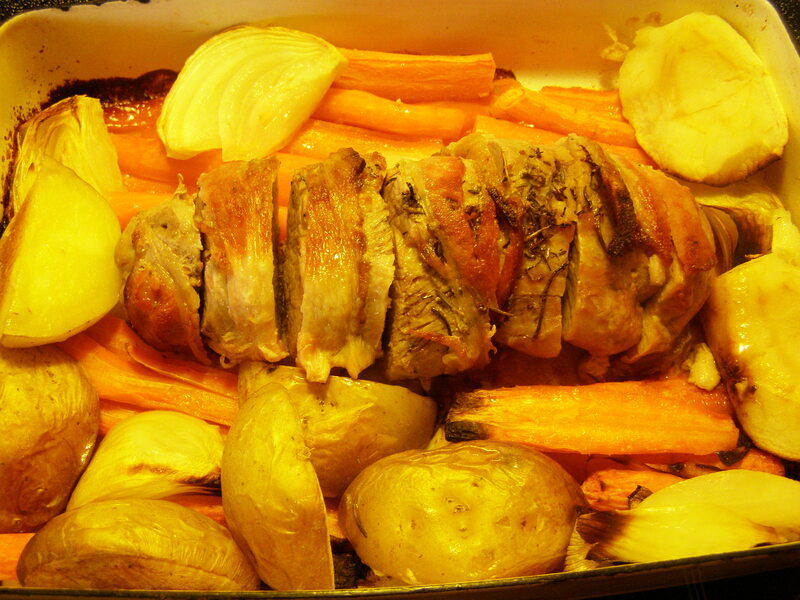 No need to check on the food very much either, it roasts together nicely in one dish. You can adjust the quantities according to the number or guests, one tenderloin is enough for 2 or 3 depending on its size. 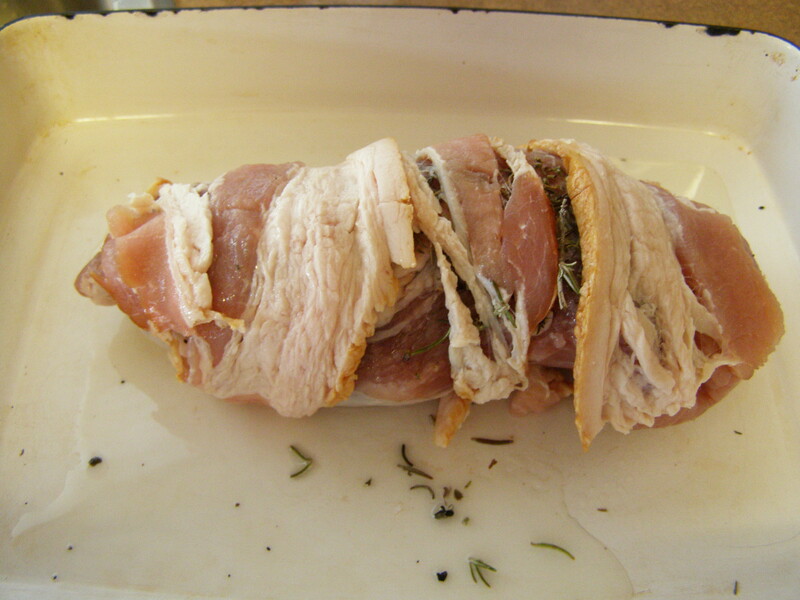 First, I sprinkle thyme and rosemary on the meat and I wrap each tenderloin (the filet) in 2 slices of bacon. It keeps the moisture in, prevents it from browning too much and getting hard on the outside. In a greased (olive oil is healthiest, butter is best, bit of both is what I do!) oven roaster, I put together the tenderloin with peeled carrots split through the middle lengthwise, potatoes cut in eights, sliced onion, and peeled apple quarters. I let everything roast about 40 minutes at 350 in a convection oven and it is all ready at the same time. 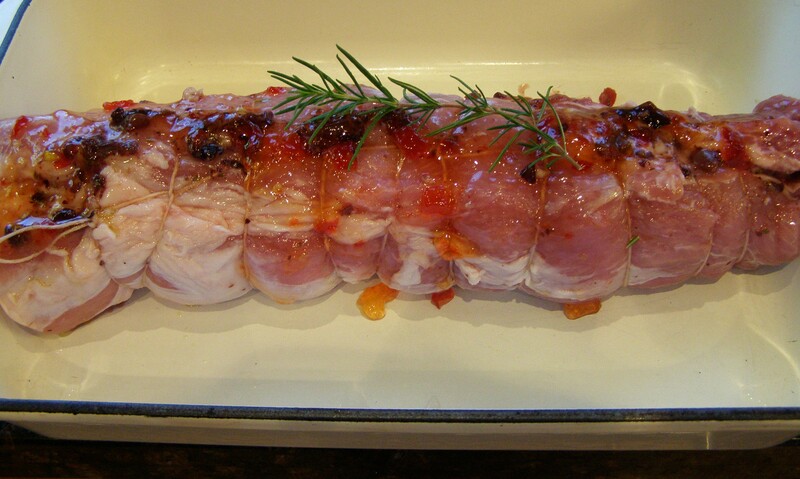 The pork should be just about past pink with still all the juice inside, otherwise it is overdone and dry. You may have to reduce the heat if it is going to fast, better to do that than reduce the cooking time, the meat will be more tender. Of course there is no limit to what you can add to the roaster pan. 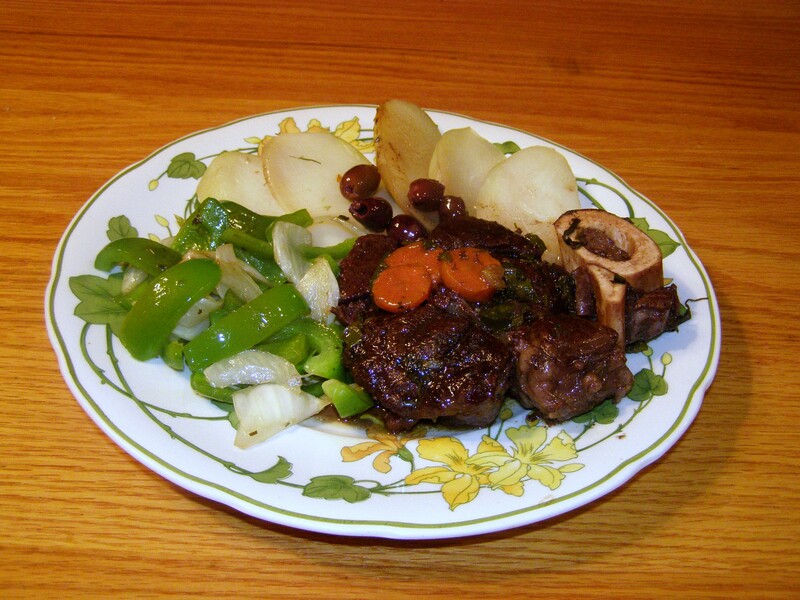 Peppers, mushrooms, cut-up turnips, yams, all cook fast enough. Also, a clove of garlic cut in four can be hidden between the meat and the bacon. 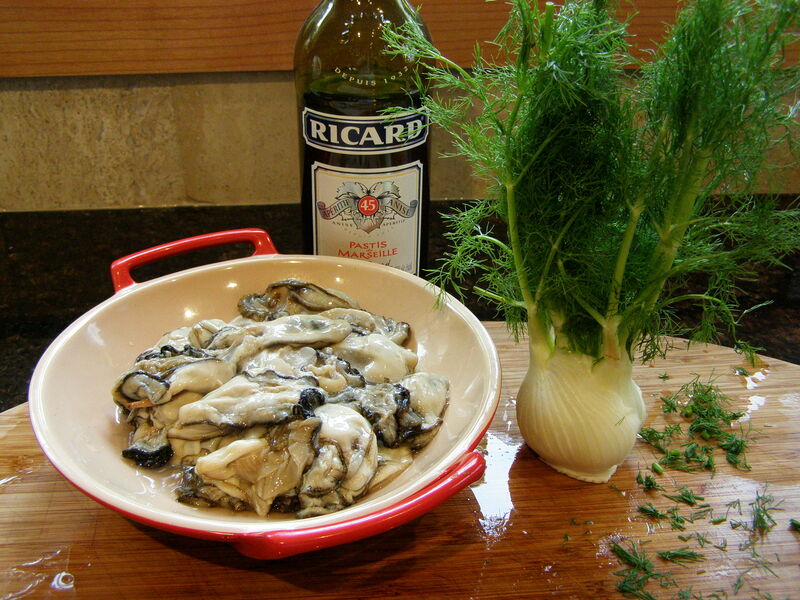 Slice and serve with Dijon mustard or chutney and white wine. Black bean salad to replenish your magnesium! Black beans are very rich in magnesium, a very beneficial mineral and they make a delicious warm salad in about five minutes. It is a wonderful menu item on a day when you are home-bound by a snow blizzard as you don’t really need to get to the grocery store to gather ingredients. 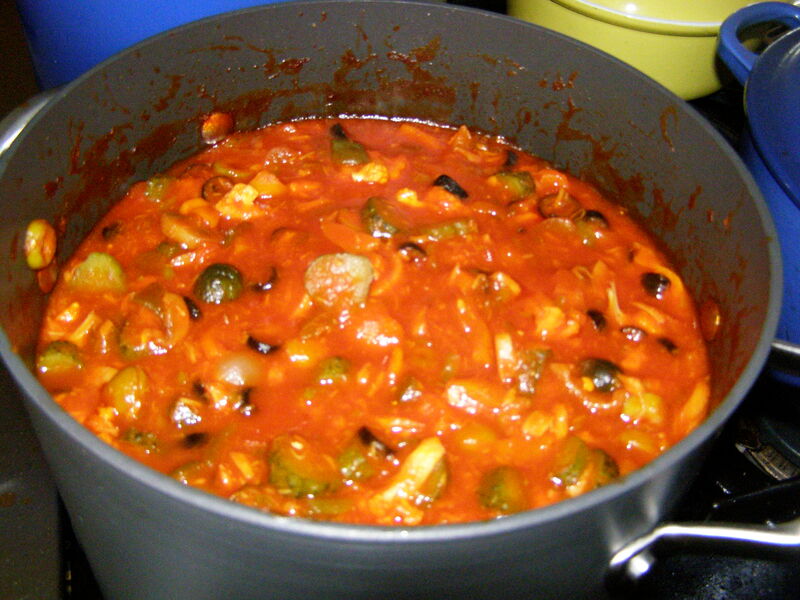 For two large portions, almost meal size, I drained and rinsed a can of black beans. Then I sauteed half a sliced onion with olive oil in a frying pan with a diced pepper. Any colour or a mix will work equally well. After about 3 minutes on medium/high heat and constant stirring, add the beans for another 2 minutes on medium and stop stirring. The black bean will get mushy quickly, so wait until you are ready to eat to add them. Before turning the heat off add one tbsp Dijon, three tbsps cider vinegar or lemon juice or lime juice and sprinkle with cilantro or parsley. Salt to taste, remembering that canned beans are usually pretty salty. Black beans contain 120 mg of magnesium per cup. Refer to the WHFoods newsletter for the nutrition benefice of eating black beans. Rinsing the canned beans is highly recommended as it makes them much crispier but also reduces the flatulence effects and removes some of the “bad carbs”. 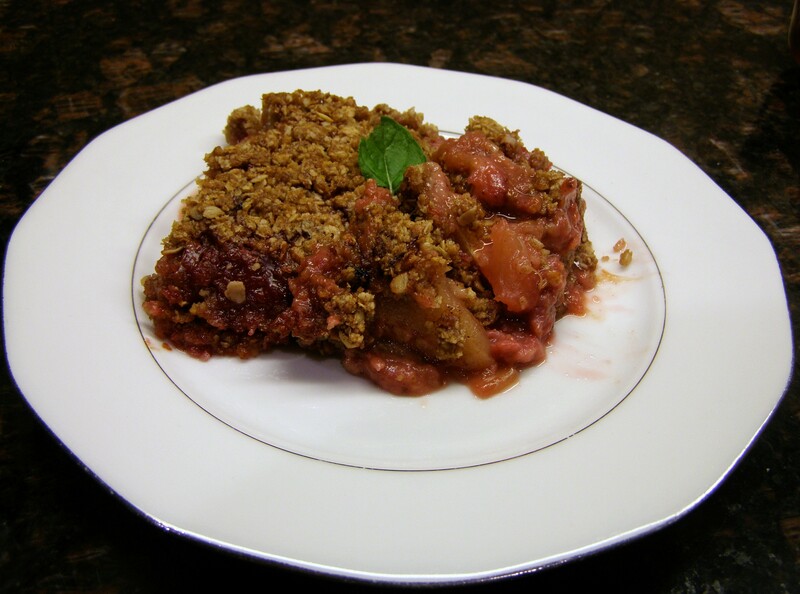 This recipe is a family staple that I have wanted to feature for a long time. The delay was caused by the extreme difficulty that faced me trying to assemble the ingredients. A little bit of cream is no problem, even a little white wine can be found in Canada if you don’t mind going to a Government store to purchase the “criminal” nectar, the Dijon mustard is ready available almost anywhere. But, the lapin? 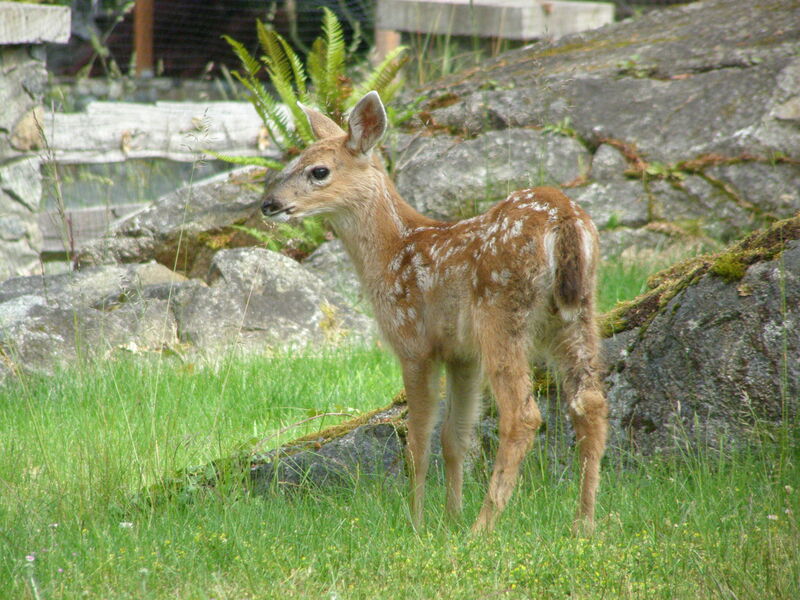 Hordes of them have been taunting me on the University of Victoria campus and in my own backyard fighting for my best bushes with the deer. But, even expressing the thought of eating them would bring outrage. Can’t really risk a charge of cruelty to Bugs Bunny. So here I am visiting my brother in Aix-en-Provence and my chance to buy a nice big specimen without further question or anyone raising an eyebrow. When I had gone to the Oak Bay Butcher Shop, a place that sees itself as a serious butcher, and asked for a rabbit, the two staff behind the counter had acted as if I was pulling an April’s fool prank on them sending me on my way with that arrogance often described as French in North America and absolutely no rabbit. 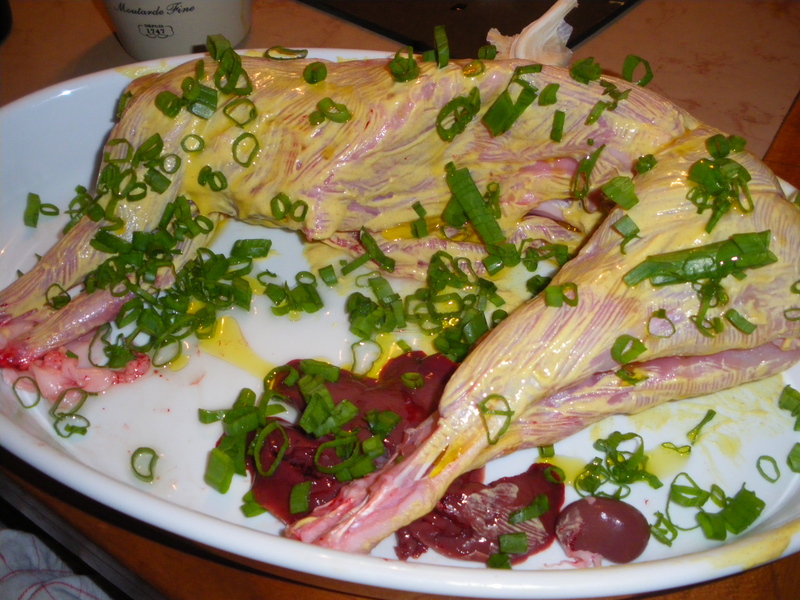 The rabbit is painted with a thick coat of Dijon Mustard and sprinkled with a tbsp of olive oil, browned on high for 10 minutes, turned over and browned on the other side for 10 minutes, then roasted another 25/30 minutes on medium/high. Then, deglaze the pan with a glass of white wine, pour into a pot. Place the rabbit back in the oven to keep warm. 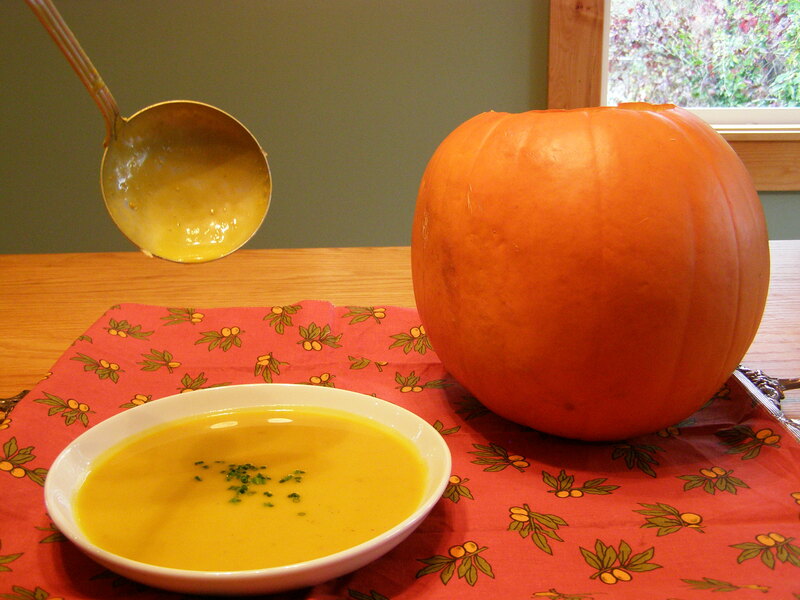 Make the sauce with the jus, 2 tbsps cream, 2 tbsps mustard and fresh thyme. 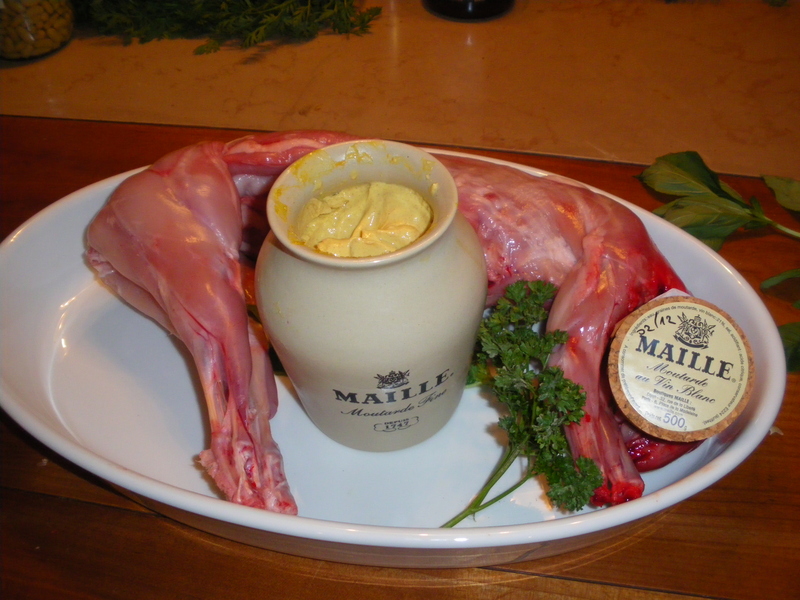 Another way to prepare this dish is to cut the rabbit first, brown the portion size pieces in olive oil in a Le Creuset dutch oven and to simmer with lots of Dijon Mustard, adding white wine, cream and thyme at the end. 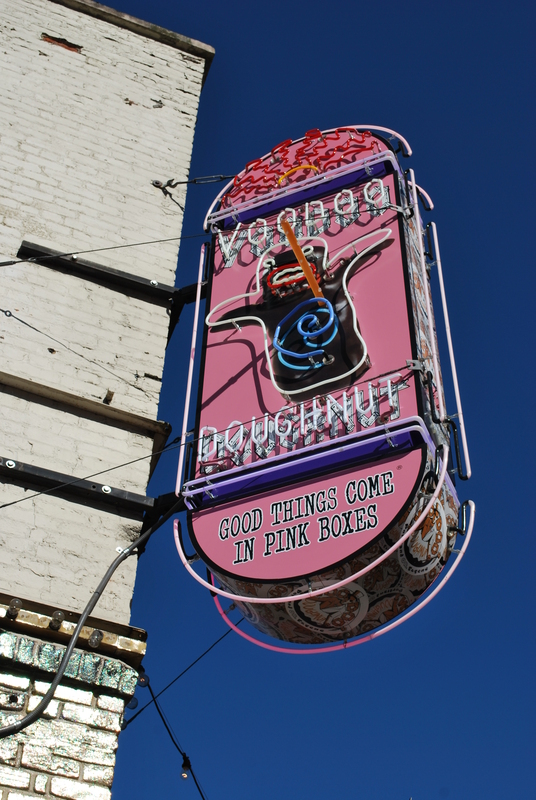 Good things come in pink boxes and the larger the box the better. 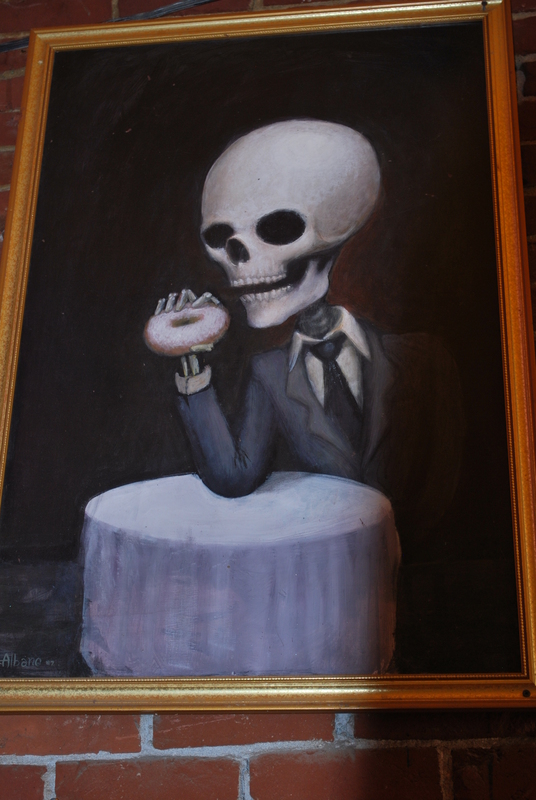 The largest box of doughnut ever just earned Voodoo the Guinness record last Saturday. Of course, the box was pink! I happened to be there a few days before the record attempt and there was a long line of people wanting their own little pink box around the block. Like everyone else, I was told that the magic was in the hole and I had to see it for myself. 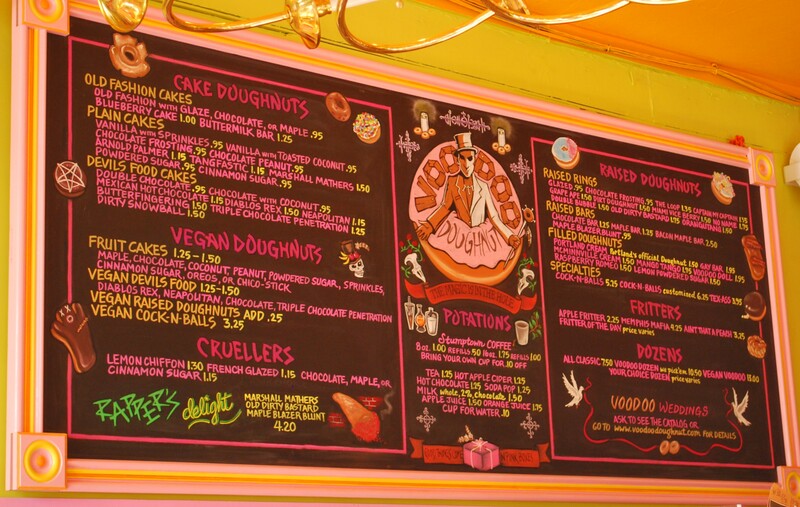 Notice the Voodoo doll doughnuts and the incredible variety. 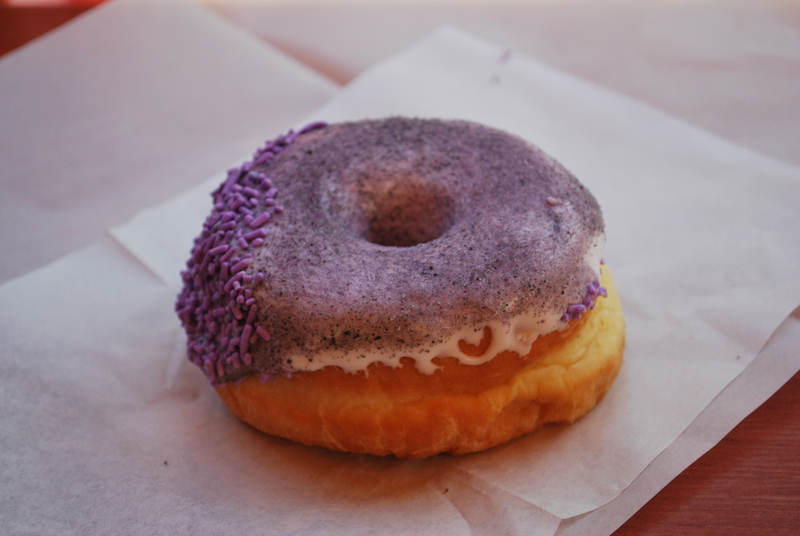 The neat fact is that they are open 24/7 and that they have a doughnut answer for any craving including grape and bacon! The names are very creative, the colors amazing and they do taste all right. The prices are even reasonable. The owners really have invented the magic potion, sorry I meant magic rings. The shop is in Portland Oregon and well worth a visit if you are in town. 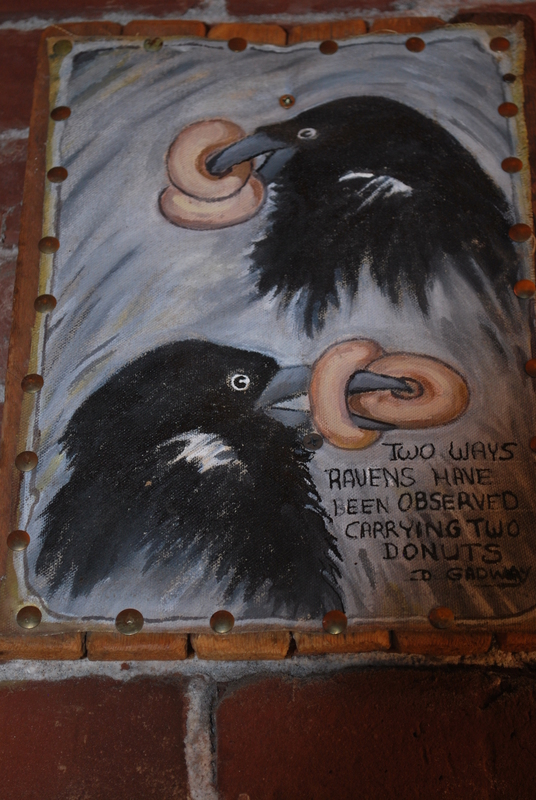 The decor is very “Voodoo” and the doughnuts are incredible or at least touched by Voodoo stuff. 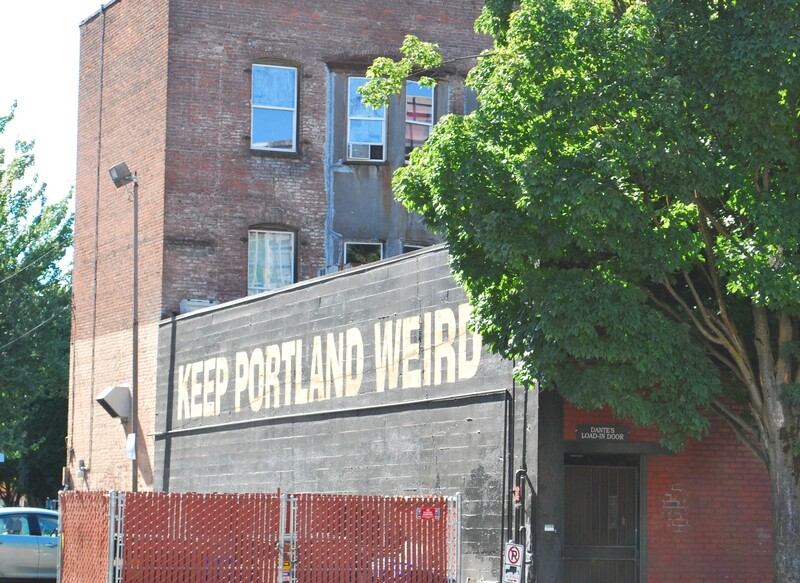 The irony of it all is that across the street from Voodoo there is a weird inscription on a brick wall…..
And they do keep it weird, so they do! All photos (except first, last, and 2 small ones) courtesy of Veronica Best. 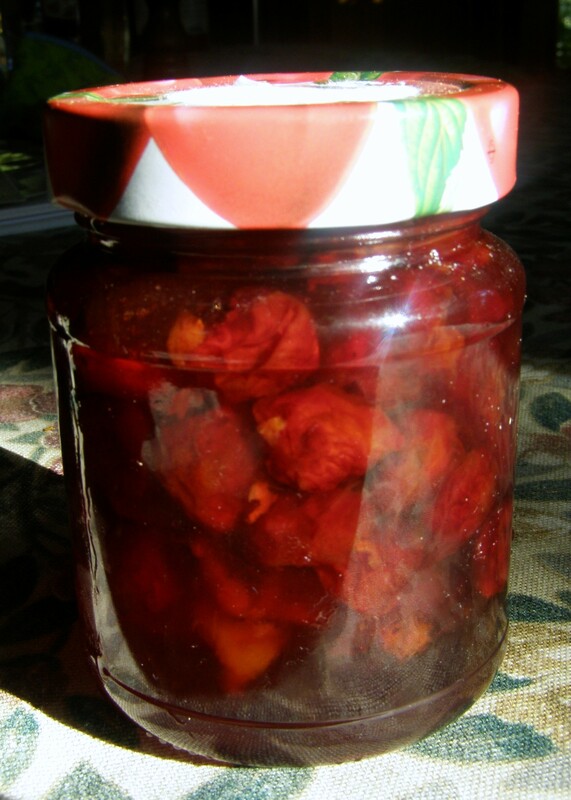 Sour cherries (or griottes in French) make the best jam of all fruit, and that has got to be true because no one would bother with the small sour cherries at all thinking of the work of removing the stems and pitting the cherries. Yes, it does take about an hour to pit 1.750 kg of the small sour cherry variety. 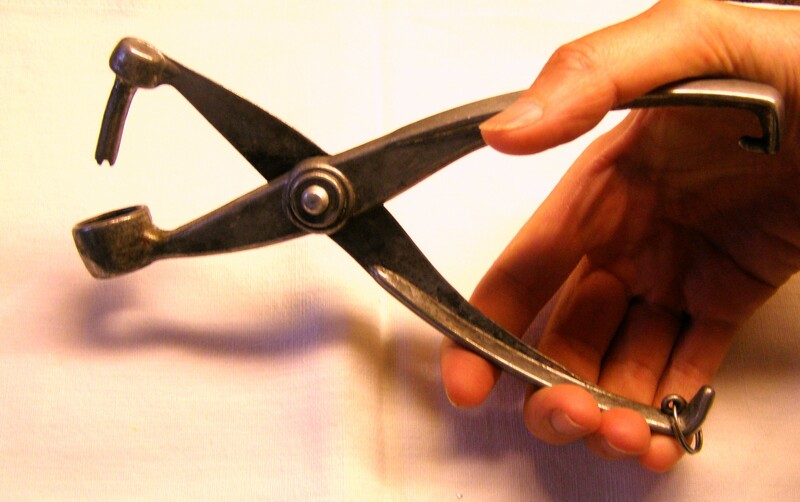 A good cherry pitter ( same tool as the olive pitter) is necessary and so is a good show to watch on TV. 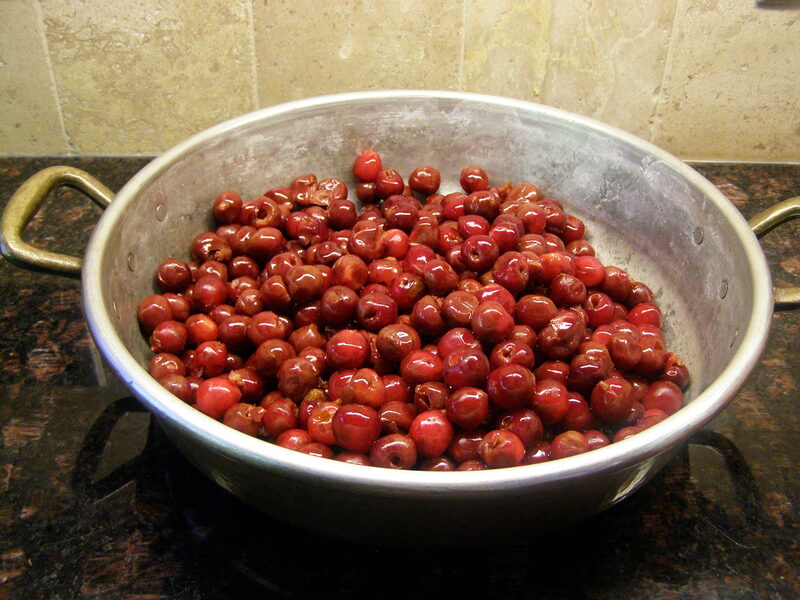 Anyways, let’s say you manage this interminable task late at night, sprinkle the cherries (about 1.5 kg left) with 1.250 kg of sugar and refrigerate overnight. To pit sour cherries try pulling the pit out with the stem. If the cherries are ripe enough, it should actually slide out from the fruit, and you only need the tool as a back up. In the old days, the tradition was to break the pits to find the almonds, wrap all this in a mesh bags and add it to the fruit in lieu of pectin. So go ahead with it, it works, unless you allow yourself to cut that corner and add a bag of pectin instead. 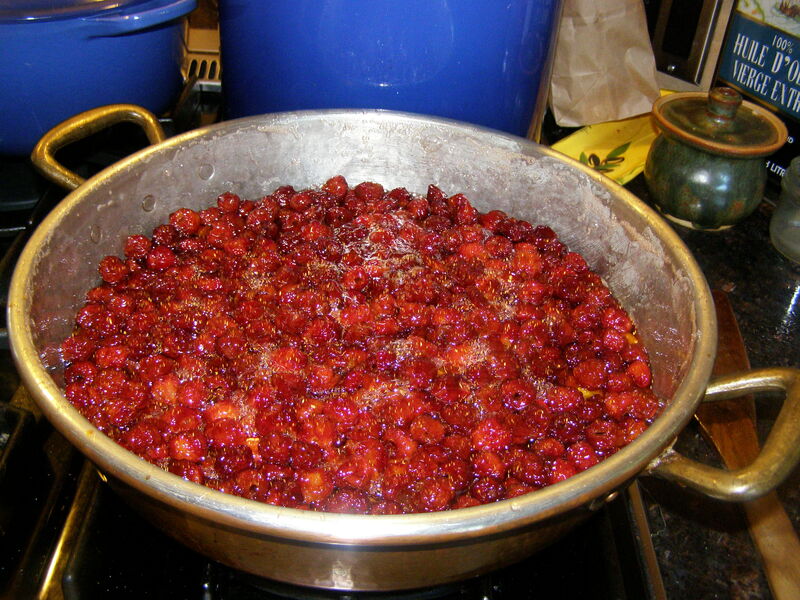 Add a lemon juice and the halves of the rind to a jam pan or your largest frying pan and slowly bring to a boil. Remove any scum (sour cherries don’t need produce much). Cook as long as it takes for the ” is your jam ready test”. 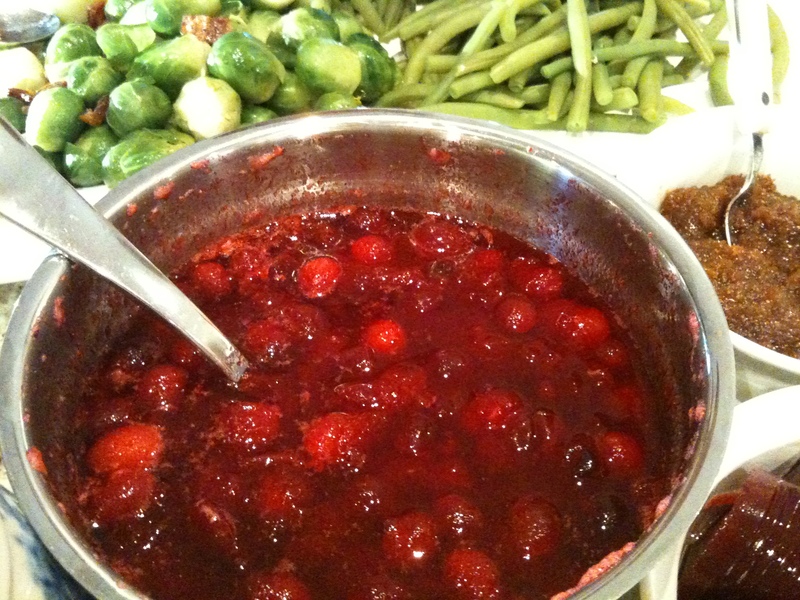 Your jam is ready if a tiny teaspoon of jam will take on a cold plate instantly. It will take some time. Cool 10 minutes, stir, remove the lemon rinds and transfer into sterilized jars. Screw the tops on and turn the jars upside down for a while (so the fruit does not all float to the top of the jar). The Bell peppers are really sweet right now. They are sweetest in July/August when they can fully ripen before harvest. 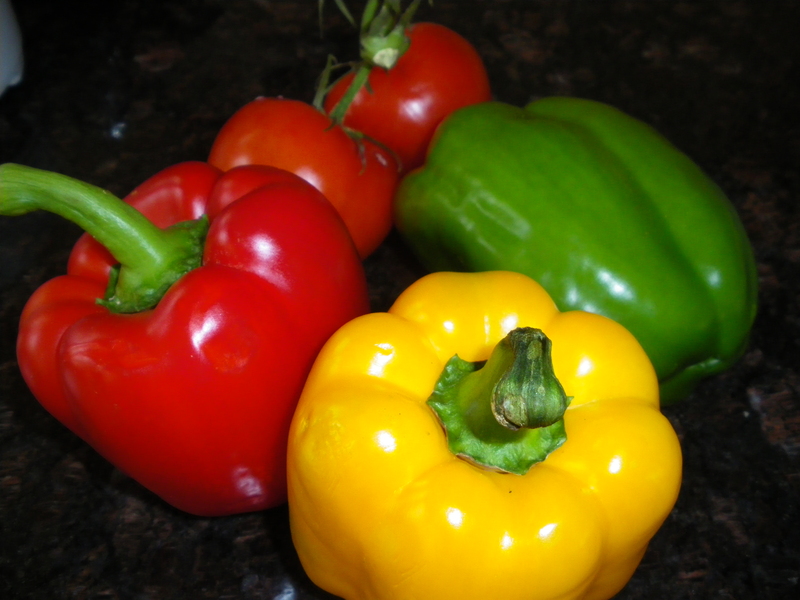 The local red, orange and yellow peppers are the sweetest of all and they also contain the most vitamin C, and lots of carotene and the antioxidant lycopene. Like avocados, peppers are a fruit although they are treated as a vegetable for culinary purpose. 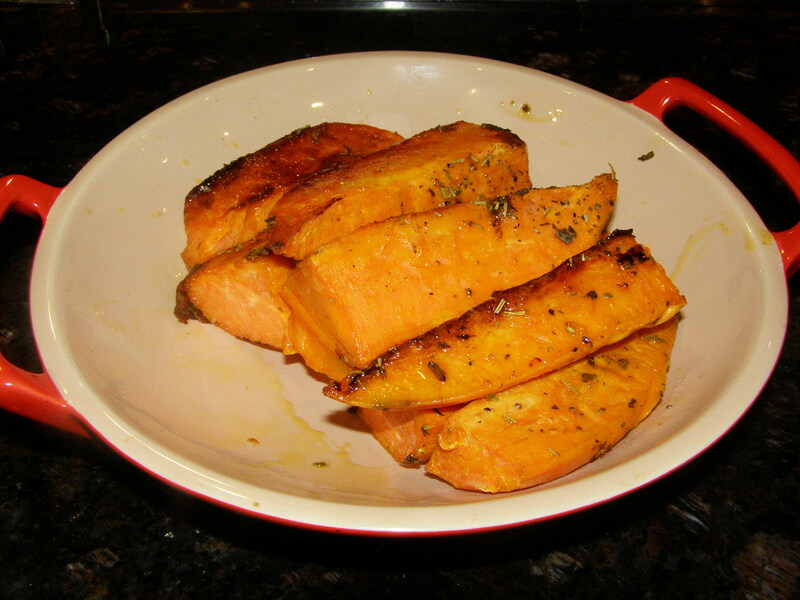 They are great just plain as a fruit cut up in slices but I like them best sautéed with bacon! 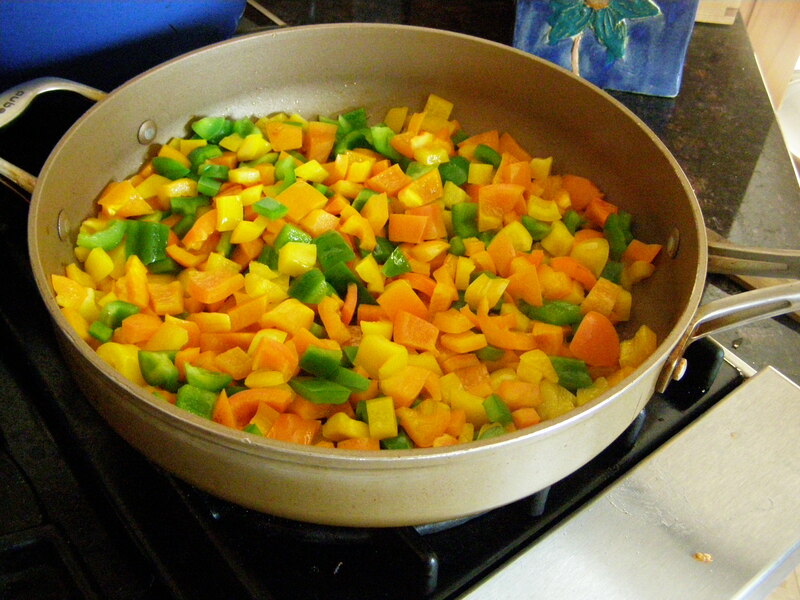 Mix any colour peppers cut in squares into a frying pan with slices of bacon cut in four and slices of sweet onion. Sauté on fairly high heat about 5 minutes. Drain the fat. Enjoy! 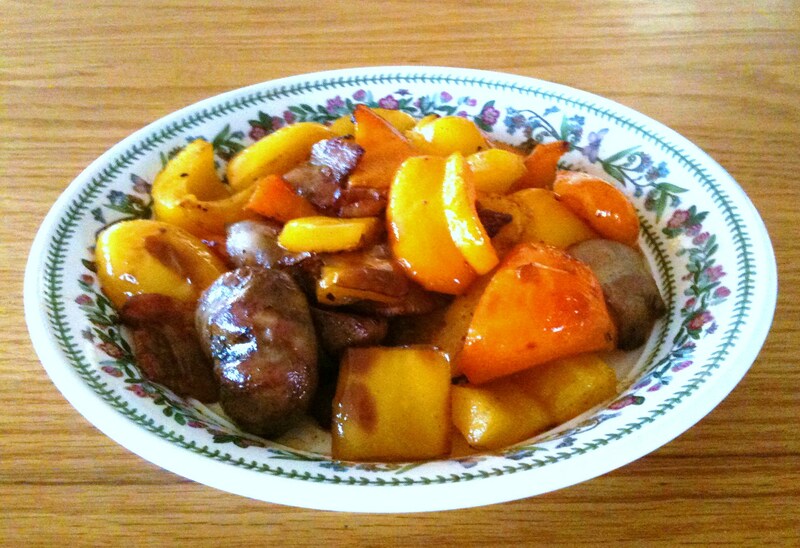 I also added some fresh lamb kidneys cut in half and barbecued about 5 minutes to make it a full meal. 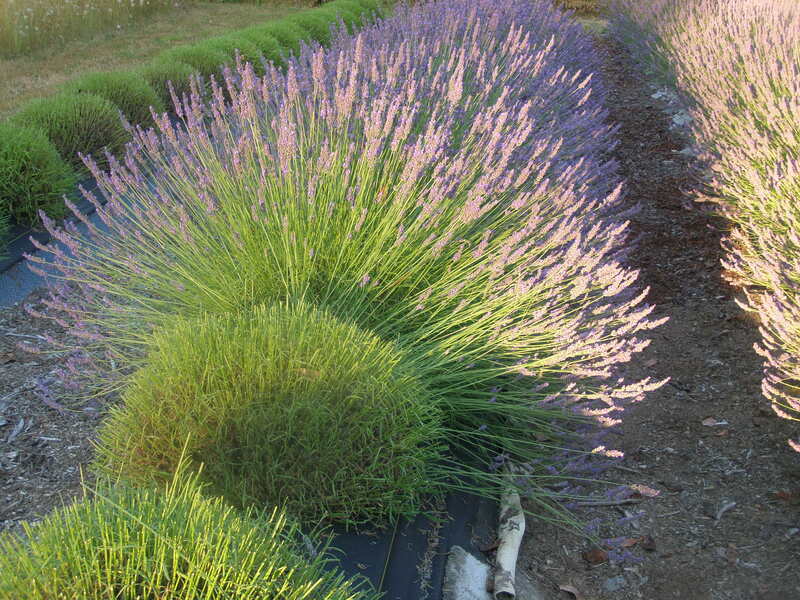 A little thyme is lovely as well. And the juice of half a lemon adds a little tang. Do not cover or the peppers will become soft instead of crunchy. 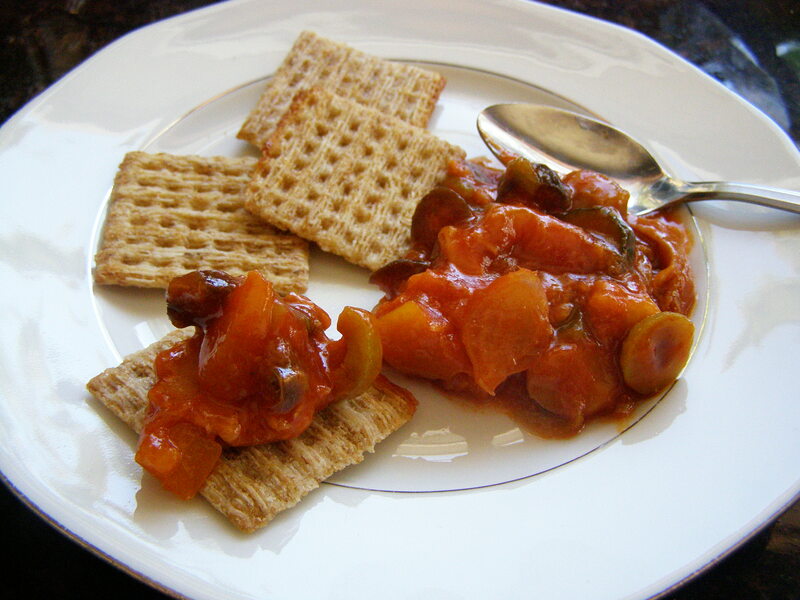 Reminder: now is the time to make your apricot jam, the apricots are just about perfect. When a Quebec grocery store opened a shipment of lobsters, one of the crustaceans looked like it had already been boiled and was ready to eat — until it started to move. France Dauphin, who has worked in the fish department at the Trois-Rivières IGA for seven years, said she was taken aback when she opened the shipment. “I found it, and ‘Hey, what’s that! Is it cooked? No, it’s alive!’ ” she laughed, and said that no one at the store had ever seen a lobster like that. It wasn’t a zombie lobster, back from the boiling pot to terrorize bib-wearing diners, just a genetic rarity — only one in 10 million lobsters get that just-cooked look on their shell naturally. The lobster was named Youppi, after the ginger-furred mascot of the old Montreal Expos who now cheers for the Montreal Canadiens. Ms. Dauphin said the store isn’t sure where the lobster came from, but most of their lobsters come from Nova Scotia, and all of them are from Canada. Though many customers have tried, the IGA isn’t planning on selling the rare crustacean and are working on finding it a new home, most likely at the New Brunswick Aquarium and Marine Centre in Shippigan, about 10 hours away. For now, it is kept in a tank with the other normal green and brown lobsters, where it enjoys a diet of shrimp twice a day, which staff drop into the water right in front of it. This reminds me of a Paul Bocuse prank years ago. During a tour of a famous friend and restaurateur’s kitchen, he was alone for a few seconds with the most junior apprentice who was looking at a crate of lobster and at the large cauldron of boiling broth on the stove, gathering the poise to start the killing. Bocuse sensing his hesitation, said to him : Ah, you do know what to do with the lobsters, don’t you! You dip them in the pot one by one and if they turn red, they are bad, so you discard them immediately. The few words of encouragements seem to motivate the clueless youngster who proceeded to throw the lobsters one by one in the pot, looked for the change of color, and verifying that they were not staying dark but turning red very quickly, discarded them all to the large garbage, convinced that they were bad. No need to tell you what color his ears turned when the Chef appeared a few moments later and had no lobster left for the prep! It used to be that there were no really good tomatoes until the middle of summer, the kind that ripened on the plant in dry heat under the hot sun. 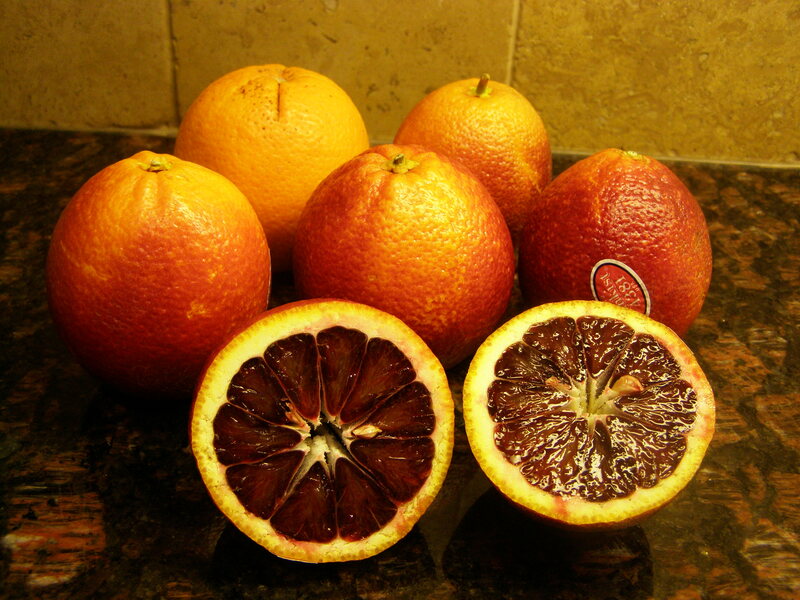 They were firm, really red, sweet but with still a bit of acidity, juicy but not watery and not overwhelmed by seeds. Heaven if you put the right dressing on them. Yesterday, I made a salad with Heirloom tomatoes, closed my eyes and had this flash back to my grandmother’s house in the French Alps. 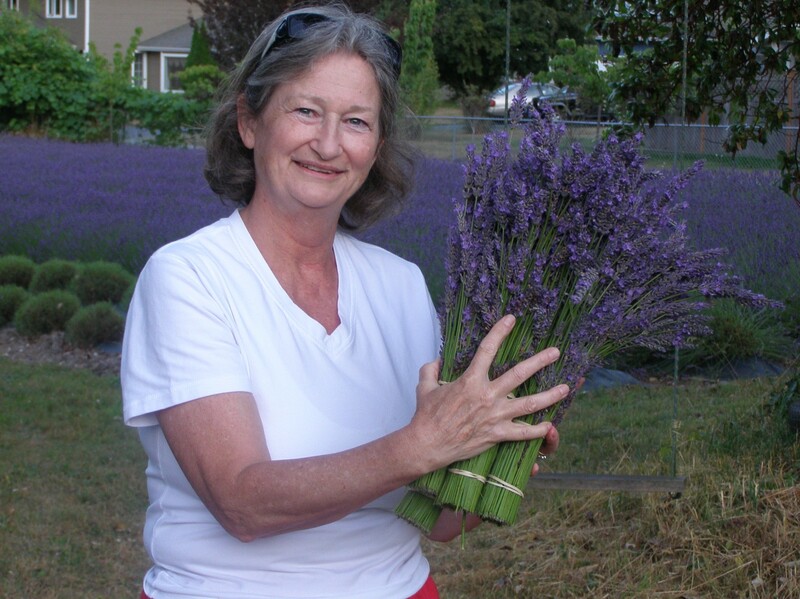 She grew all her own vegetables on a 2 acre lot and also kept a couple dozen chicken. When my grand-father had sold their farm, he had written in the contract that the new farmer would pay him cash the day of the transaction and also in kind with the yields of the farm until the day he died. So for the remaining of their life, my grand-parents received a liter of milk and wine (pretty rough plunk actually, but made great vinegar and good enough for the daily toast with the mailman) per day, bushels of corn, potatoes, and what not. So with all this, they were pretty well set, but I digress. 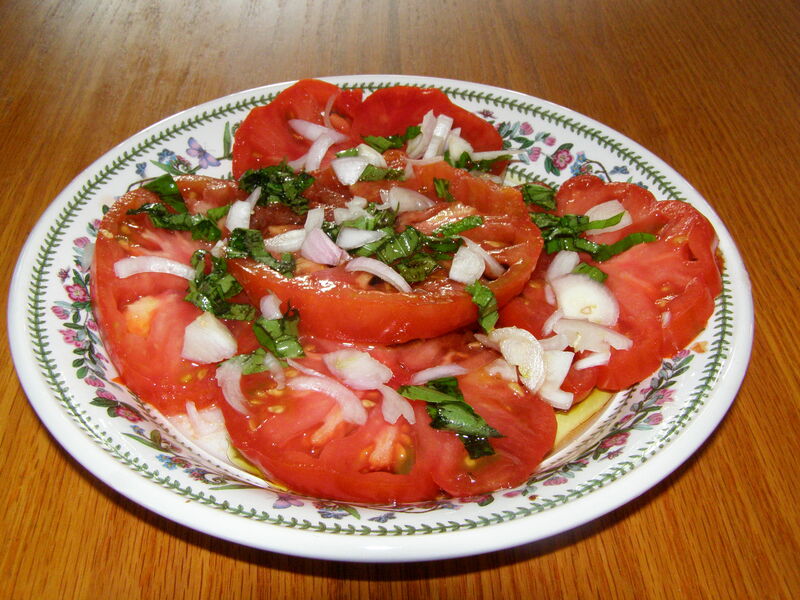 I should go back to the best tomato salad. The dressing is made of 1 tbsp of really good red wine vinegar and 1 tbsp balsamic, 5 tbsp extra-virgin olive oil, one shallot chopped very fine, salt and pepper. 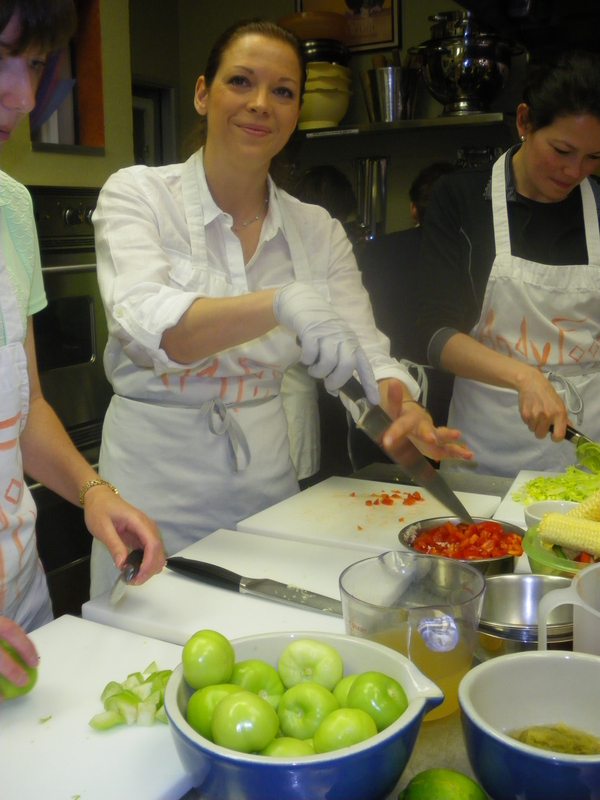 Mix together, add the tomatoes cut in thick slices and sprinkle with chopped basil or curly parsley. Stir gently just before eating. Fresh green beans can be added. Baguette should be close by to sponge leftover dressing. Tis the season to get in the woods and pick edible greens. 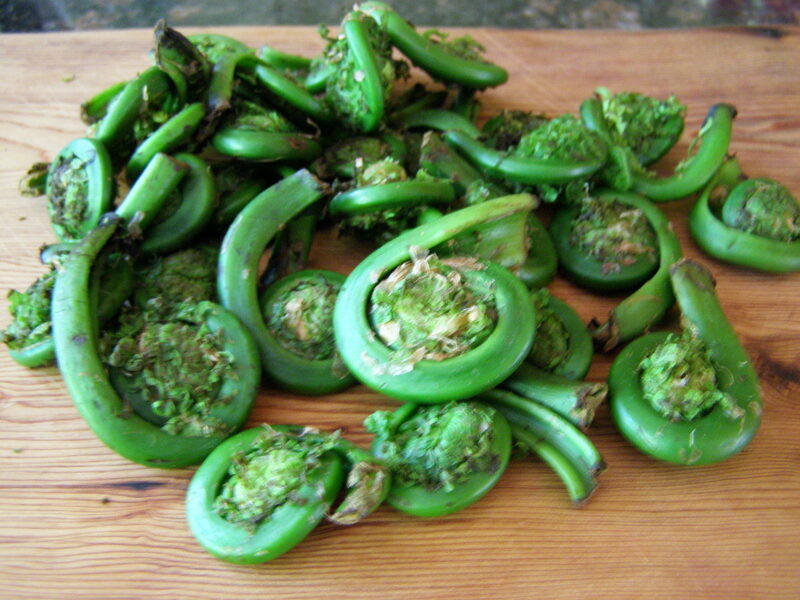 Fiddleheads (or crosses de fougères in French) are a delicious vegetables full of vitamins. They must be picked while they are still completely rolled up, and only the curled part is eaten. 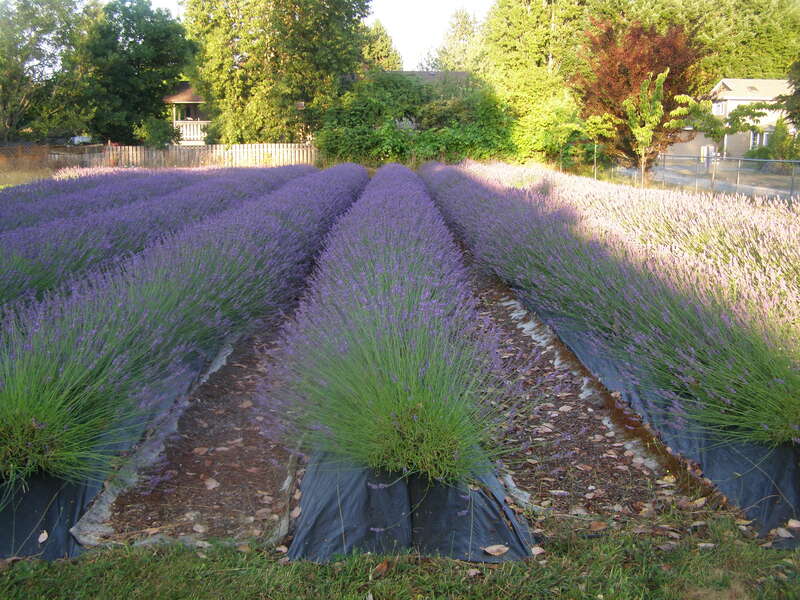 They are mostly found in woods close to creeks and the earlier they are picked, the better. They are worth a Sunday outing as they are very expensive in stores as they do not keep well. Best to cut them up with scissors, then wash them thoroughly and remove all brown parts. Cook them 6 minutes in lots of boiling salted water, drain them and rinse them again. 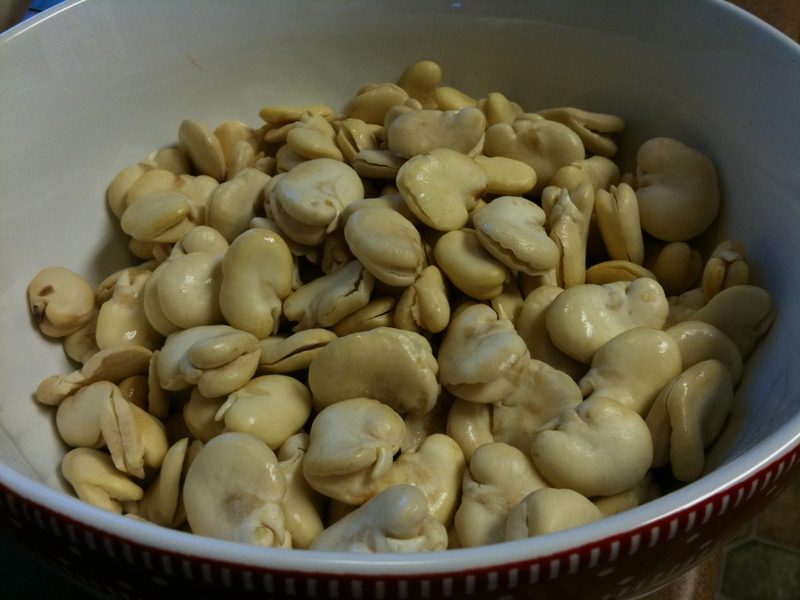 Also, shell the Fava beans and cook them 2 minutes in salted boiling water, rinse under cold water and remove the peels. If you pierce the other end, the beans will slide out of the peel easily by pressing at the germ end. 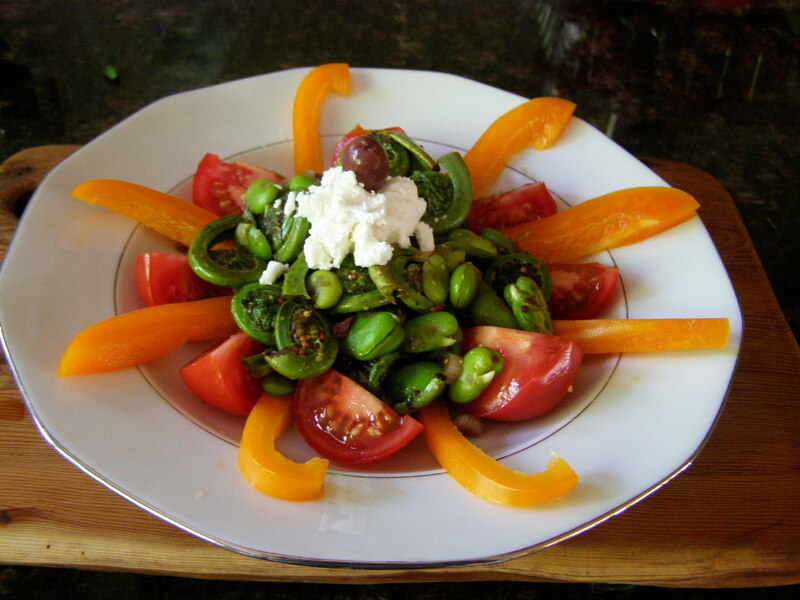 To make the salad, start a pan with 2 tbsp olive oil on medium heat and sauté the beans and fiddleheads together for 2 minutes. 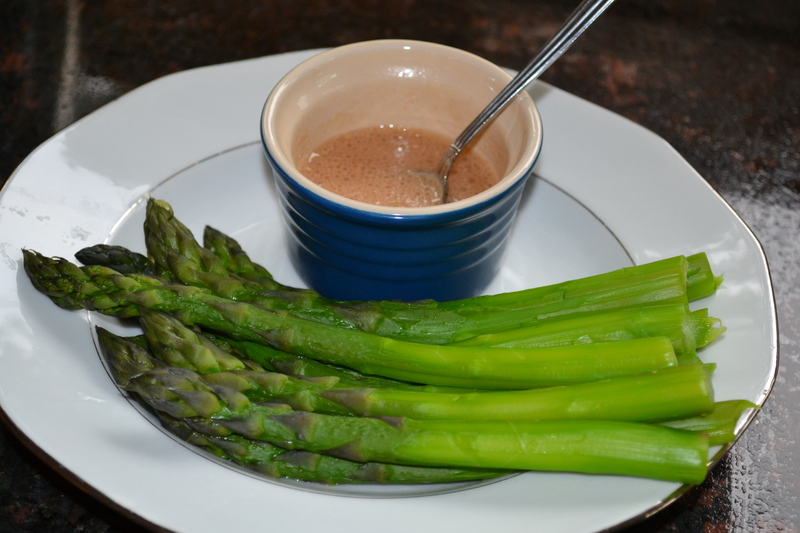 Add 2 tbsp balsamic, 1 tbsp Dijon grainy mustard, 3 sliced green onions, the juice of half a lemon and stir well. 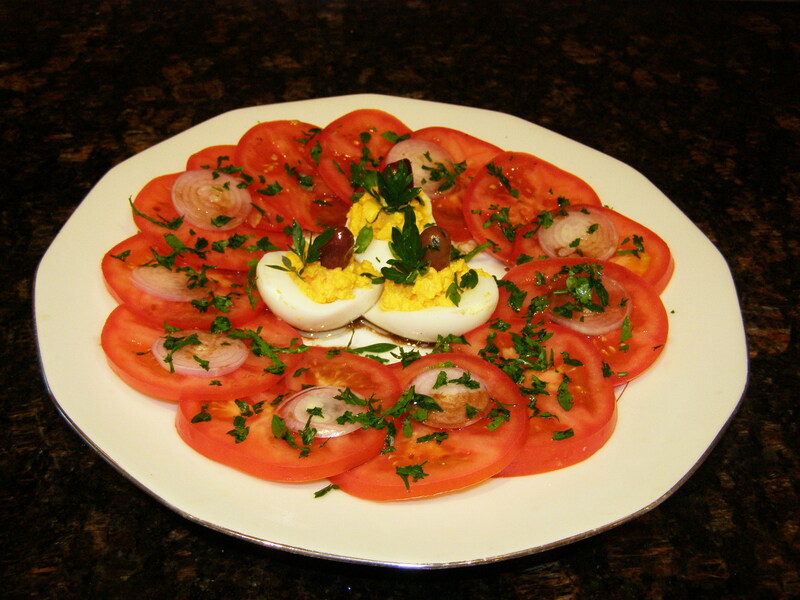 Serve in a plate decorated with Campari tomatoes. Add fresh ground pepper! Goat cheese is a nice addition and maybe pine nuts. 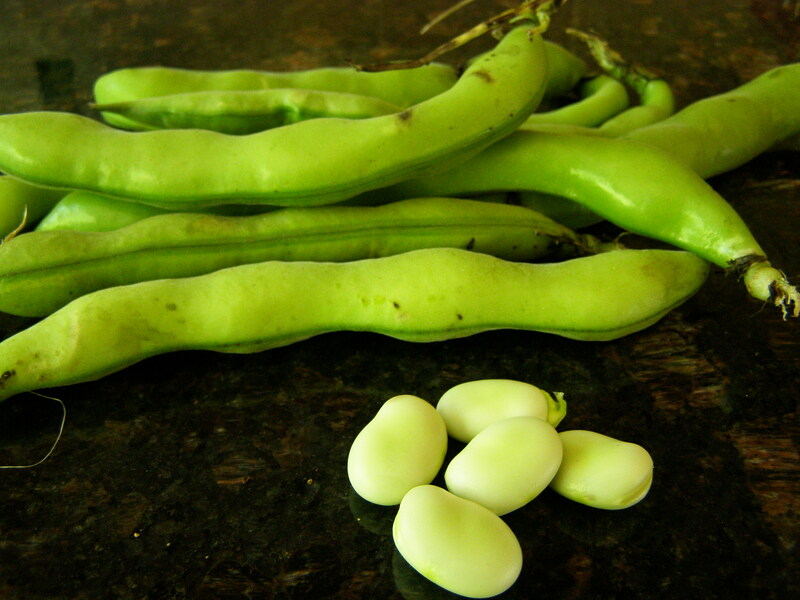 If you can’t find fresh fava, frozen Edamame beans are a good substitute. Not that we are necessarily poorer up North in Canada, it is just that our local Pacific Fanny Bay oysters are usually sold shucked and not in the shell. So no way to bake them on the half shell. 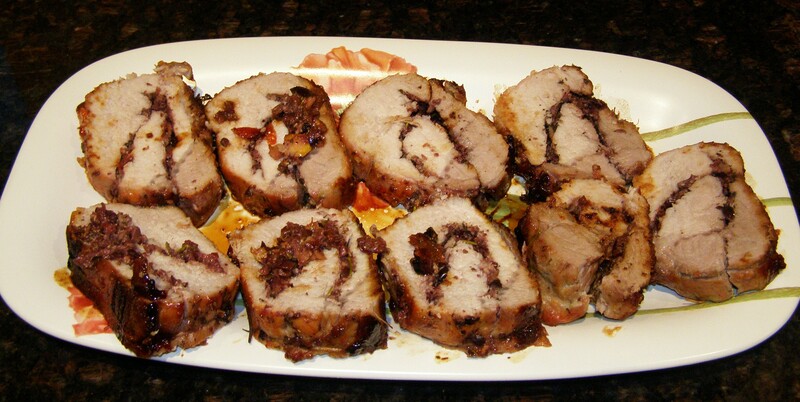 It is a splendid dish with a glamorous name and it would do well on Mother’s day as even the most novice cook would have no trouble putting it together. 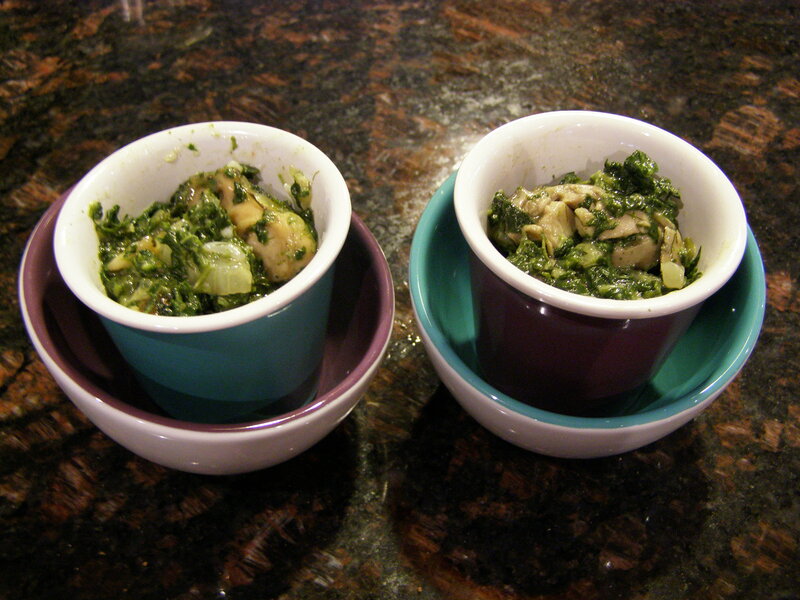 One 16 oz container of shucked oysters (it contained 24), one head of fennel, fresh or frozen spinach, 1/2 an onion, a clove garlic, 1/2 cup cream, a slice of bacon, a splash of hot sauce or Cayenne pepper and grated cheese is all what you need. First chop the fennel and the onion and saute them on medium heat in olive oil for about five minutes, add the spinach, salt, and cook another 5 minutes. Empty the frying pan into a gratin dish. Add the bacon cut into lardon size bits and a little more oil and the chopped garlic, with the drained oysters and fry for about 5-7 minutes on high. Add the hot sauce or Cayenne ( and if you like anise , a tbsp of Ricard or Pernod or 1/4 tsp ground anise seeds). Add the cream and 1 tbsp tapioca flour or other flour and thicken. Add salt and pepper. 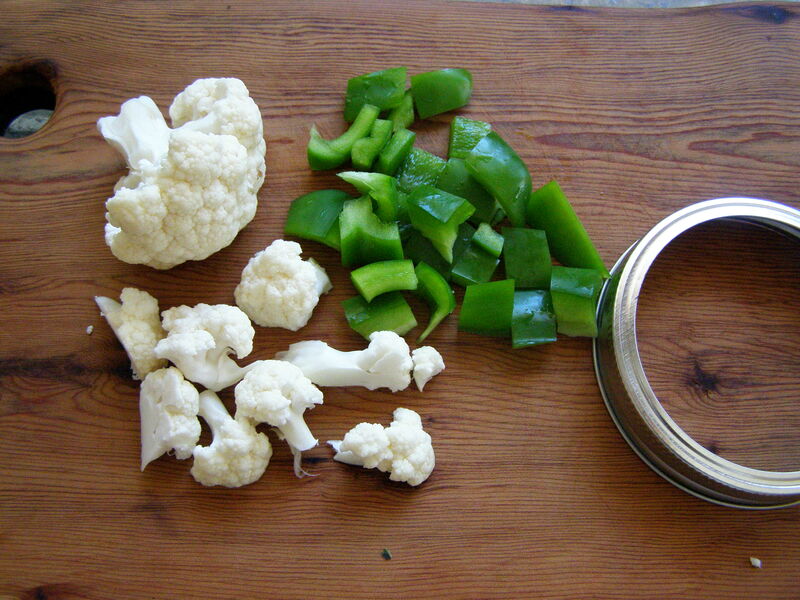 Transfer to the gratin dish and stir with the vegetables. Cover with a thin layer of fine bread crumbs ( optional) and grated cheese (not much) and broil 5 minutes or until lightly brown. 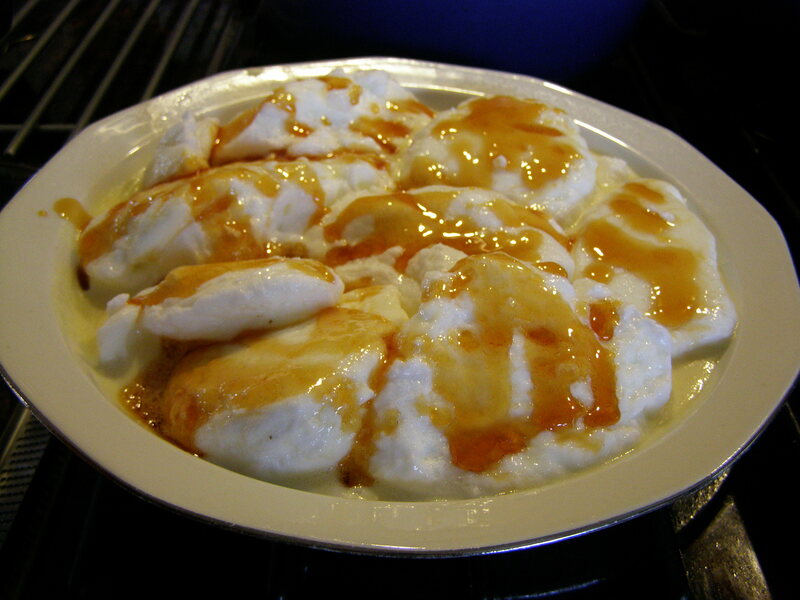 Serve with rice as a main course or in small ramequins as an appetizer, eat with your eyes closed. Happy Mother’s day! Note: If you have to shuck oysters, it helps to put them 10 minutes in the freezer to relax the muscle and make it easier to open the shell. 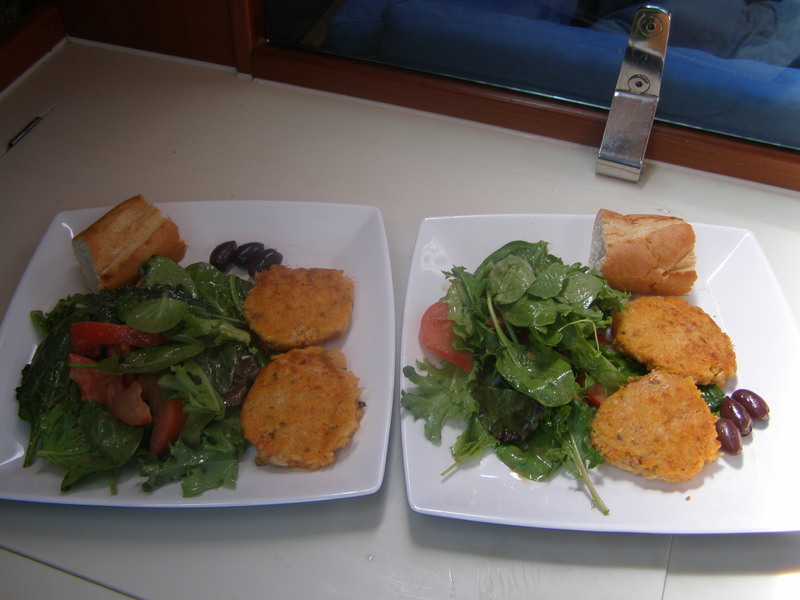 The dish was called after Rockefeller because it is so rich. Butter can be used instead of cream to make it even richer. Supermarkets in North America are having giant turkey sales for Easter. They could give it to me for free and I would not want it. 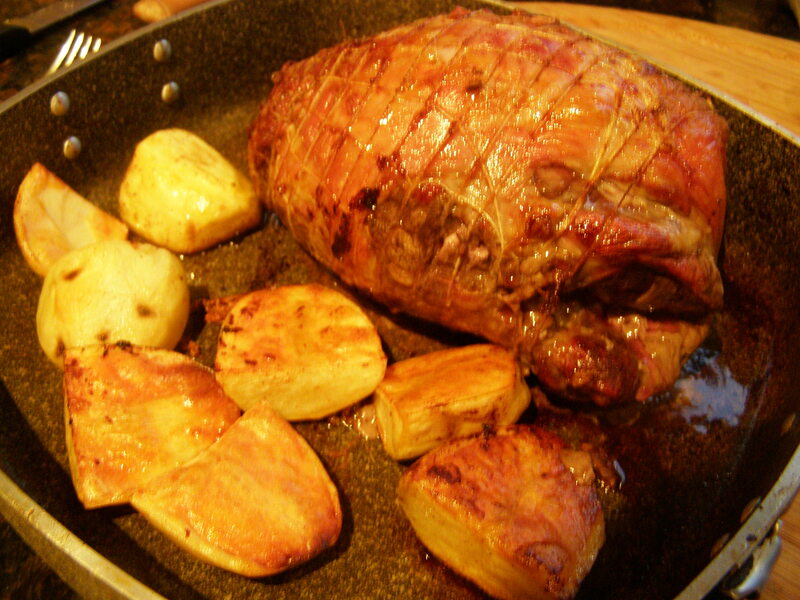 I cannot celebrate Easter without a spring lamb roast. We used to have the full leg, bone in, but I have just tested a recipe which is perfect for a smaller crowd. I bought a boned leg of fresh New Zealand spring lamb, about 3 pounds and wrapped in elastic mesh. I took it out of the fridge two hours prior and removed the mesh carefully without cutting it. Then, I opened the leg as best as I could and stuffed it with 2 cloves crushed garlic, 2 tbsps grainy mustard and 2 tbsps of fresh goat cheese, 1 sprig of rosemary. The hardest part was to put the mesh back around the roast. It cooked for about 1 hour and 1/4 at 360 to a perfect pink. 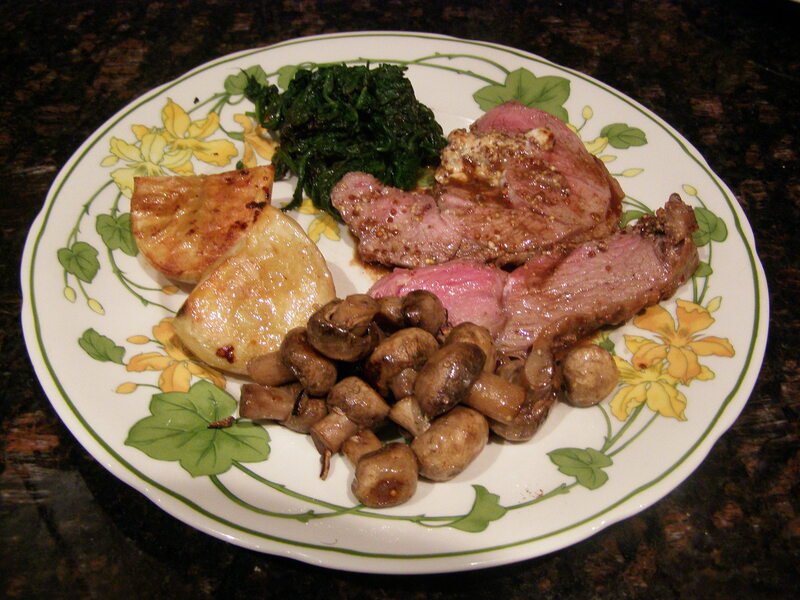 I served it with potatoes, button mushrooms, cooked arugula sprinkled with balsamic and onion jam. I poured the jus from slicing the roast back in the pan and that made for a wonderful brown gravy combined with the mustard and goat cheese that had leaked from the stuffing. No need to add anything but salt and pepper. The meat was tender and very tasty. 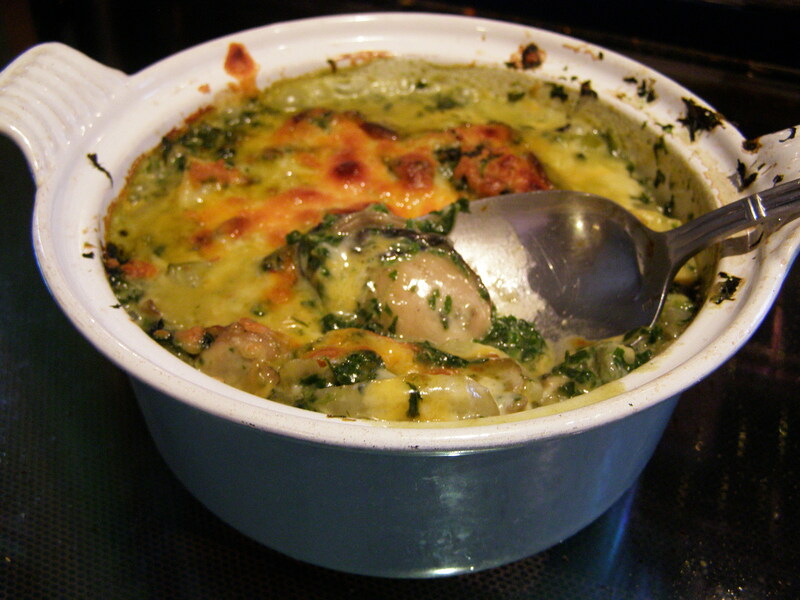 For Easter, I will serve it with gratin Dauphinois! 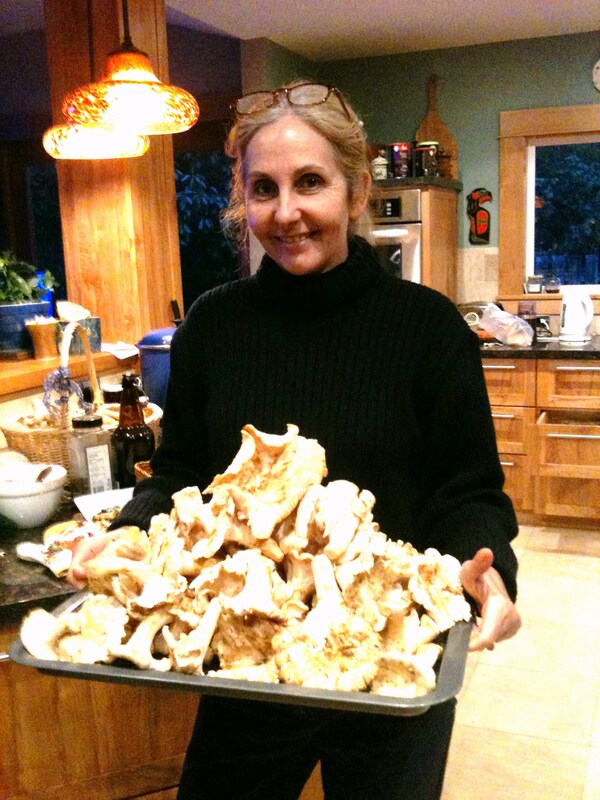 The morels are not out on Vancouver Island and this is a good time of year for recipes with white mushroom. 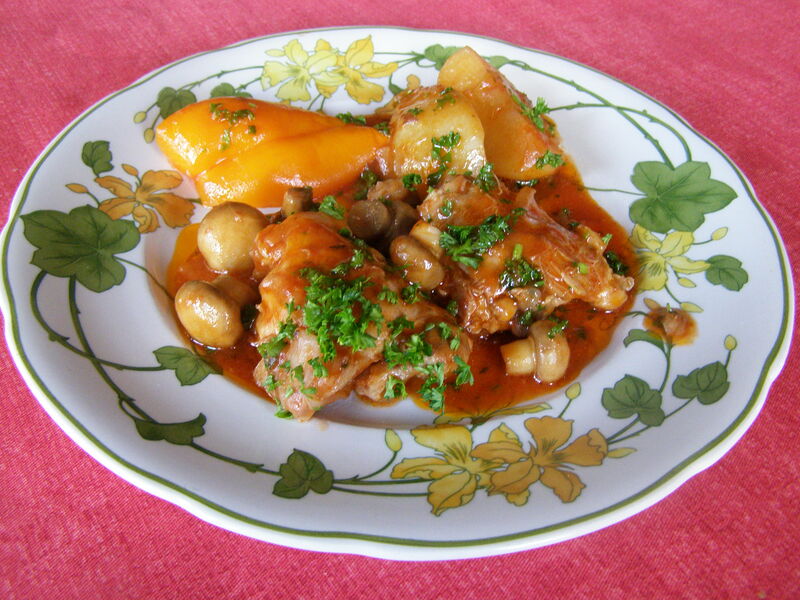 I found some baby white mushroom the other day at the grocer and that put me in the mood for Poulet Chasseur, a popular recipe when I was a kid. 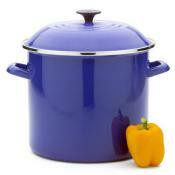 In a large Le Creuset pot, brown the skinned pieces of chicken in olive oil or other type of fat. I like to use thighs, but there is no rule. Add 3 cloves garlic and a half a big chopped onion, cook another 2 minutes on high and then, add a cup of whole baby white mushroom, thyme, one bay leaf, salt and pepper, one cup of white wine, 1/2 cup of stock, 1 tbsp red wine vinegar, 1/2 cup of black pitted olives. Stir well and add potatoes cut in half on top. Cover and simmer until the potatoes are done. Remove the potatoes and keep them hot. 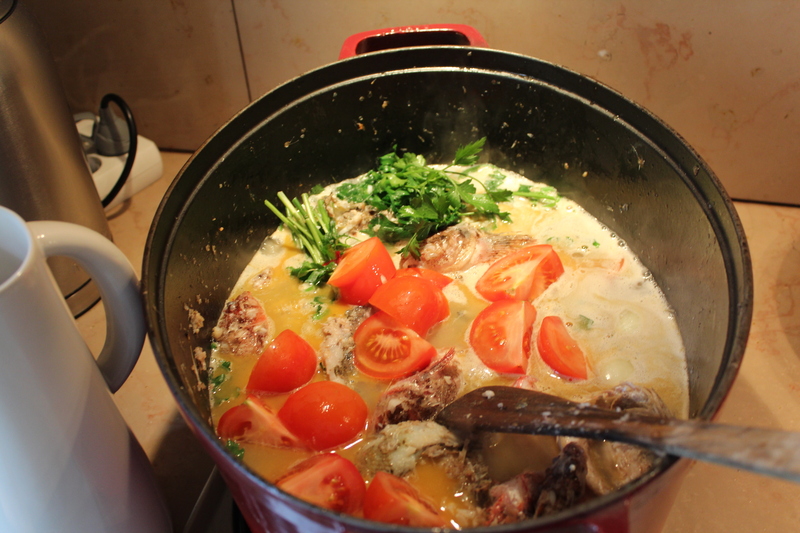 Add half a can of tomato paste, one tbsp tapioca or regular flour and more stock if needed. Add a quarter cup of chopped parsley. Stir well, thicken 5 minutes. 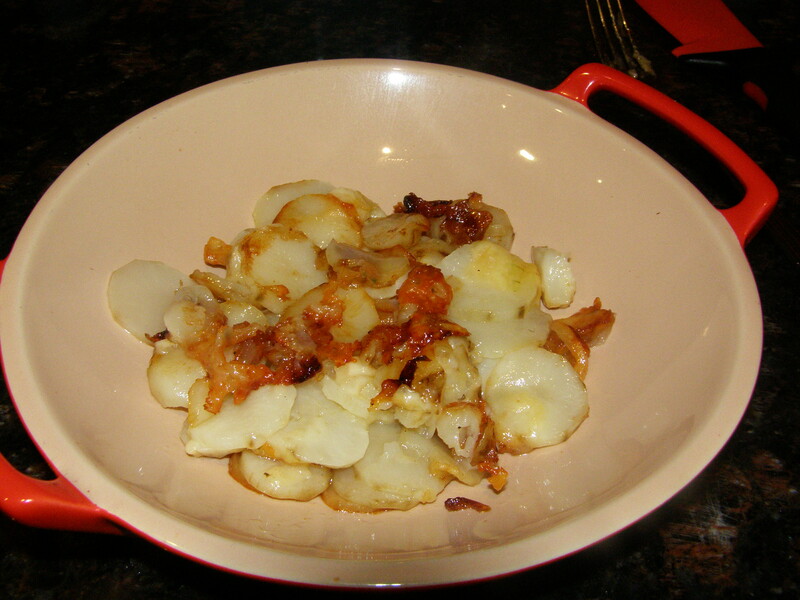 Serve on hot plates with the potatoes. 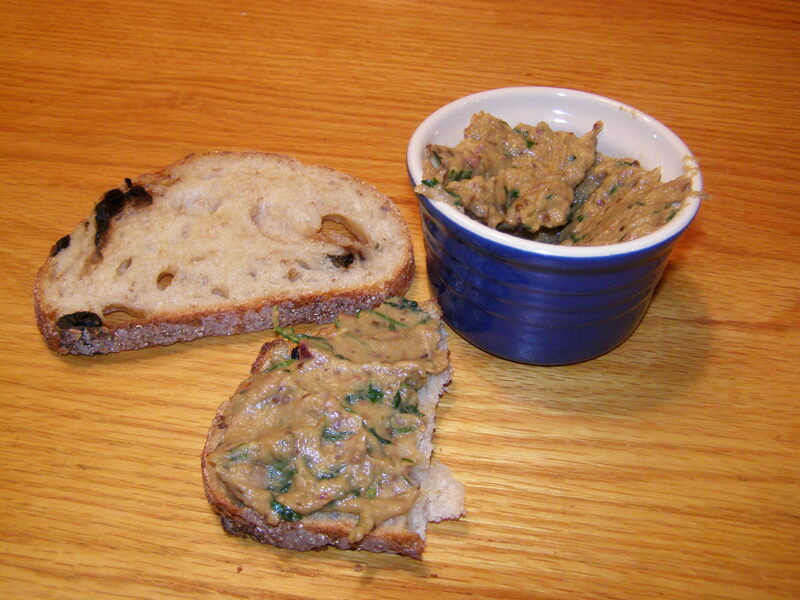 The sauce should be a nice reddish brown, the kind in which you can’t help but dip your bread! Some will add a sprinkle of tarragon and some Cognac at the same time as the white wine. Spring is everywhere except here in Victoria, we are craving sun and green vegetables. 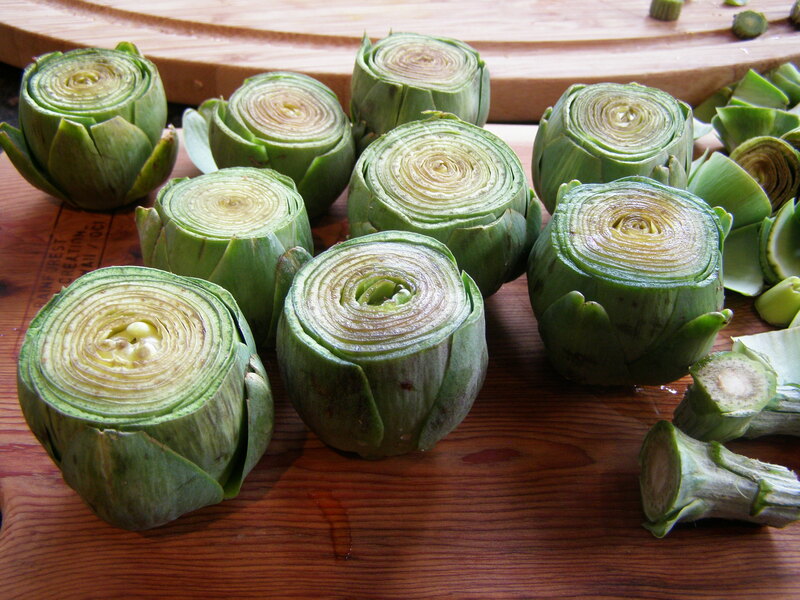 At the Root Cellar, ( you might have guessed, my favourite green grocer) I found baby fresh artichokes and thought they would be as good as a week-end in California! 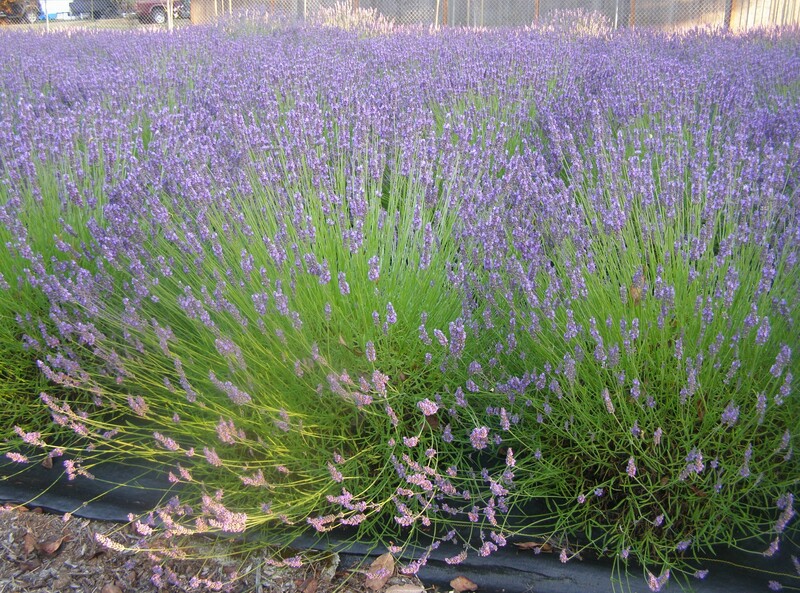 The barigoule has the best Provence aroma, it is just like eating at a bistrot by the market there or in Nappa. 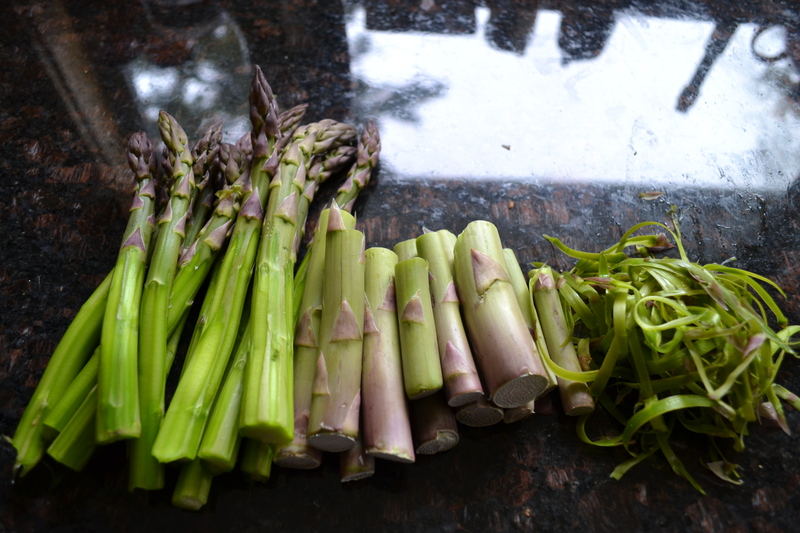 First thing to do is to rinse them well, cut the top of the leaves and the stems, rinse again. Keep the stem as they taste quite good as well, although slightly bitter. 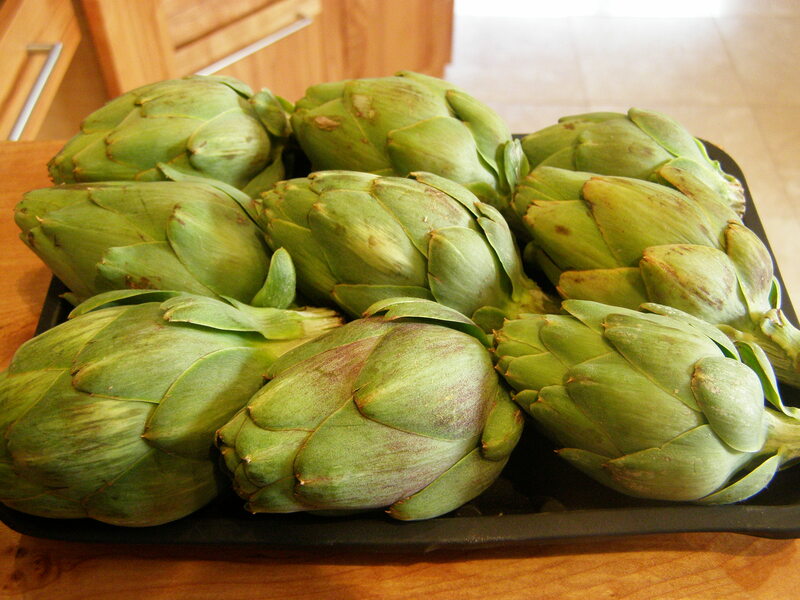 Set the artichokes in a Le Creuset pot with 1 tbsp olive oil per artichoke. 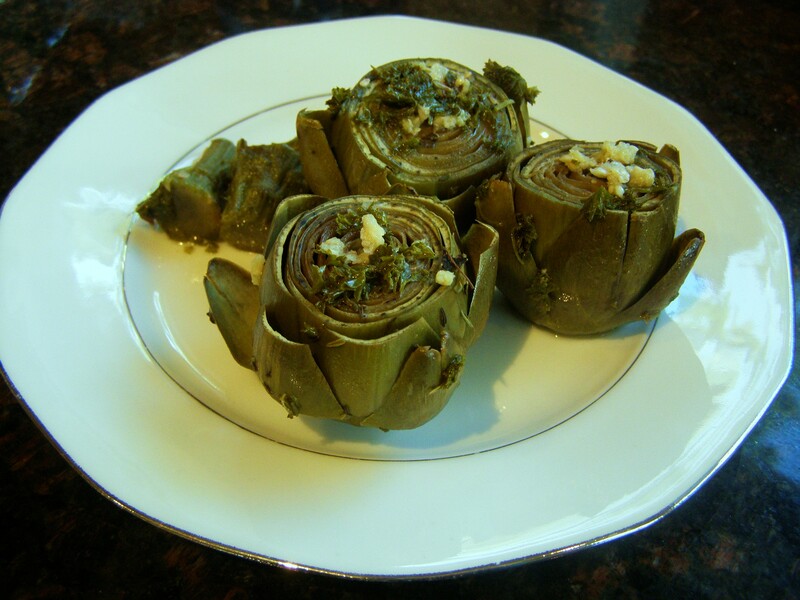 Crush one clove garlic on each artichoke after you have opened the leaves as much as possible, sprinkle with parsley, thyme. Optional in the bottom of the pot are one diced carrot, onion, a bay leaf and lardons. 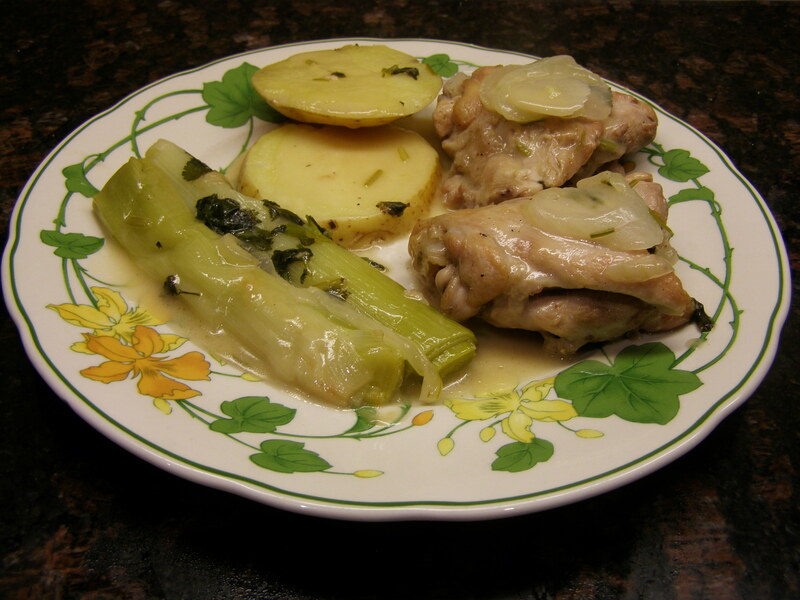 Brown lightly, then add 3 tbsp white wine and 1 tbsp lemon juice per artichoke. 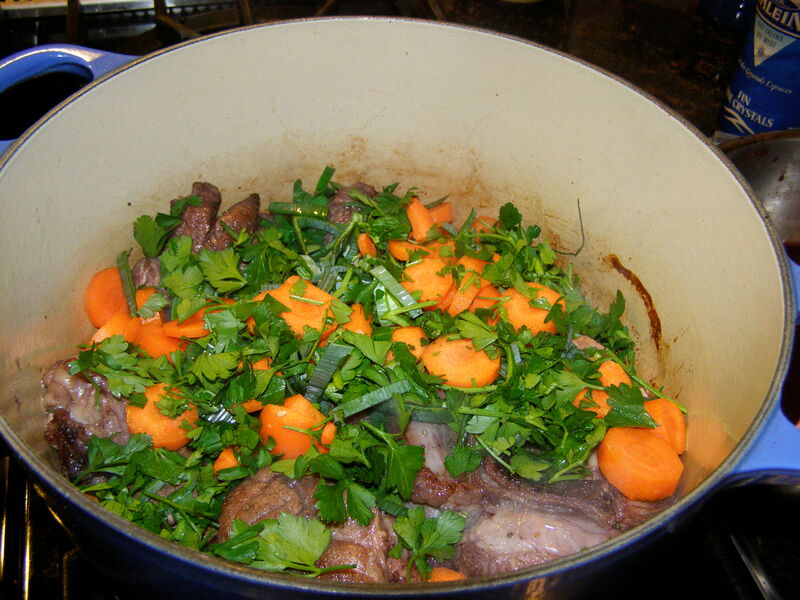 Cover and simmer until the leaves come off easily and are tender. ( A good hour, better more than less cooked). Just before serving, sprinkle with chopped basil. Serve with good dry white wine. 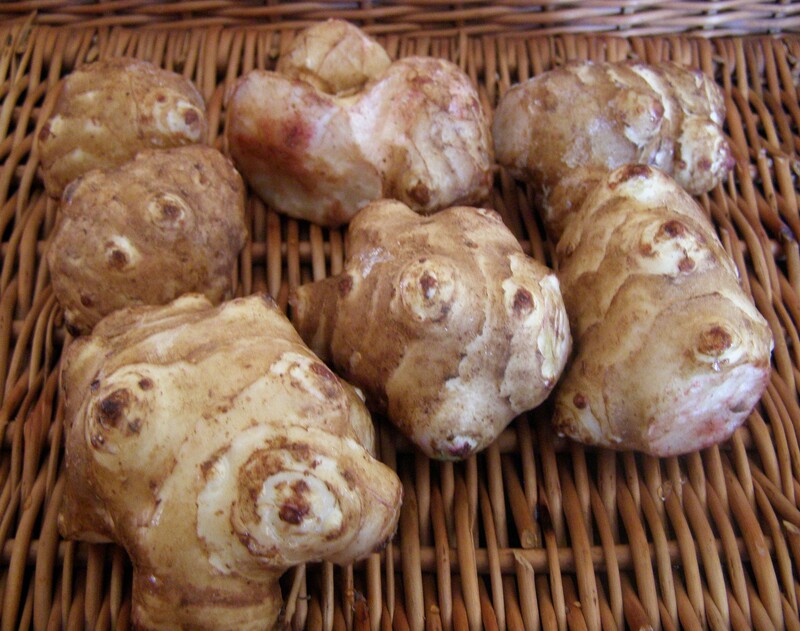 The French is topinambour, in English it used to be the Jerusalem artichoke but stores are now calling it sunchoke or sunroot, maybe because it is neither from Jerusalem nor a member of the artichoke family. It is a tuber native of North America and can be prepared basically like potatoes. It does have a more sophisticated taste though, pretty close to artichoke. I prepared them very simply so the subtle taste is not overwhelmed by strong spices. First, peel them and slice them. Slices about 2mm thick, then transfer them right away in an oven roasting disk that has a lid with 2 tbsps olive oil, a small piece of butter and 1/4 of a finely chopped sweet onion, salt and pepper. Cover and cook for about 30 minutes at 330. There is no need to add water or milk. The starch of the tubers will create a nice creamy like effect. You could sprinkle a bit of grated cheese but I did not. 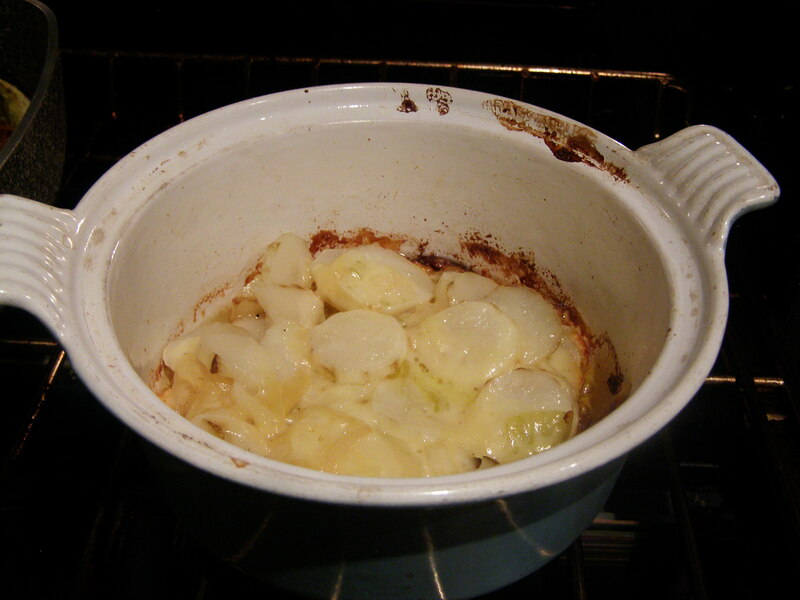 The bottom layer browned nicely so turn the gratin over when you serve. In Europe, topinambour are still considered a war vegetable like rutabagas and a lot of people who were children at that time won’t eat them. During the few years when food coupons were in effect, many grew potatoes, rutabagas and topinambours in the basement and this is basically all the vegetables they ate. 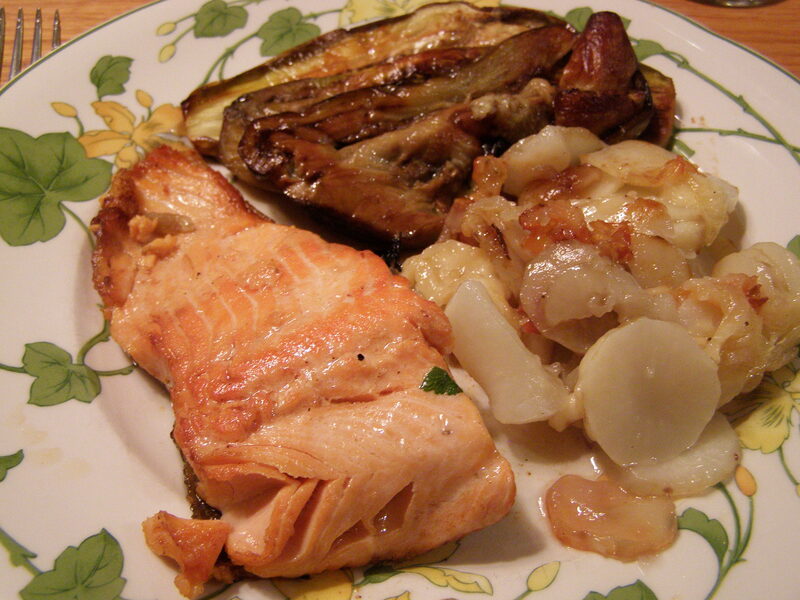 Meat allowances were a mere few ounces per week so most meals were a variation on the root vegetable theme. These vegetables had a very low profile there as a result and it is only recently that they are again featured on restaurants menus. If you are looking for “sunchokes” in Victoria, BC, the place to go is the aptly named produce market “The Root Cellar”. They have them right now. 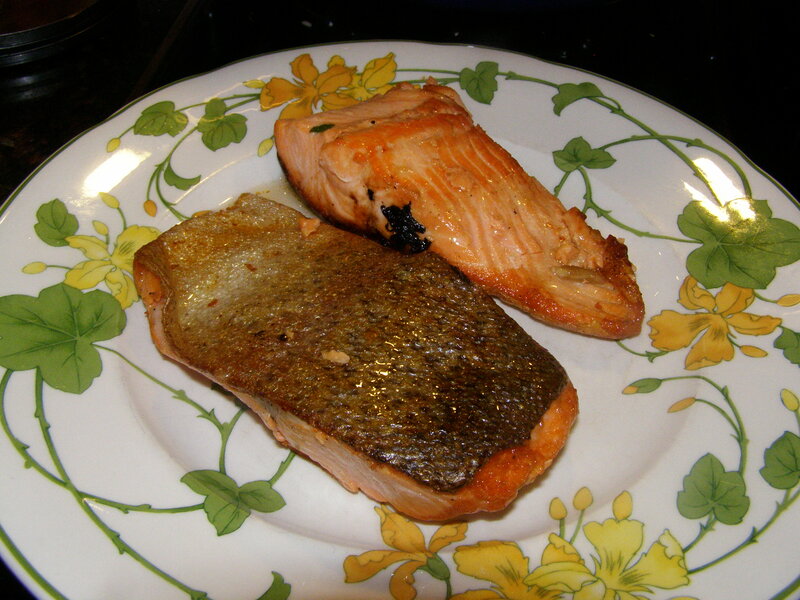 Winter is not the best time for fresh fish selection and this week the only choice was Steelhead trout. That was the reason I bought it, that it was fresh. I had not expected it to be so good. 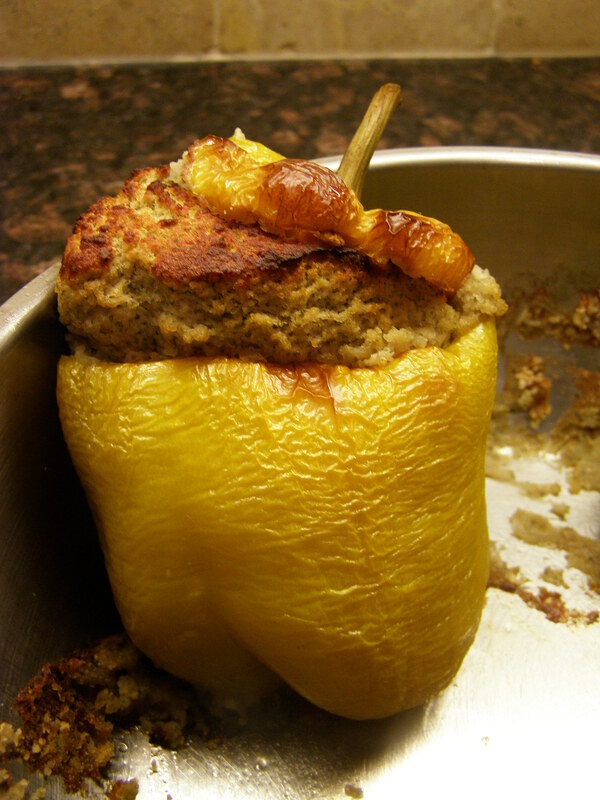 In fact, it was so surprisingly tasty, moist and easy to do that I bought it again the next day. I prepared it the same way both times, with the snow storms the BBQ is not an option. It was filetted with the skin on, I had a frying pan with 2 tbsps olive oil on the highest setting, added the fish, skin side down first, browned them well so the skin would be crispy, turn them over, turned the heat down to medium for another 2 minutes, added the juice of half a lemon and served with Jerusalem artichokes and eggplant. All very subtle flavors not overwhelming the trout. 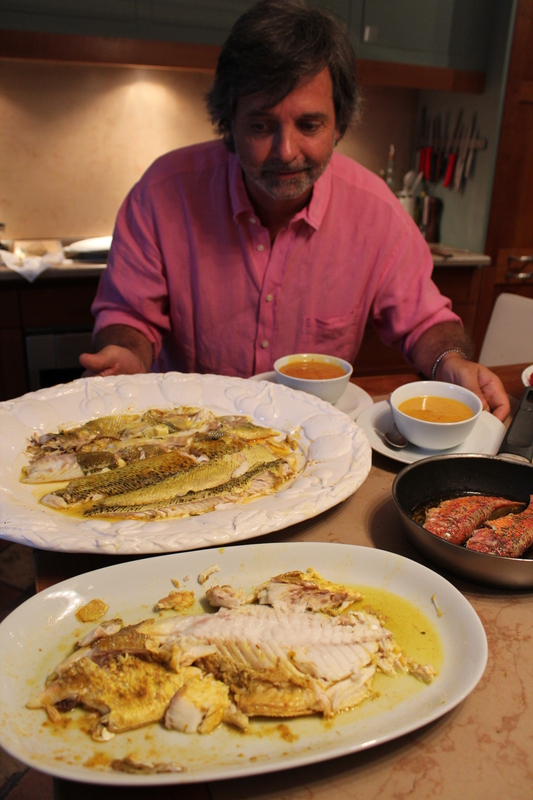 The fish should be at room temperature at the time of cooking. 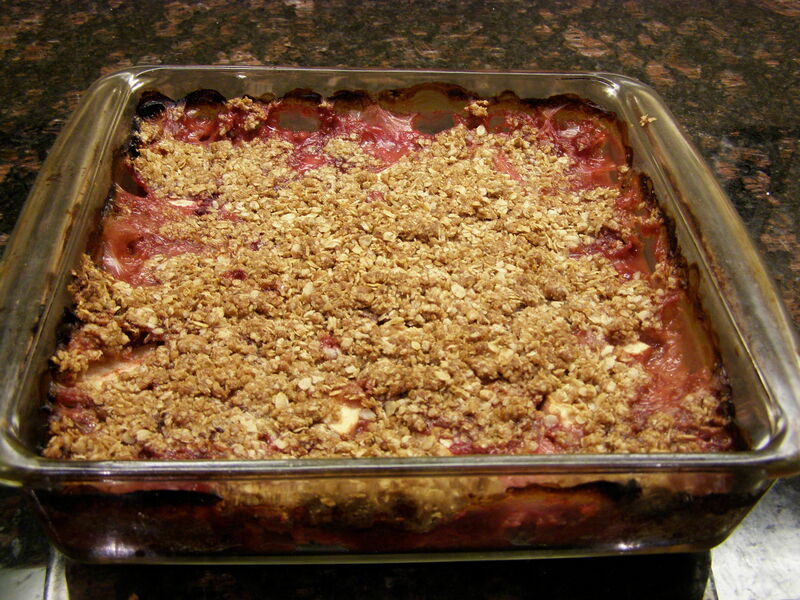 It is cooked very quickly and the flakes should still be a bit translucent when you serve. Hot plates are highly recommended. If the filet was scaled properly, the skin is delicious to eat. The Caviar of the poor, it’s eggplant! 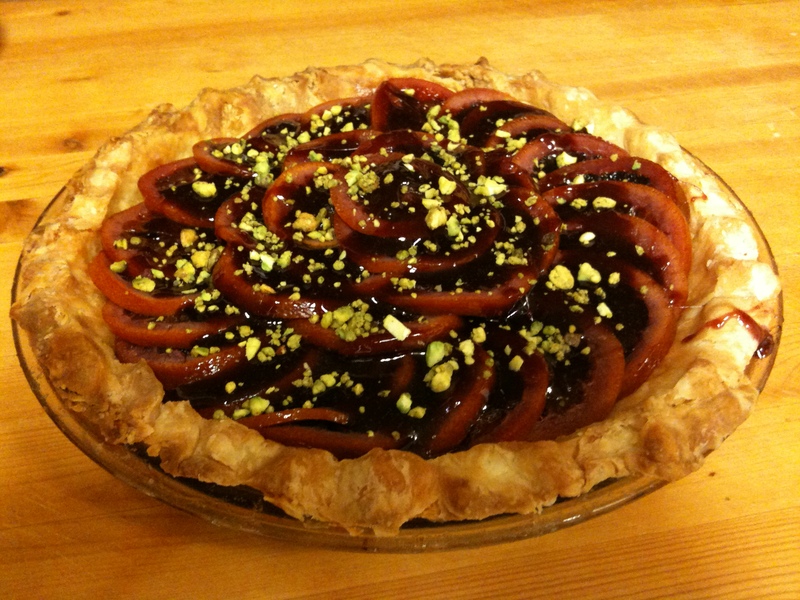 I have been thinking about old family recipes, traditions I could pass on. This one came from my Aunt Marie-Paule, born in the Savoie region and a pharmacist in Paris for most of life. She bought her own small community pharmacy and did not have much money left after the payments, but she liked good food, was a fabulous cook and this was one of her favorite rants, “le caviar du pauvre”. La pauvre, it was her! The name caviar came from the eggplant or aubergine seeds, which create an illusion of the eggplant being a roe like fish caviar. You need three eggplants, fresh and firm. They will peel well with a Y-shaped potato peeler. 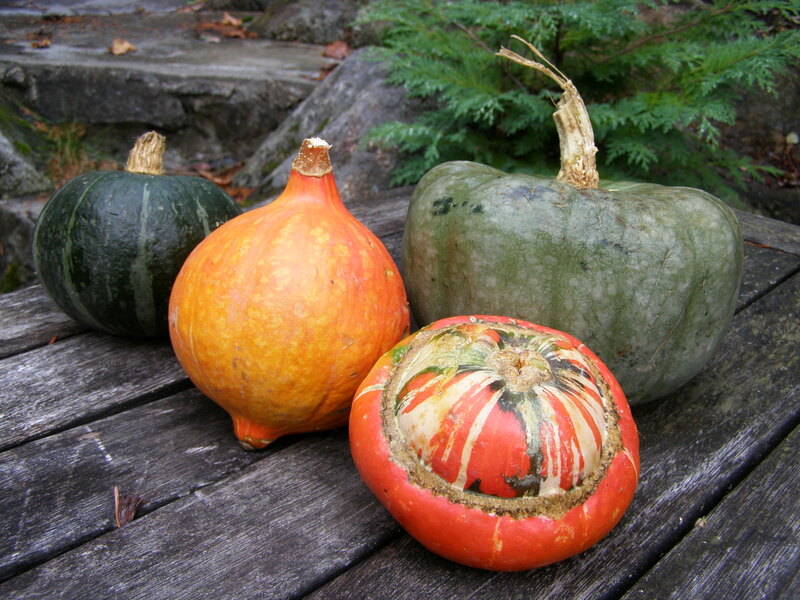 Once peeled, slice them but do not remove the seeds. 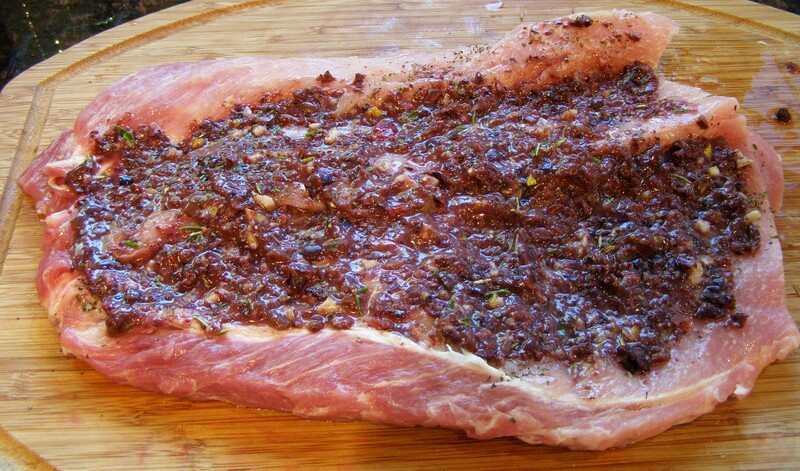 Spread the slices on a cookie sheet, salt, sprinkle with thyme and drizzle with olive oil, and roast for an hour at 340. Layers are okay, just turn the slices over half way. Do not let them burn (use foil protection if necessary) but brown is good. Chop 1/4 cup parsley, 1/2 sweet onion, 4 cloves garlic with 3 tbsps olive oil, the juice of half a lemon, hot sauce to taste, 10 black olives and the cooked eggplant in the food processor. Make sure to stop before it is puréed, so you can feel the eggplant seeds, the caviar! I bought a jar of caviar d’aubergine, recette méditerranéenne, when I was last in France, they seem to use the same ingredients, but the texture was too fine and it was not nearly as good as made from scratch. Because they sold it at the price of real caviar, or almost, I guarantee you that the result is well worth the trouble of roasting a few eggplants. Eat cold with rustic bread or make a bruschetta. This yields about two small mason jars. Doesn’t “Slow cooked beef shanks” sound a lot more complicated and fancy than “beef stew” or “boeuf bourguignon”? Well it does, but it is not! This is a very easy to cook dinner with incredible flavours. The meat is tender and moist and the preparation does not involve the typical Julia Child “turn the house upside down” requirements. I made this last night and it tasted just like the right thing to offset the Arctic air passing through right now. 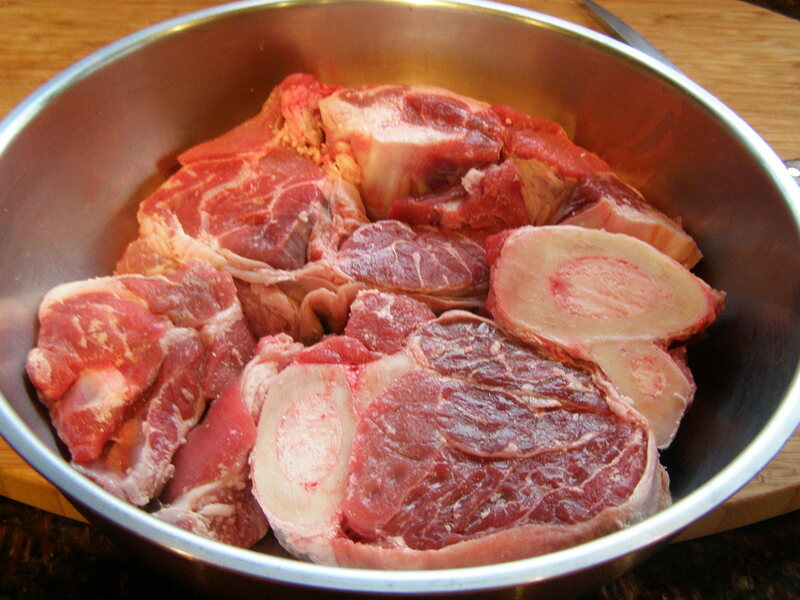 Buy beef shanks cut in thick slices with the bone attached. Marinate them in two cups of red wine, 1 tsp sugar, 1 clove garlic, 1/2 bay leaf, thyme, for one hour. Pat the meat dry, then brown the meat in a cocotte Le Creuset on high with olive oil. 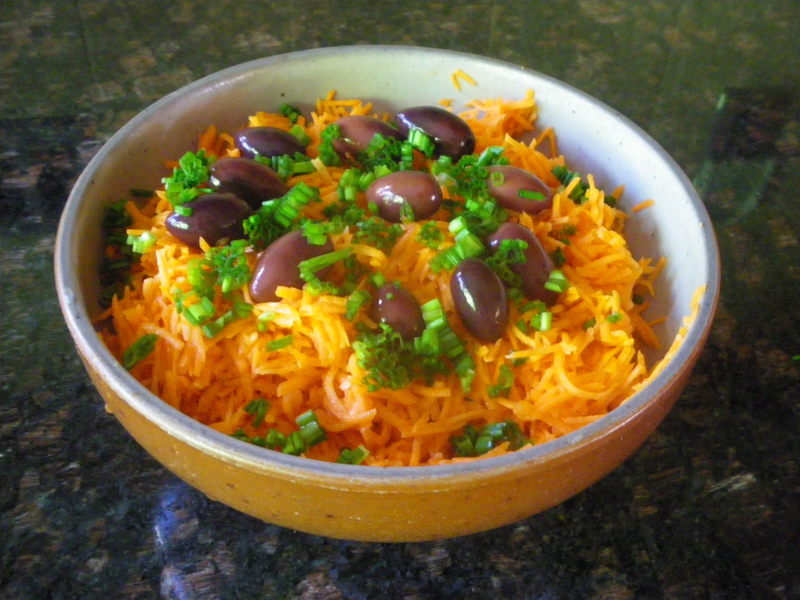 After 3 minutes on each side, add the marinade, 2 sliced carrots, 2 cloves garlic, 1/2 sliced onion, 2 pieces of orange peel, 1/4 cup chopped parsley, 1/2 cup finely chopped sliced leek greens, 1/4 tsp ground anise seeds, 1 tbsp sun-dried tomatoes, black olives, and the stalks of a fenel , chopped very fine. 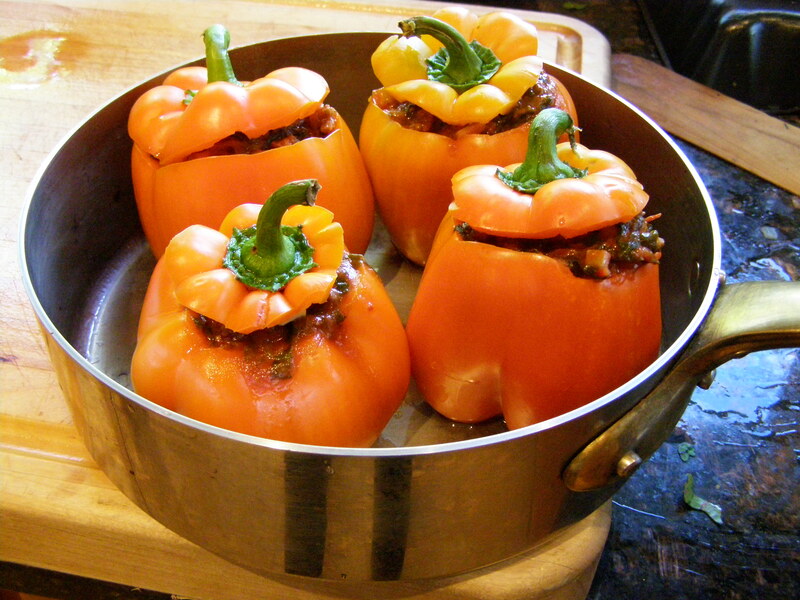 Add one cup of water, salt and pepper, cover with the lid and cook in the oven for 2 hours at 325. During the last 15 minutes of cooking add slices of potatoes in the cocotte on top of the meat. 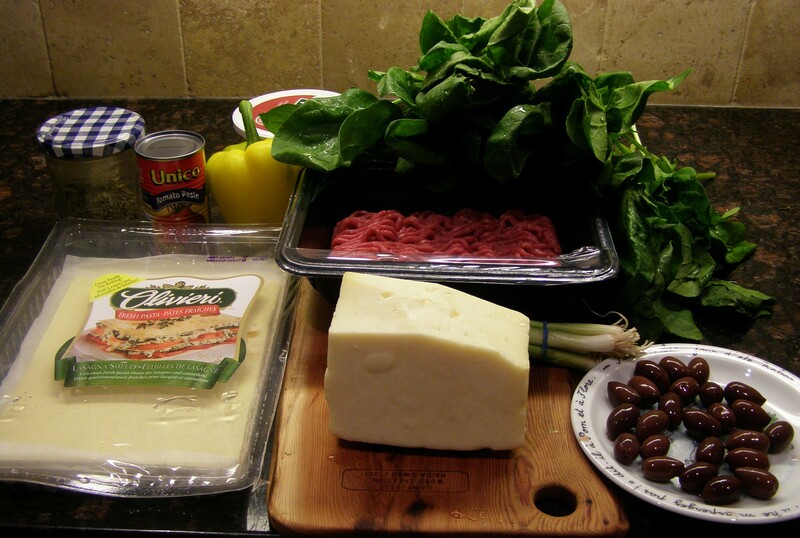 Also sauté the sliced fennel bulb and a green bell pepper and serve on the side. 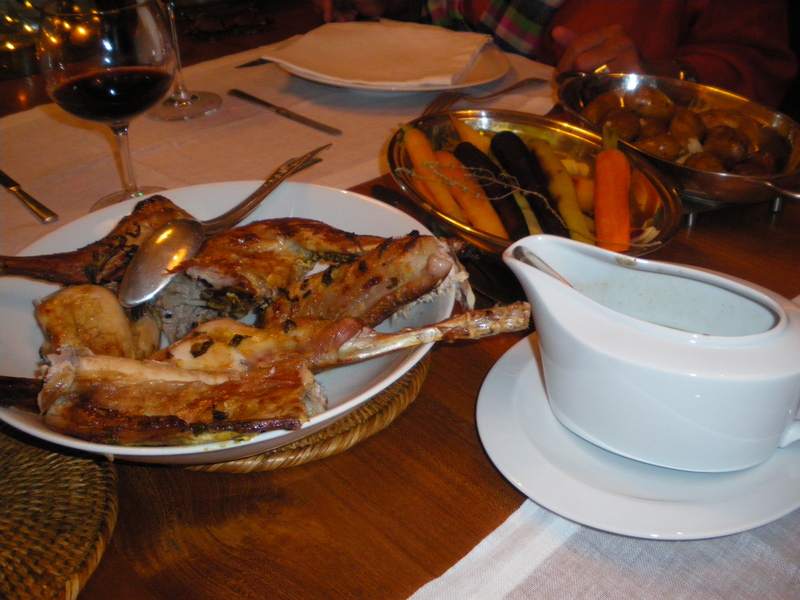 The marrow bones can be served on the plate, or you might want to empty them in the gravy. The fennel and spices added a welcome summery taste to this winter dinner. If you scroll down all the way to the bottom of this page, you will notice a new “calorie counter” in the bottom right corner. It is very neat as it will tell you not only calories, but also all the vitamins and minerals and fiber contents of almost any food. 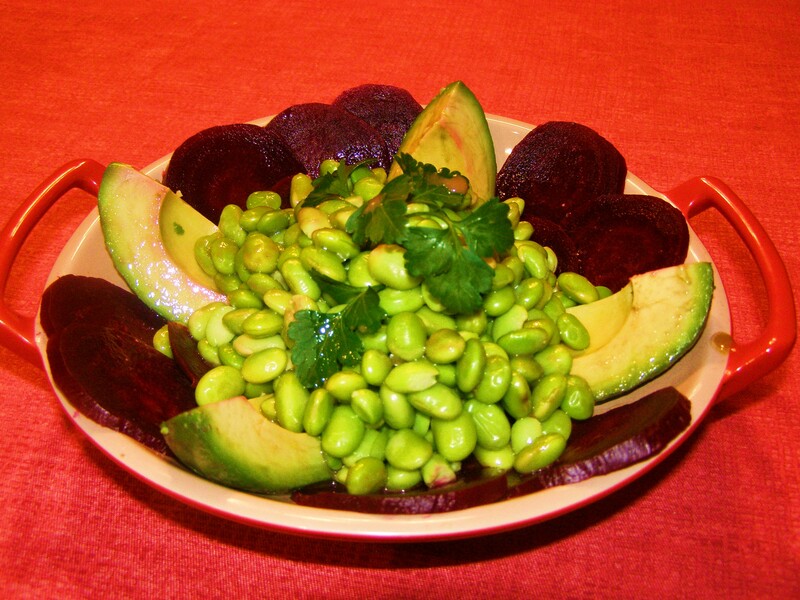 The salad was made with 1 avocado, 1 cup of beets (cooked, peeled and sliced), 2 cups Edamame (cooked) and vinaigrette dressing with two chopped green onions. To illustrate, I punched in the ingredients of this salad for two and for fun you can calculate that it has 280 calories per person (without dressing), 48% of your recommended daily fiber and 18% of your iron . It is not heart shaped nor red but I think that plate could make a very successful Valentine’s day dinner if you are lucky enough to celebrate. Fresh sable fish, sometimes called black cod, has just arrived to Vancouver Island and it is a great treat, nothing to do with cod. Its flakes are moist and tender, far superior to the halibut’s, and its flavour is one of the best in the Pacific ocean. The pesto is made in the food processor with 1/4 cup parsley, 1/4 cup cilantro, 1/2 cup cooked spinach, 1/2 cup fresh organic BC hazelnuts, 1/4 cup cider vinegar, 1/2 cup cream, 1/2 cup water. It is heated up on low. The pasta is black as it is dyed naturally with cuttlefish ink also called sepia. It is just cooked al dente in abundant salted water. The hedgehogs mushrooms were picked near Victoria between snow patches in the woods and they are sauteed in butter with a diced clove of garlic added towards the end. 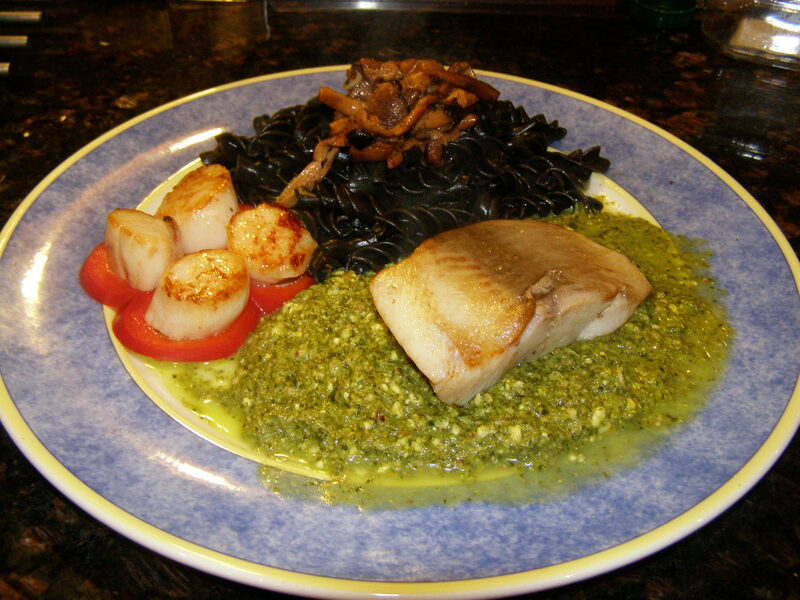 The sable fish and scallops were cooked in a frying pan with olive oil on high for a short time. The fish skin is very crispy and delicious once browned so leave it on for sure. Serve with Champagne, of course! There is a good idea for a quickly prepared impromptu lunch. 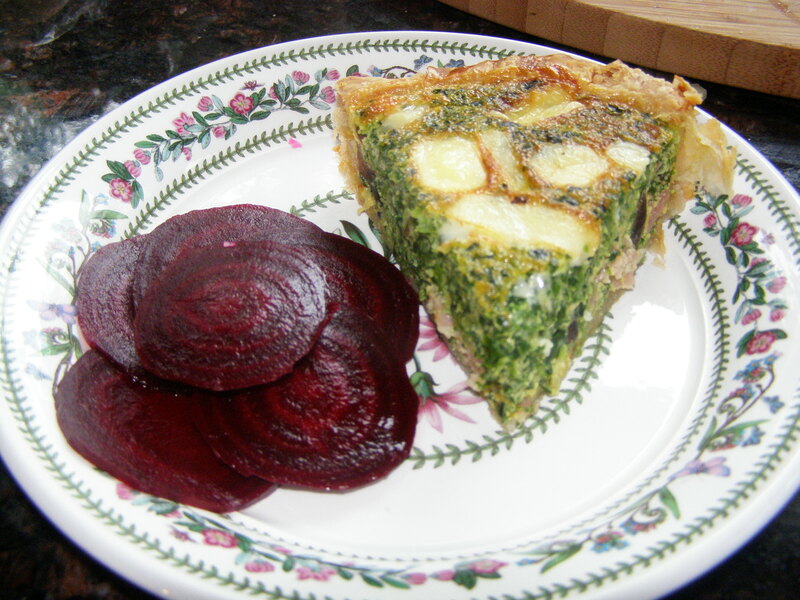 Pretty much your regular “quiche lorraine” recipe with added spinach. We had that today with a fresh beet salad on the side. It was a perfect winter lunch. For one pie crust, I cooked 4 slices of bacon cut in small bits in a frying pan with four sliced white mushrooms and a quarter of a chopped large onion for about 5 minutes. This I mixed with 5 eggs beaten with 1/4 cup cream (or homo milk). I added one package of frozen spinach ( about the equivalent of a fresh bunch) salt and pepper. 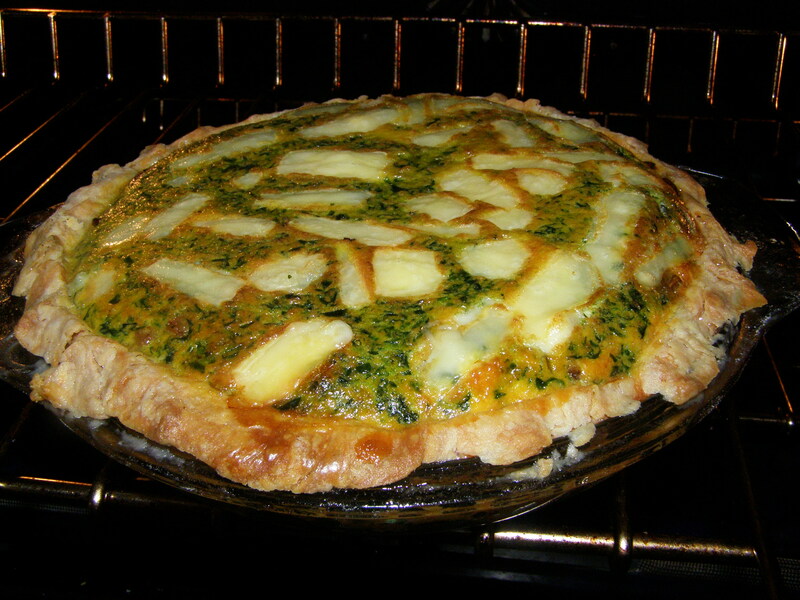 Mix well, pour into the pie shell, add small slices of cheese on top, raclette cheese today. Bake at 350 for 40 minutes. Turn off and serve 5 minutes later. I served it with sliced beets sprinkled with balsamic vinegar and truffle oil. It all started at For Good Measure, my local bulk store and a great place. I bought two cups of dried fava bean, because of a sudden craving for bean salad. 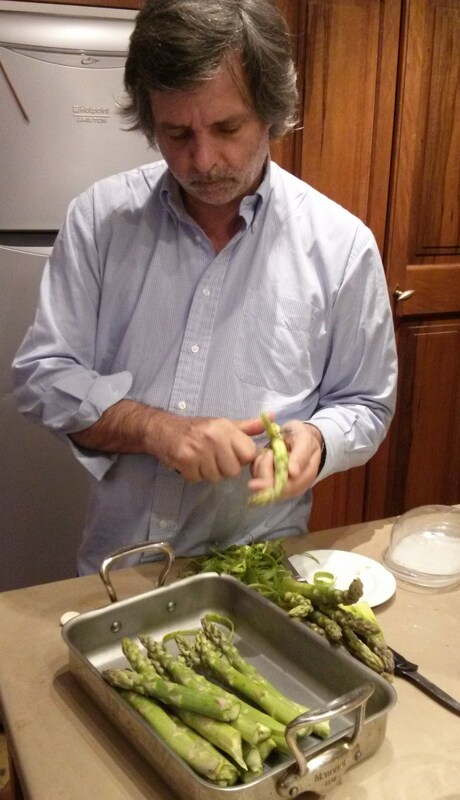 I was very careful with the fava beans as they should look their best for a salad, but things went terribly wrong as I cooked them. Maybe because of the altitude (I was up island at Mt Washington) the beans turned almost immediately mushy when I started cooking them. Small disaster as we had lots of other items on the menu that night. 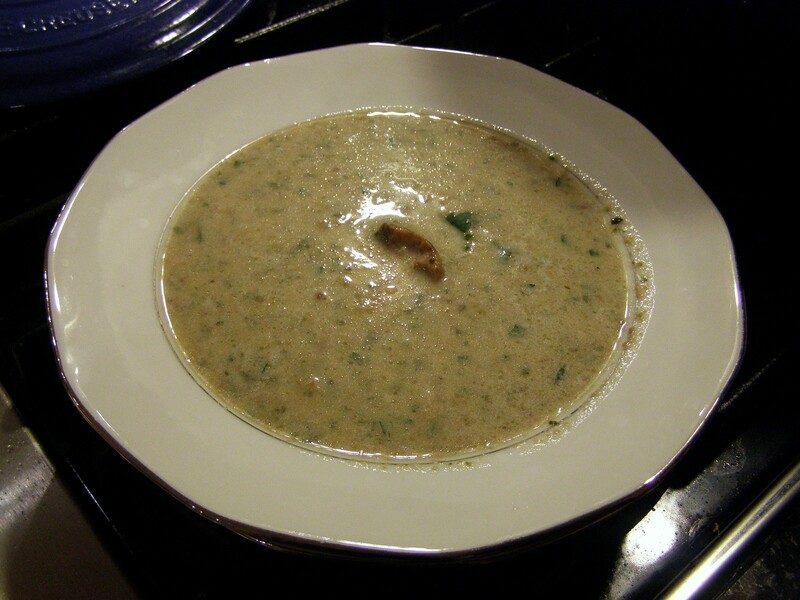 I was left with about two cups of fava puree, not such a bad thing it turned out. Puree two cups of cooked fava beans with 3 tbsps Balsamic, 2 tbsps olive oil, 1/4 cup chopped cilantro, 1/4 tsp seasoning salt, the juice of half a lemon, 3 crushed cloves of garlic, salt and pepper. Cut the top of the peppers, remove the seed and any white parts. It would be best to pick round-shape peppers as my long and narrow ones had a tendency to topple over that I could not control. 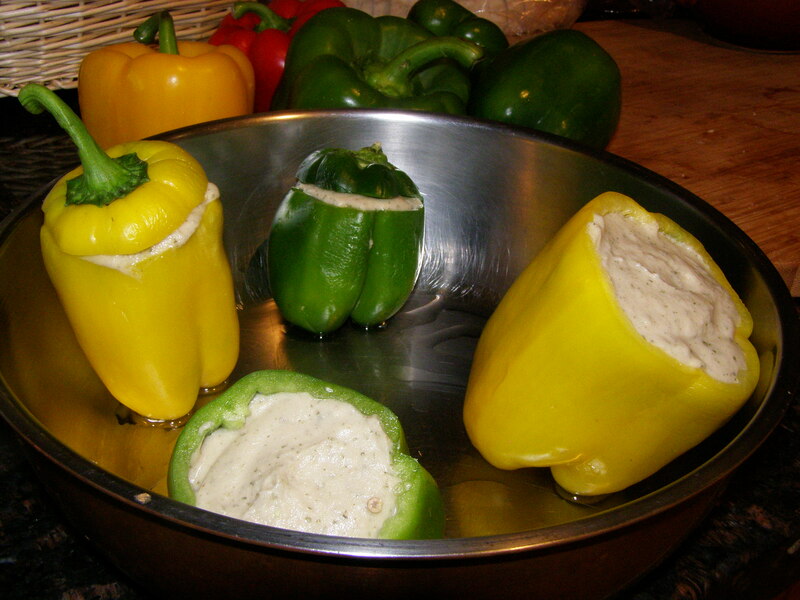 Fill the peppers with the spread, cover with the tops and roast at 325/350 for 30 minutes. 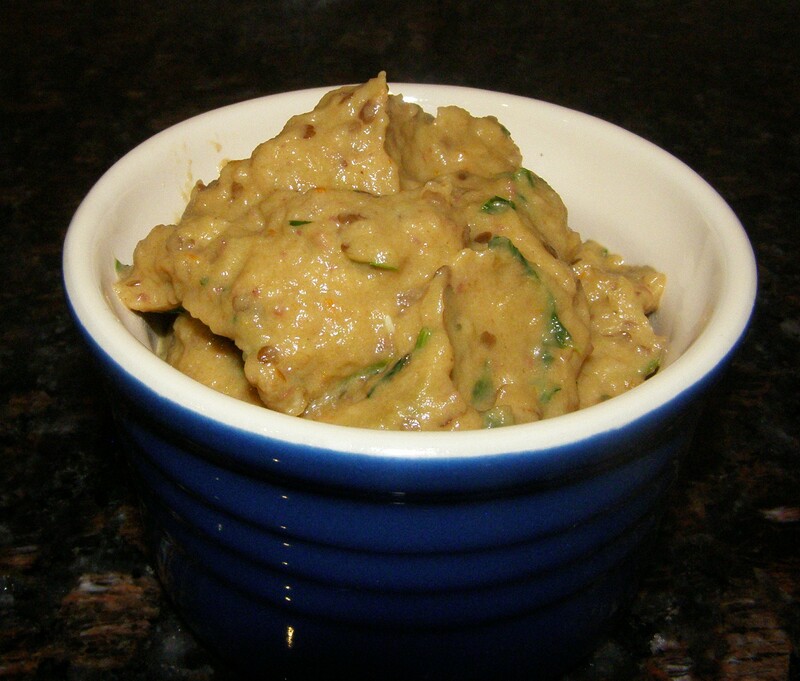 Although very nourishing, the fava bean is a very fluffy and light stuffing. If you are using canned beans, make sure to rinse them thoroughly. I was using dried beans. 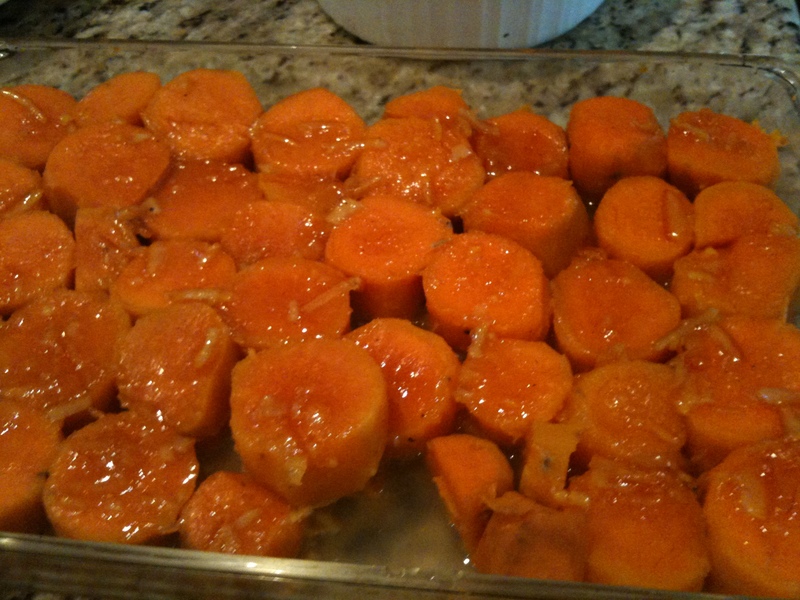 First, they have to be rinsed well and soaked overnight in lots of water. 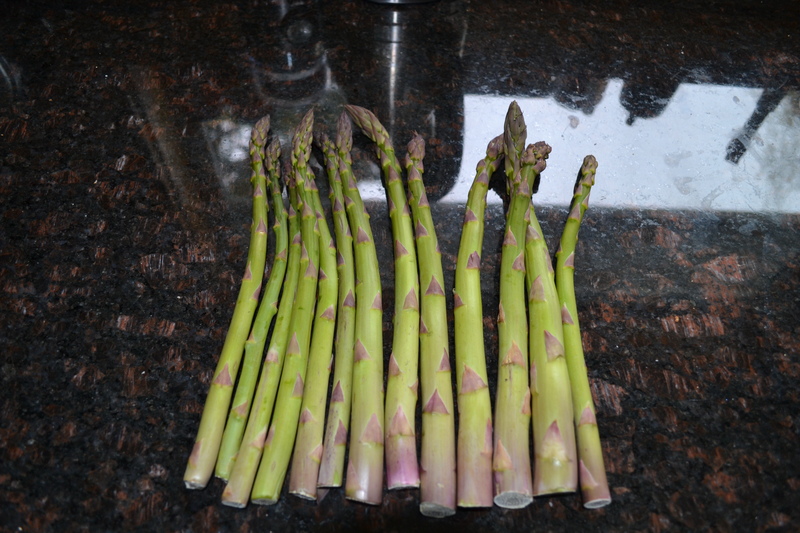 Then, they need to be peeled and rinsed again. The beans that float should be thrown out. The beans are boiled gently in water for about 30 minutes and drained and rinsed again. 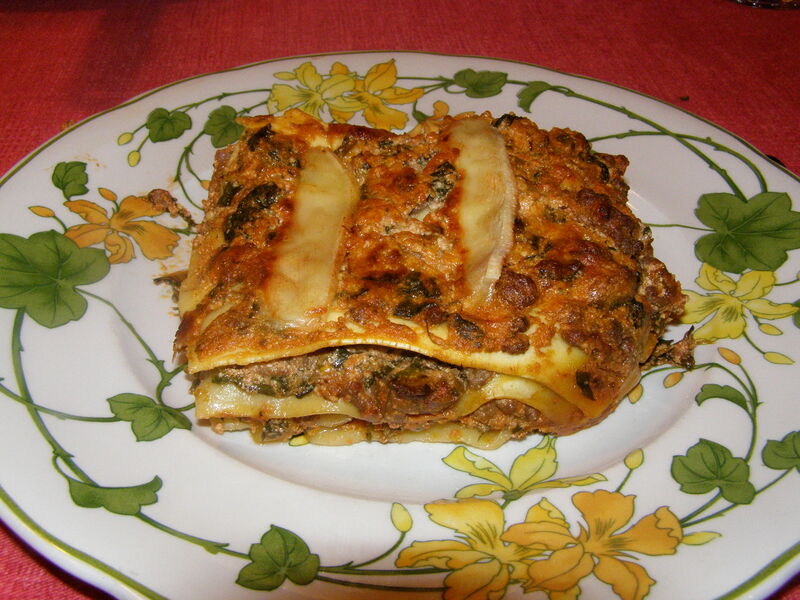 Home-made lasagna is just enough work that you feel rewarded for serving a healthy home-made dish without incurring too much trouble, especially with the ready to bake pasta now available at all grocery stores. This is the point of this recipe, not too many pots, not a lot of fussing. ( 1 frying pan, 1 baking dish, 1 bowl). First, the frying pan : Brown half a kilo of lean ground beef with one chopped onion or 5 green onions, and 3 tbsp olive oil, one tsp thyme, one tsp oregano for about 5 minutes. The bowl: beat one egg with 1/2 cup cream, 1 tsp salt, pepper. Add one 400 gr. 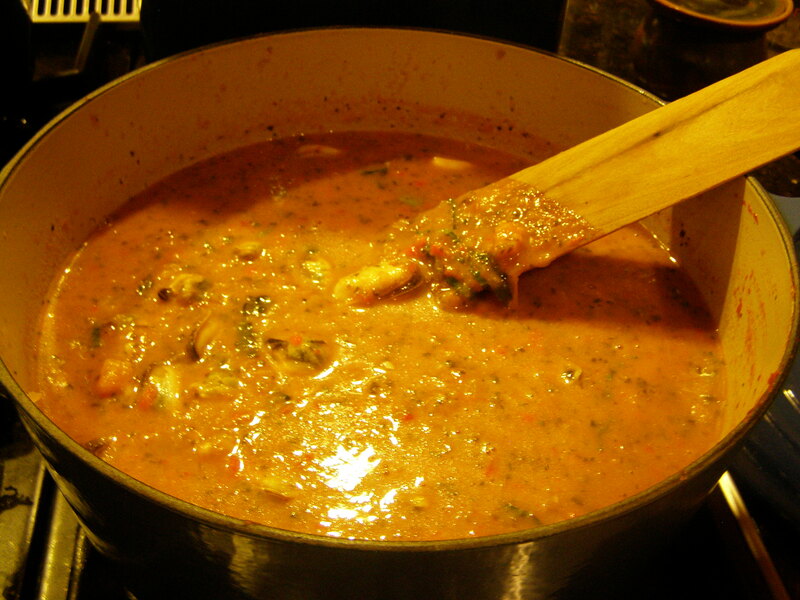 tub of Ricotta cheese, one package of frozen chopped spinach thawed but not drained, one chopped yellow pepper, 12 black olives pitted and cut in quarters, 1/4 cup chopped parsley, 2 crushed garlic cloves, 1 can of tomato paste, 1/2 cup water, one cup of grated Mozzarella, the content of the frying pan. 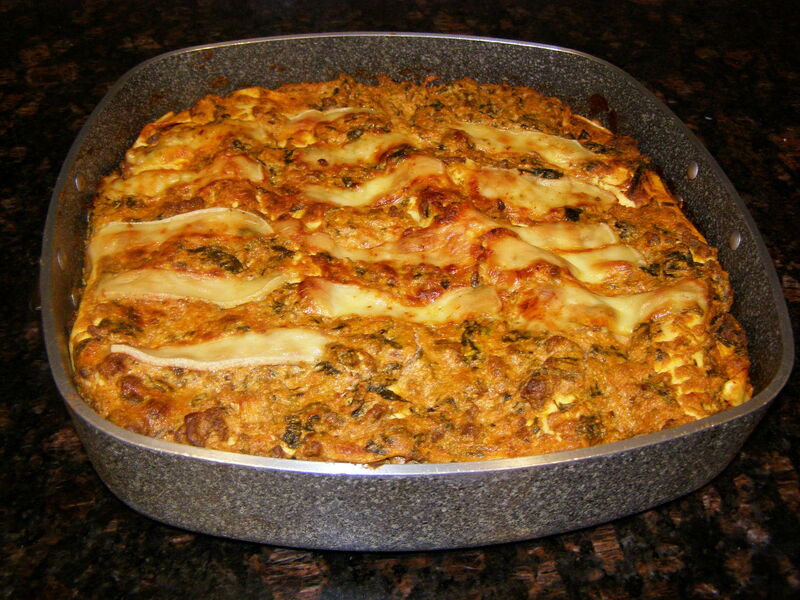 The baking dish: rub two tbsps olive oil on the bottom, add a layer from the bowl (1/4 of the content), cover with the lasagna sheets, (cut and paste to fit the dish). And so on until you have four layers of pasta. 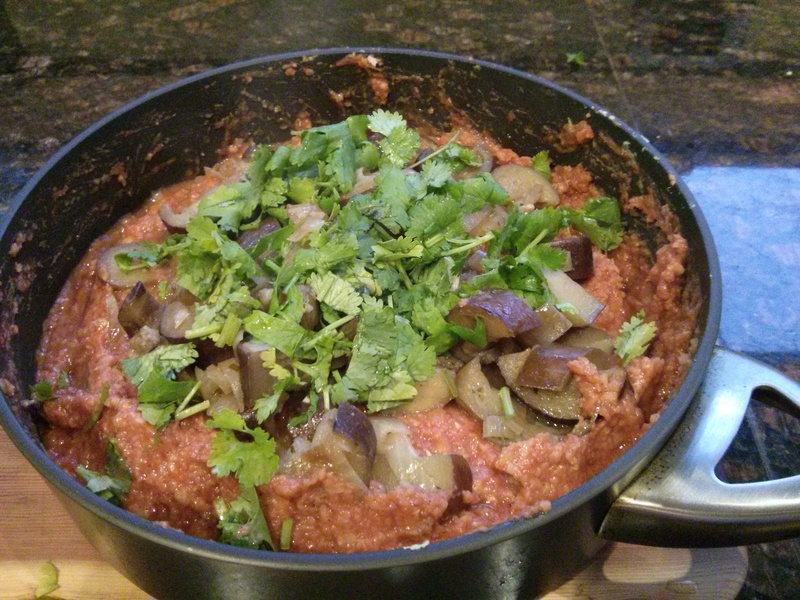 Cover with one can of crushed tomatoes (398ml) and 1/2 cup grated parmesan cheese. 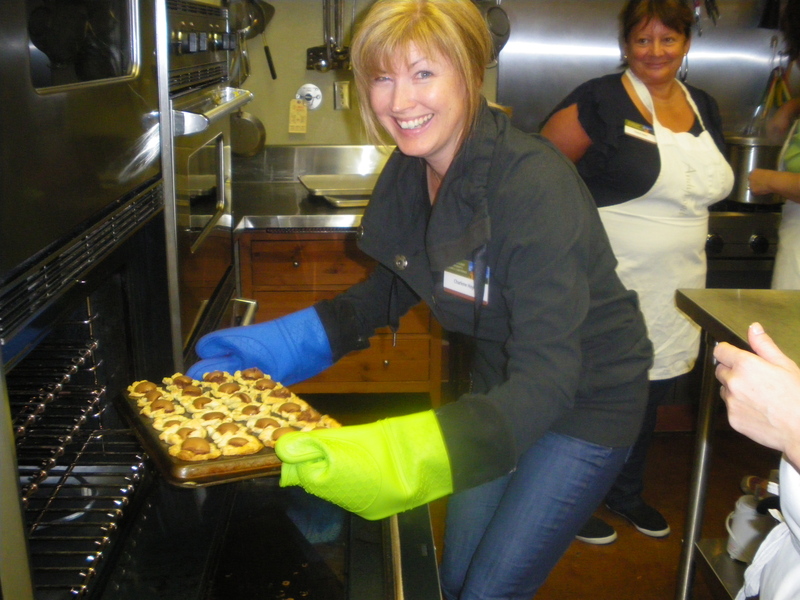 Bake for 45 minutes at 350 uncovered. After 35 minutes, if necessary, adjust oven temperature and amount of liquid to obtain a moist dish with a nicely brown topping. When achieved, stop the oven and let rest on the rack for 10 minutes. 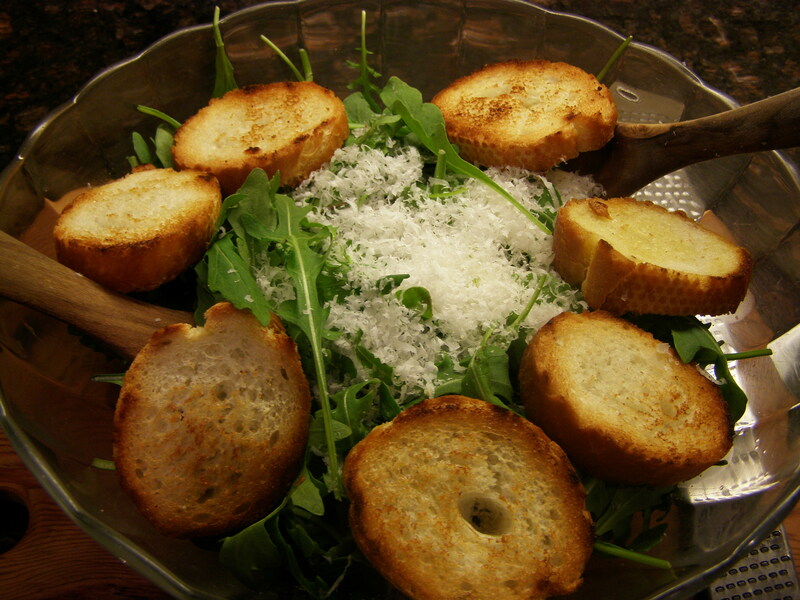 Serve with green salad and garlic bread! 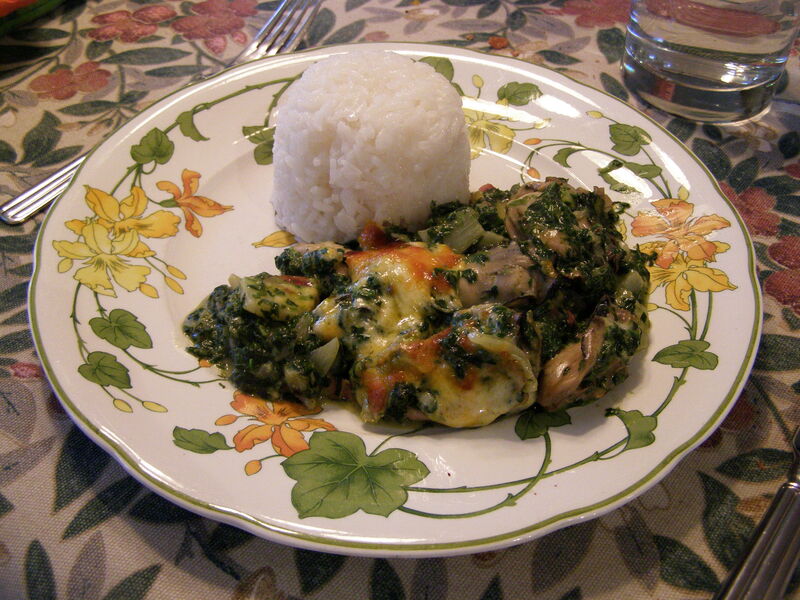 Today, I used fresh spinach, one large bunch blanched and chopped, two inches cut off the stems. ( I know, one more pot to rinse!) And I had some Raclette cheese that I cut up in strips to decorate the top layer. That was very tasty. Serves 4 to 6. This is a really nutritious green vegetable and unlike kale, rapini and collard green, it is tender, exquisite and quick to prepare. 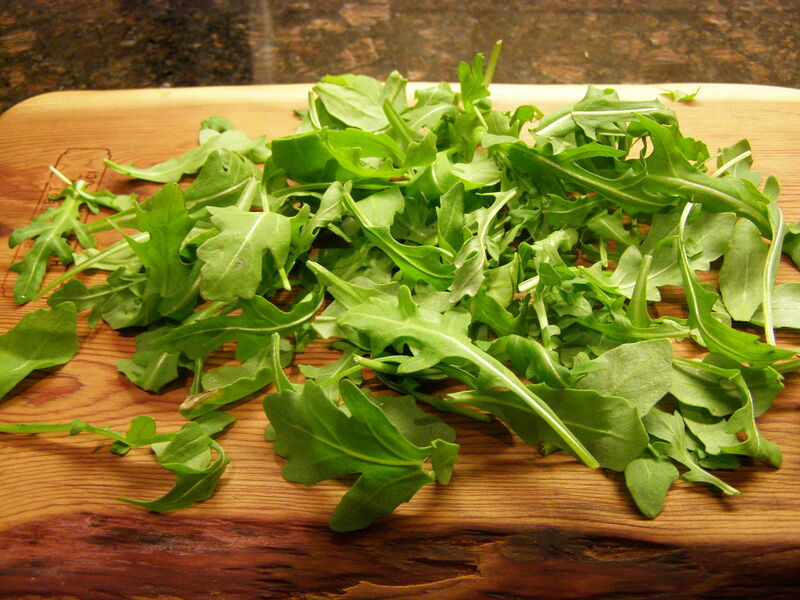 The green is not really Swiss, it was just called that originally to distinguish it from French Spinach. Not a very good explanation as chard, actually a member of the beet family, grows well in all Mediterranean countries. 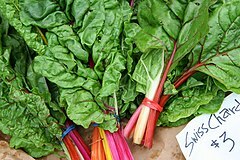 The fact that chard belongs to the beet family, a root vegetable, might explain why my grand-mother would cook only the white stems and give the greens to the chicken. I certainly would not do that, mind you I don’t have chickens. 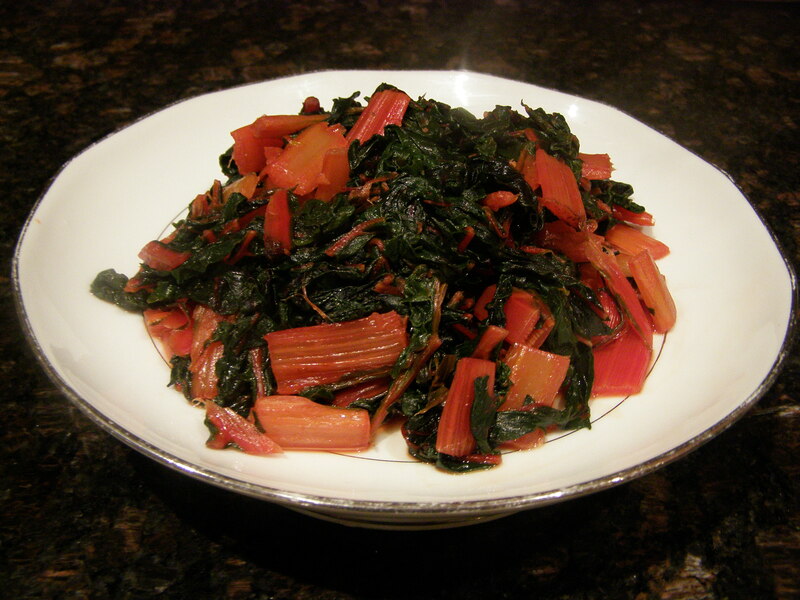 The chard I buy at the Root Cellar is , although very fresh, quite mature and the stems are a bit hard. I therefore separate the greens, and cut the stems (especially the red ones) in 2 inch pieces to boil about 5 minutes in a little salt water. When the water has evaporated, I add two crushed cloves of garlic and a good size chunk of butter and sauté this with the greens for another 7-10 minutes. Don’t overcook! No need to add anything else, the flavour is delicate but perfect without other spices. Tonight I served this with a roast chicken, left-over gratin dauphinois and sauteed Hedgehog mushrooms we picked yesterday (yes Jan 15th) in between snow patches in woods close to Victoria.